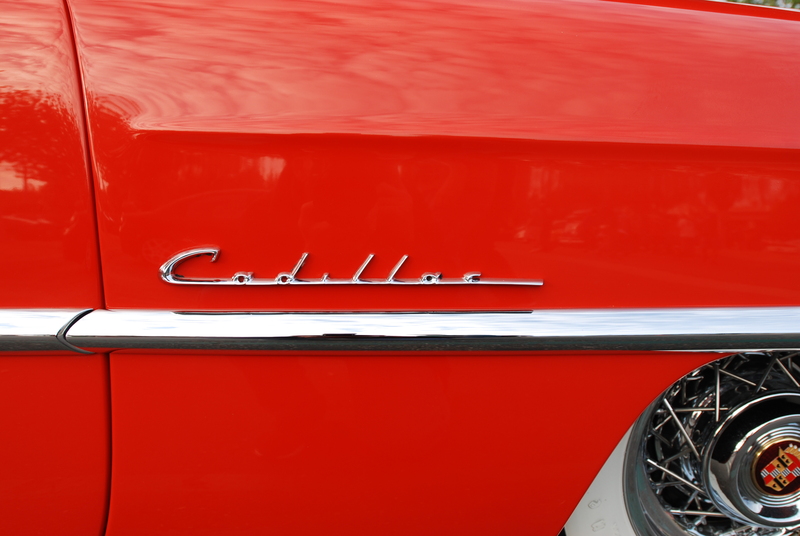 With life and work placing an ever-increasing demand upon my spare time, I’ve found myself with less time to devote to my blog. 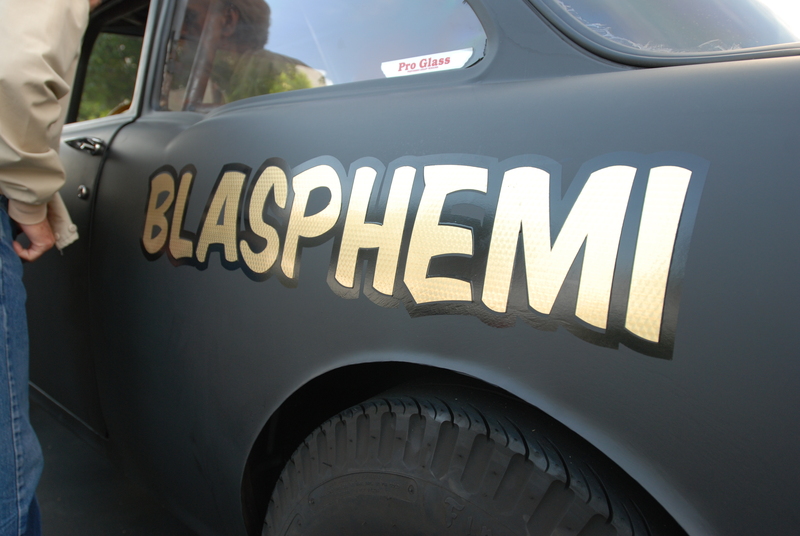 So in an effort to continue providing content to those of you who have been kind enough to become followers and /or subscribers of my blog, I will be altering my format slightly. 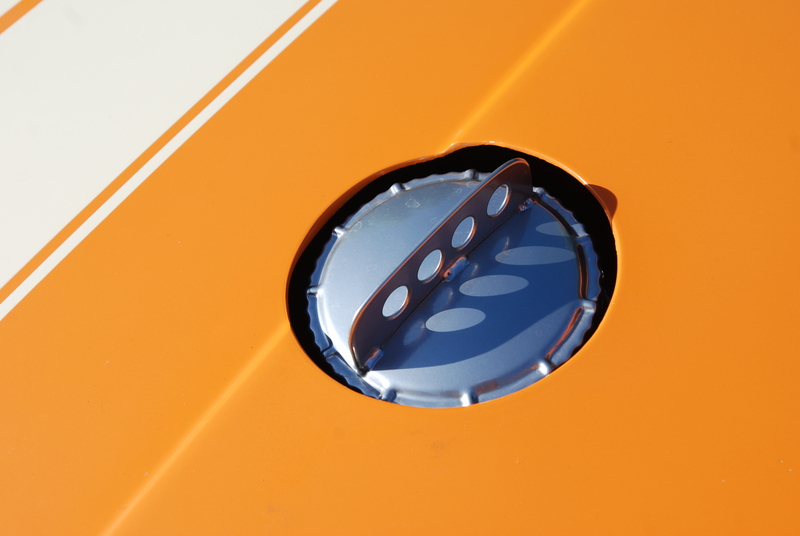 These changes should get me back on track to providing a greater frequency of blog posts. 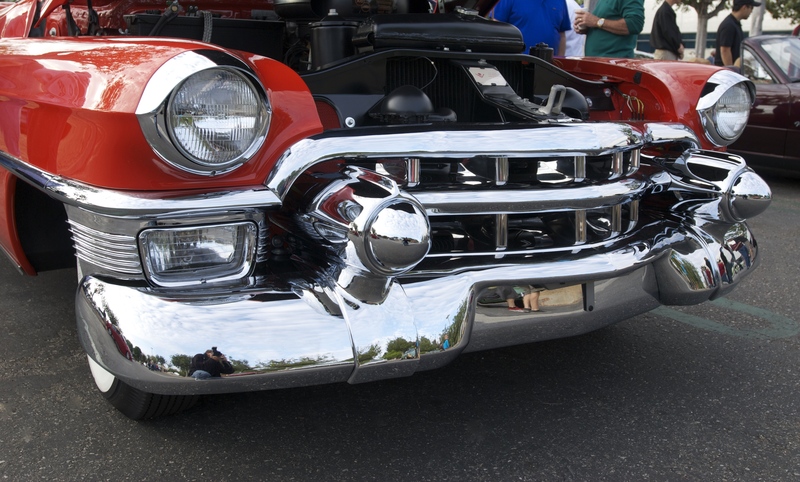 In previous posts I’ve written about how external influences can affect one’s photographic inspiration, be it from weather, temperature, lighting, a particular event or even participation in a weekend car show. 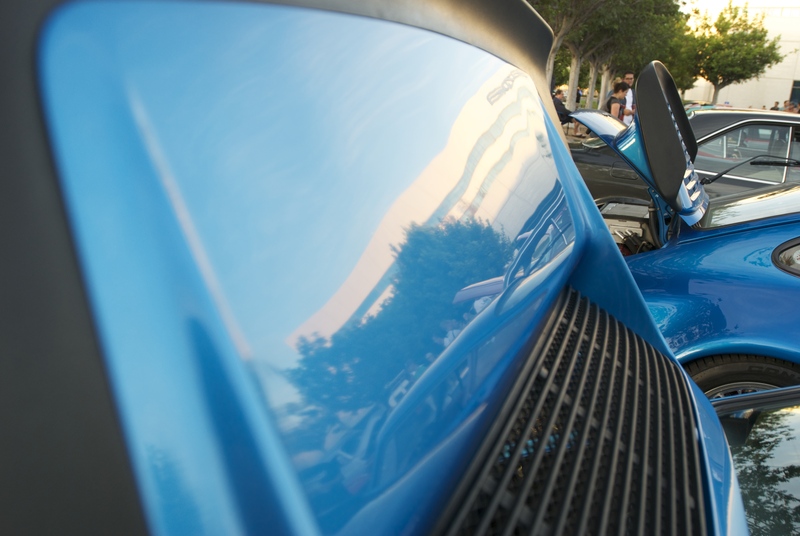 In many cases the experience, as well as the perceptions during an event can blur. 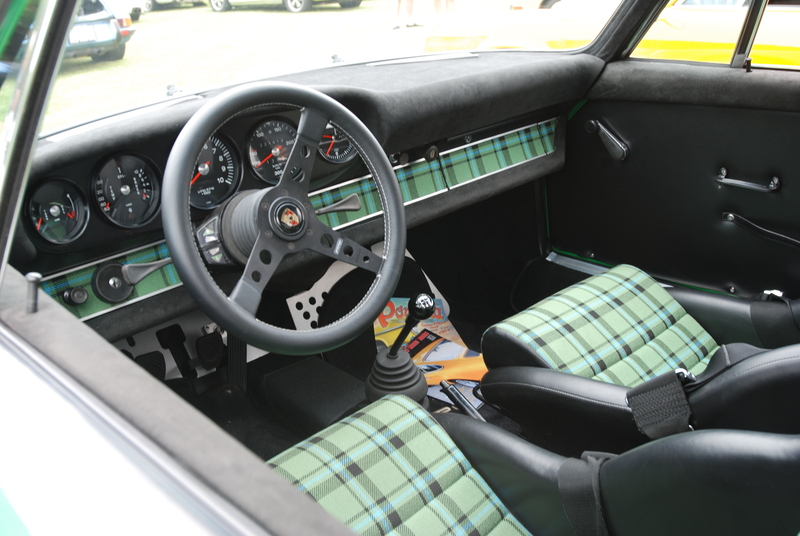 It’s only when uploading the imagery onto the computer and beginning my post production work, that these patterns and the influences become apparent. 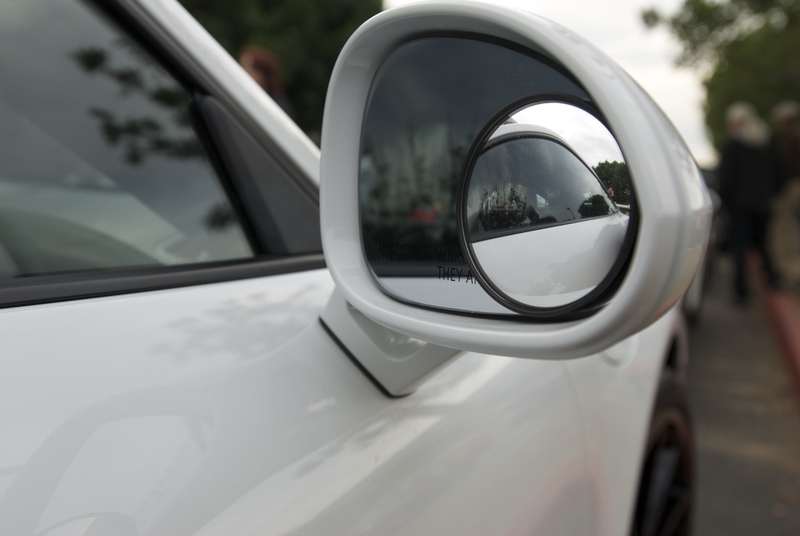 Over the past several months, I’ve experienced this phenomenon multiple times, and the following digital snippets represent the end results of my photographic observations. 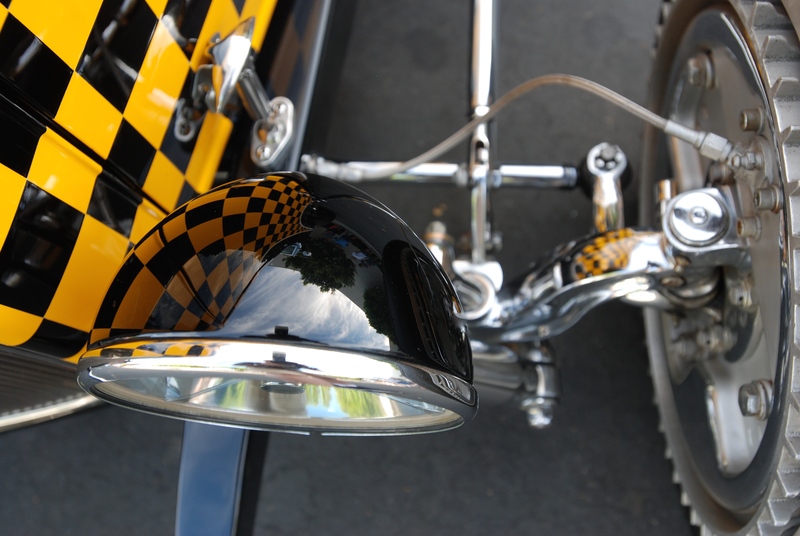 Hopefully, my first experiment has not been a total train wreck, and to my kind followers / subscribers, you have found these images to be worthy of your time. 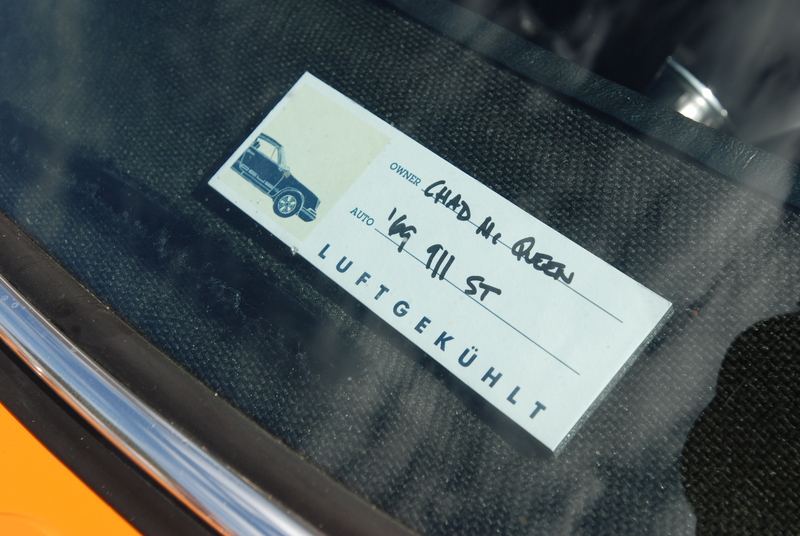 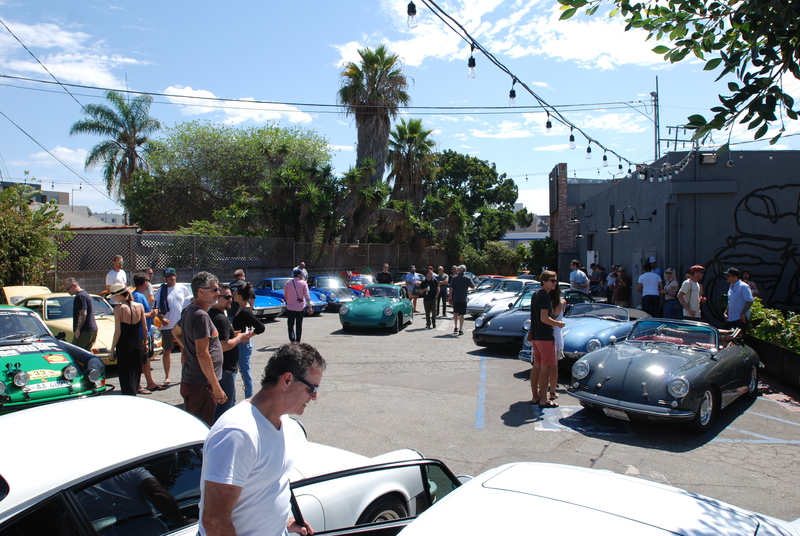 As the sign outside Deus Ex Machina stated, Sunday September 7 was to be the site for Luftgekuhlt, which loosely translated, implies a celebration of air-cooled cars, and as stated on this morning,”Porsches”. 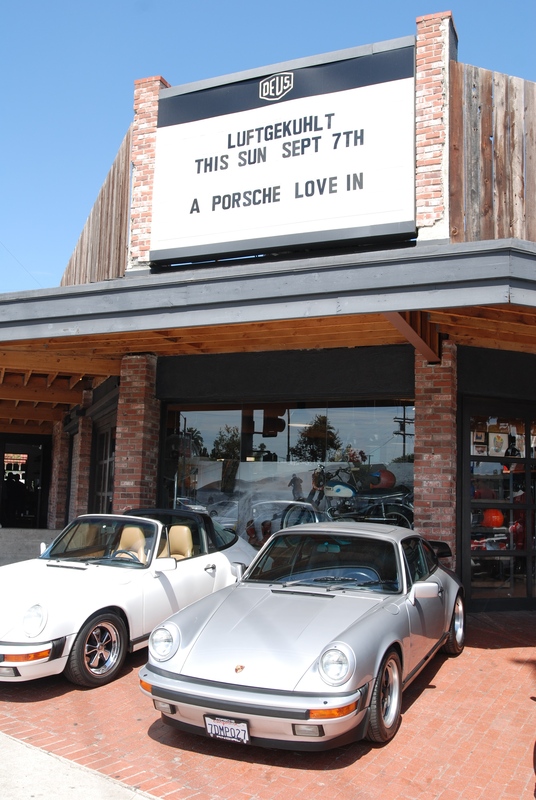 Not unlike the sign sent to Paul Revere many years ago, but in this case a signal sent out to rally the Porsche community. 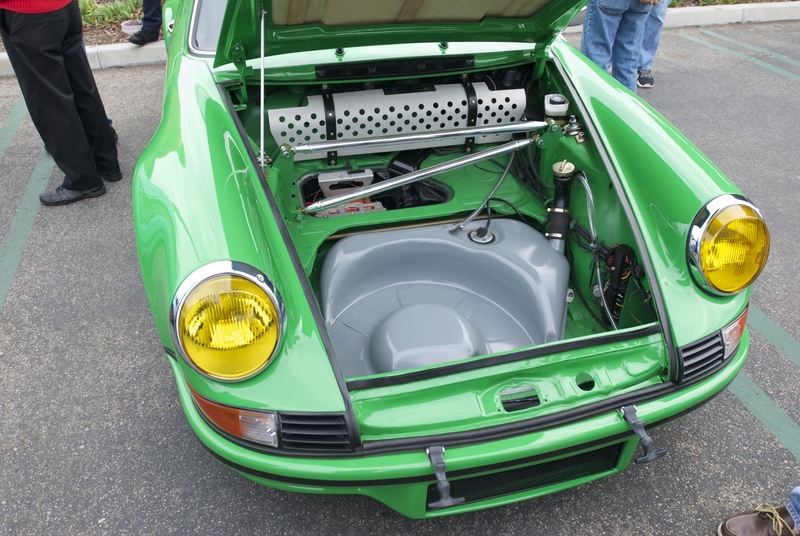 and supplemented by an eclectic cross-section of Porsche 911s. 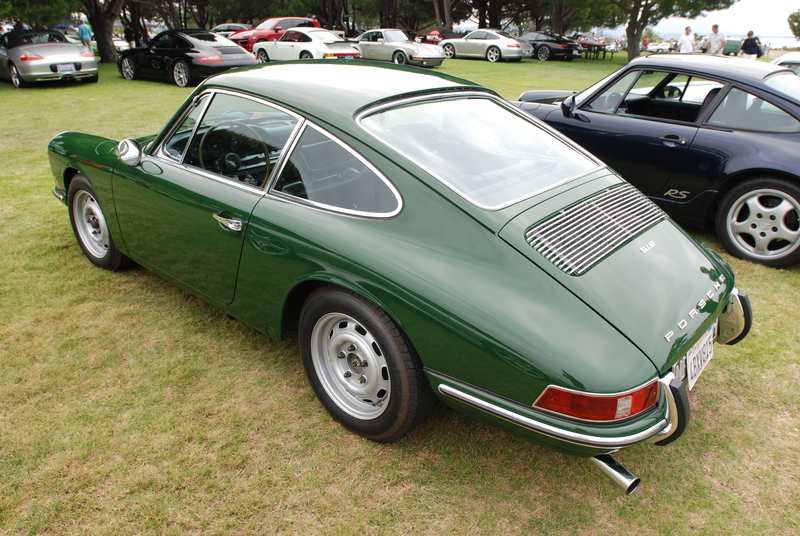 Examples ranged from early 911s (aka Longhoods), represented by an early 1966 911 GT, one 1968 911, a variety of 911S models, and an example of Porsches ultimate 1973 911; the 911 Carrera RS. 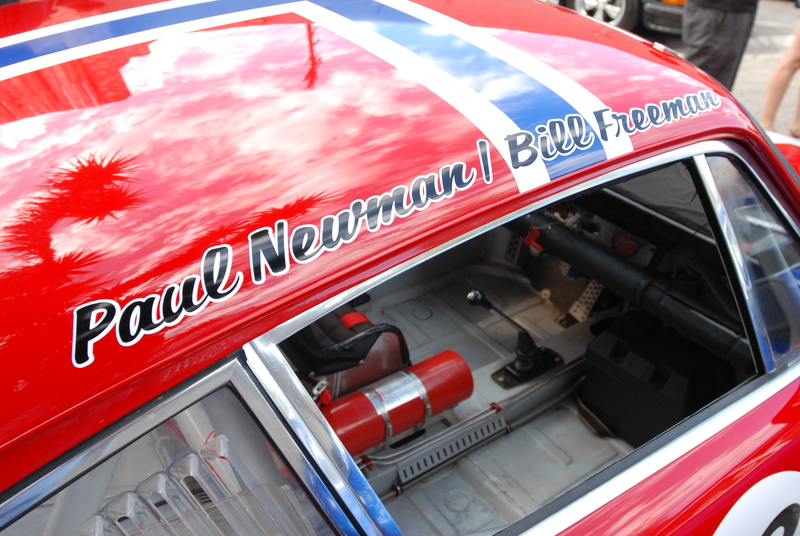 Below, a 1969 911S race car, club raced back in the day by the late Paul Newman and by Bill Freeman. 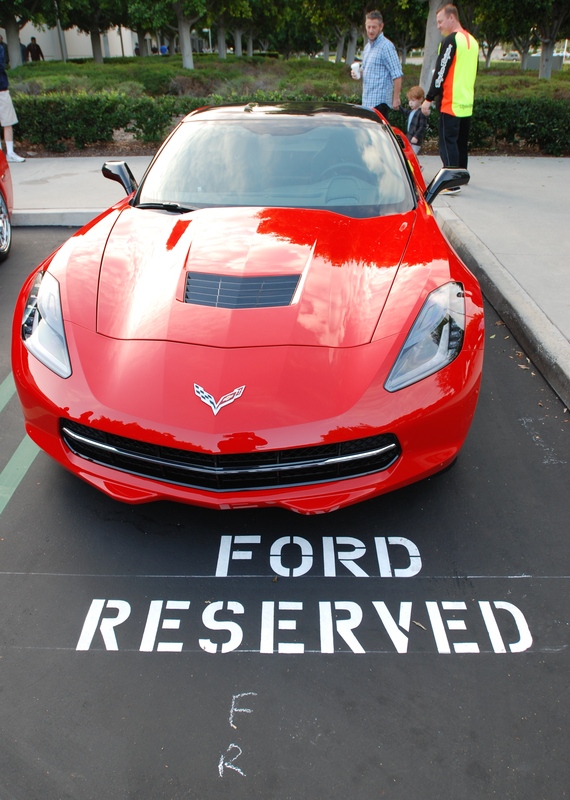 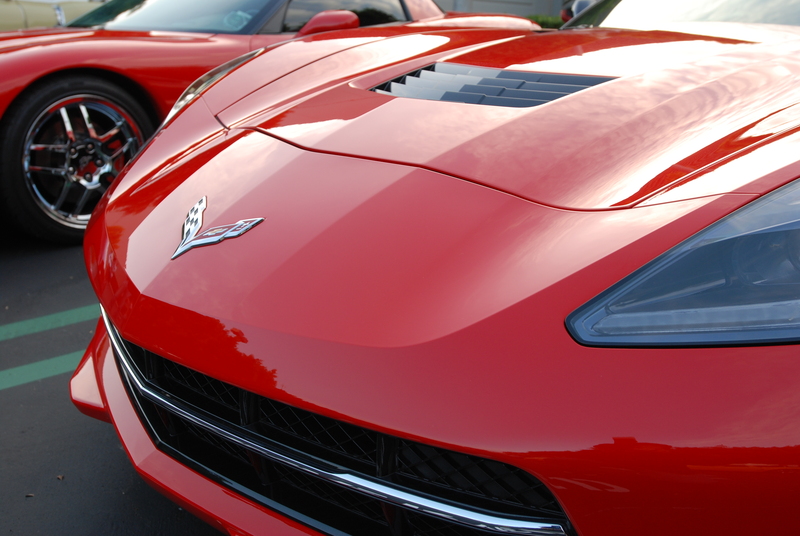 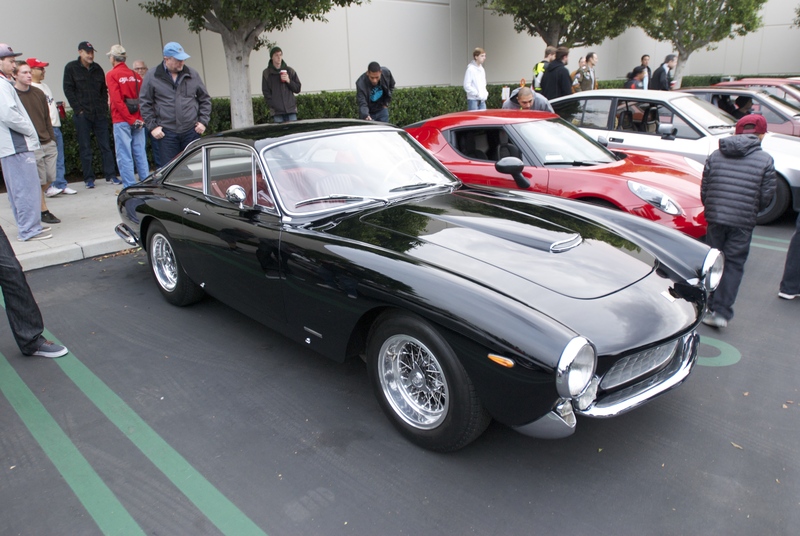 This car represents one of the latest acquisitions by the automotive group TruSpeed, based in Costa Mesa , CA. 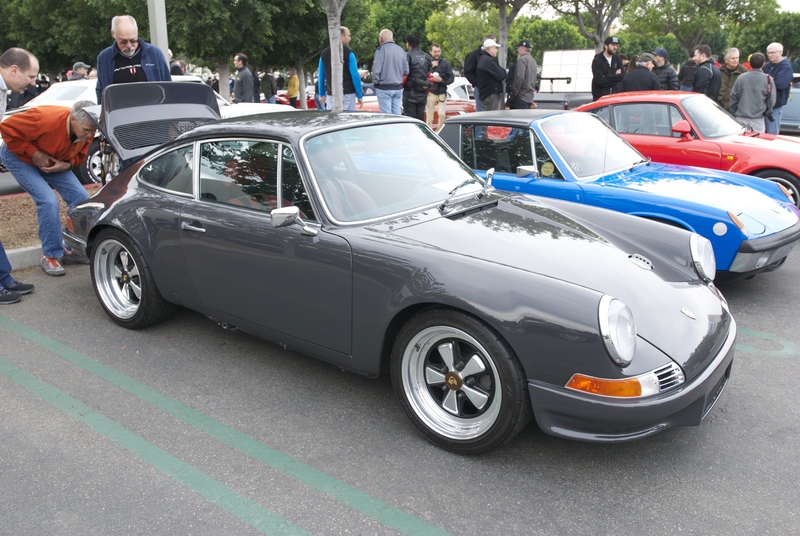 Another of the race inspired RGruppe 911, in this case a 1969 911ST, owned by Chad McQueen, obviously influenced at an early age by his father (the late Steve McQueen), and his collection of Porsches, and their families involvement in racing. 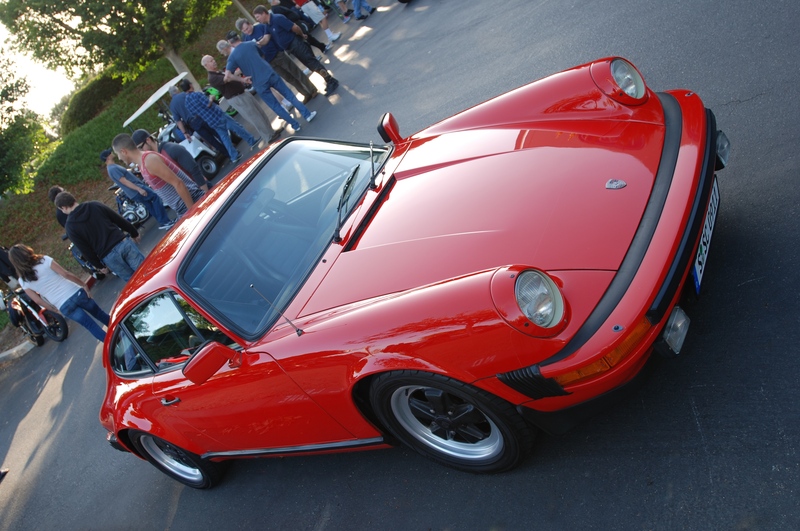 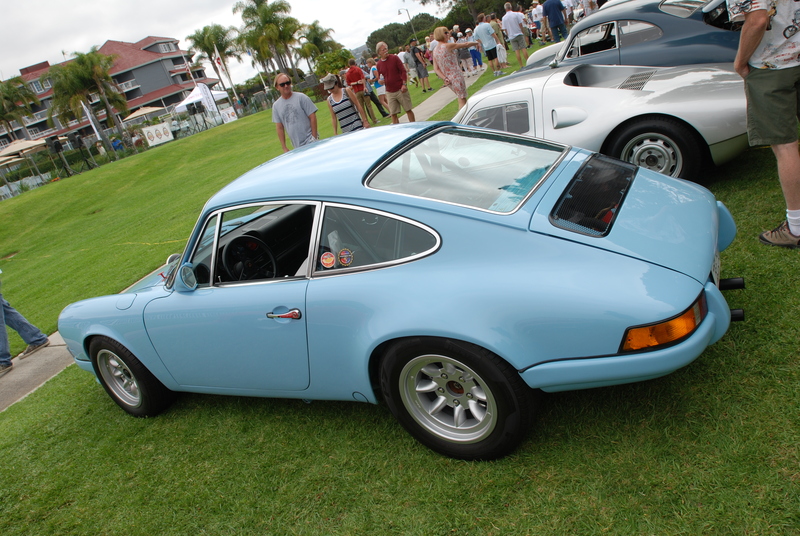 One of the several Porsche 911S models on display, and representing the RGruppe car club. 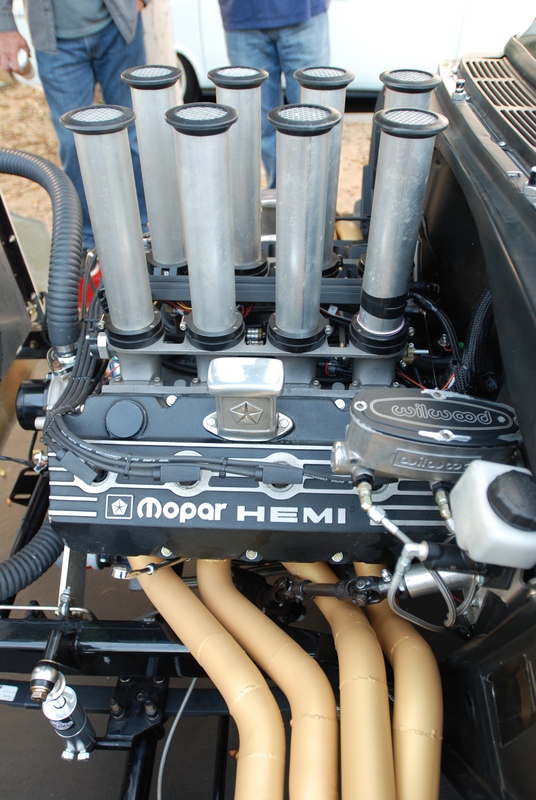 A hint to this motors modifications beyond stock; a twin plug ignition, with its snake nest of 12 spark plug wires. 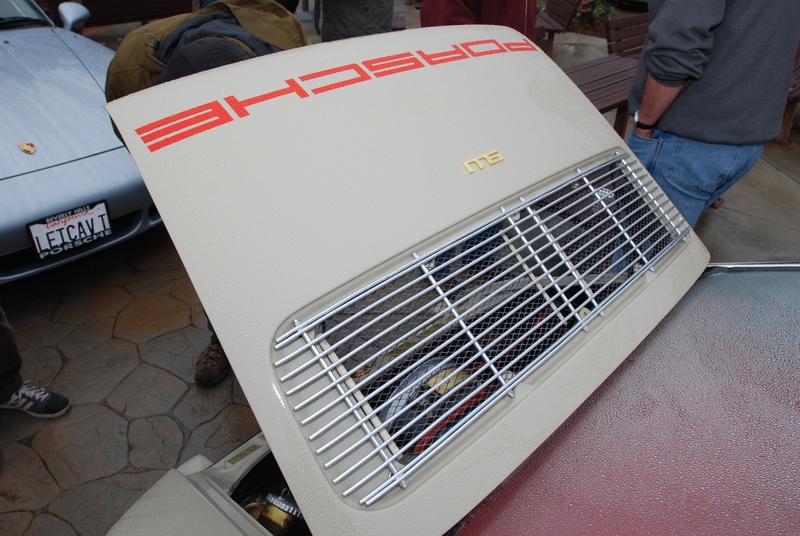 An obvious clue that this is no longer a stock 2.2 liter 911S motor. 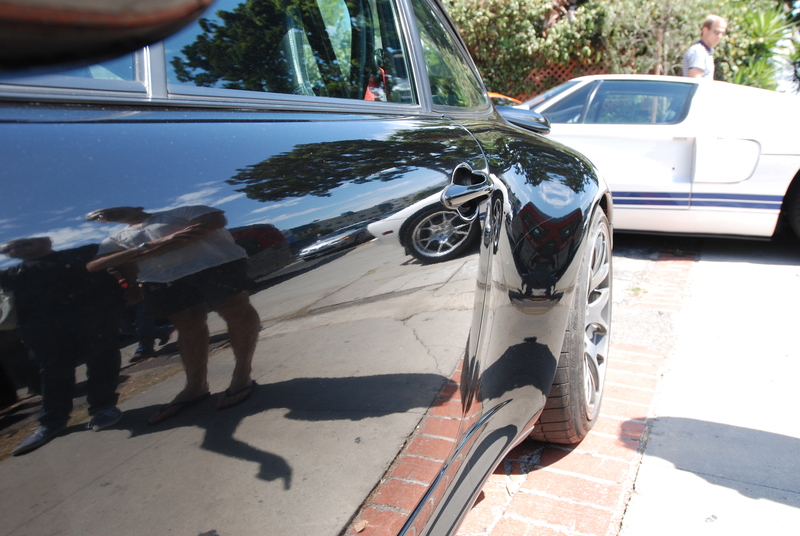 Like begets like; a silver 911S reflected in the fender of the host 911S. 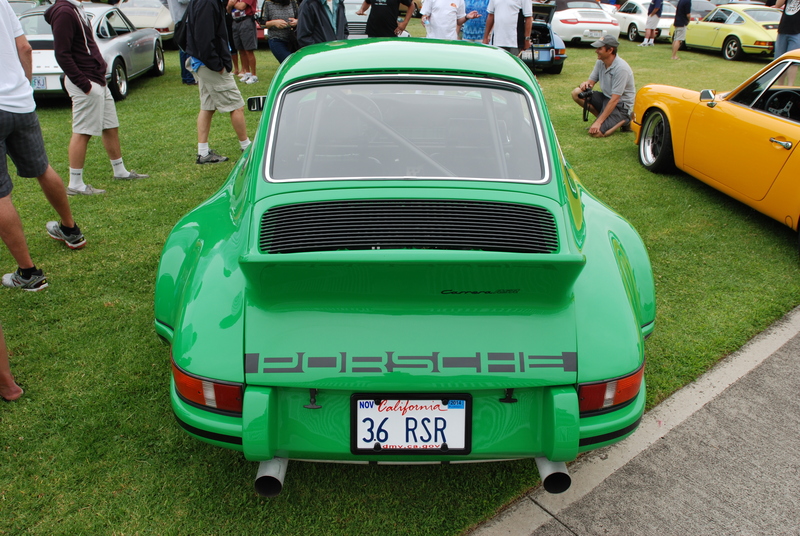 and a model that introduced the world to the brands new duck tail spoiler. 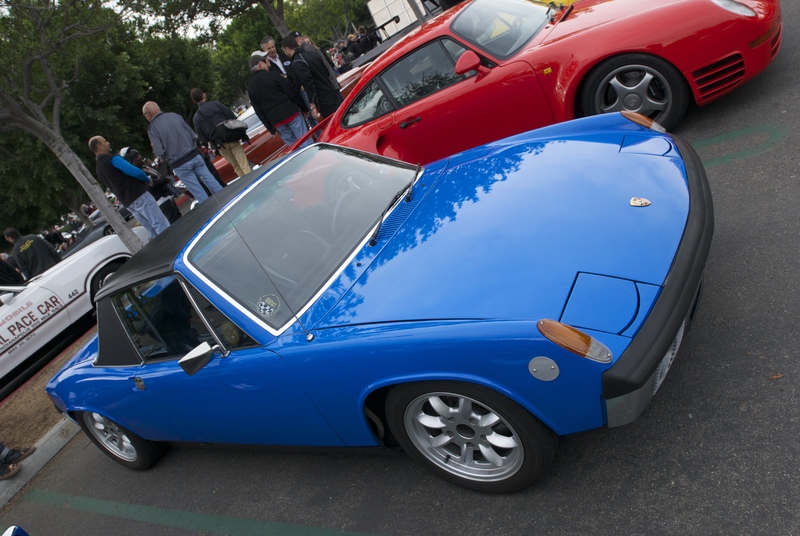 The sole representative from the 914 community was one very cool, blue Porsche 914-6 (below), seen hanging out with a variety of Porsche 911s. 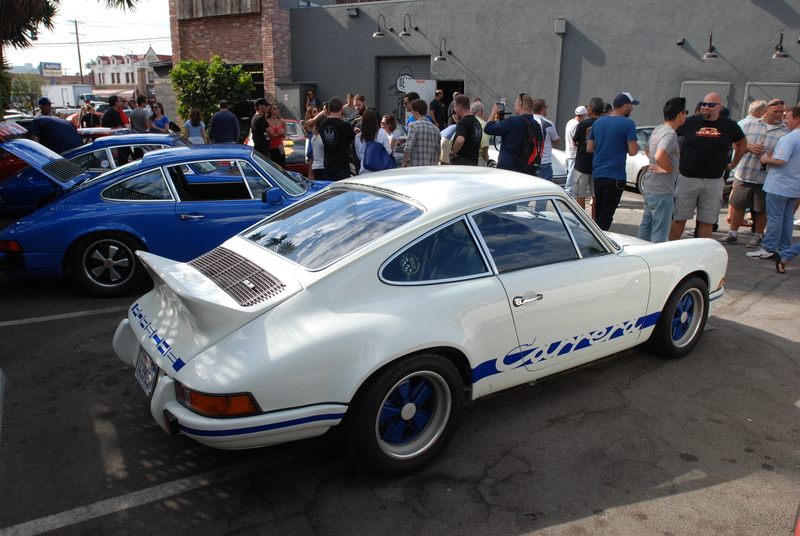 The unintentional Porsche 911 evolution row, from front to back; white 1986 911 Carrera, blue 1979 -1983 911SC, white 993 Turbo and at the opposite end, a white 964 Carrera coupe. 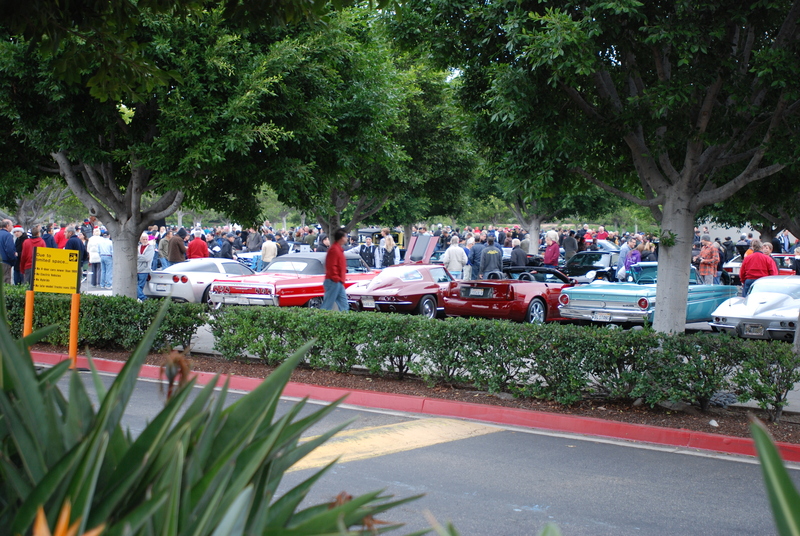 The view of Evolution row from the opposite end (below). 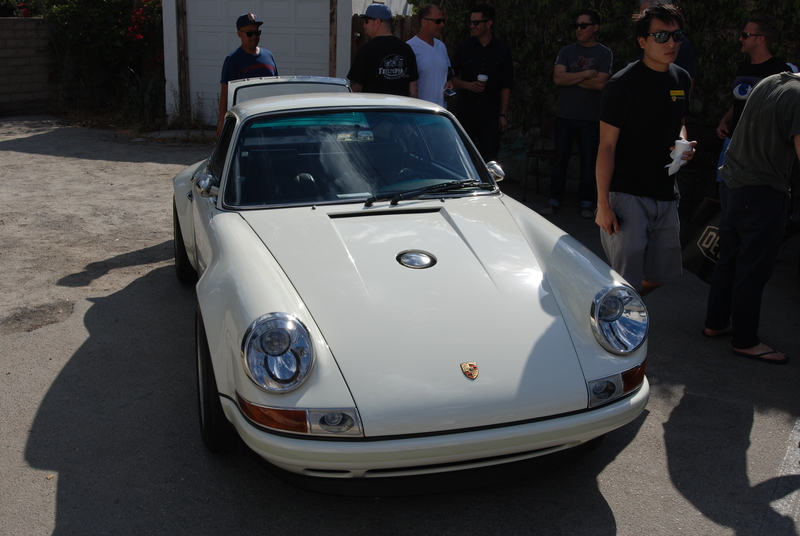 Parked immediately across from Evolution row, and next to a trio of Porsche 911s from Magnus Walker’s collection, was another rare and highly modified Porsche; one of the latest 911 creations in white from the team at Singer Vehicle Design (as seen below). 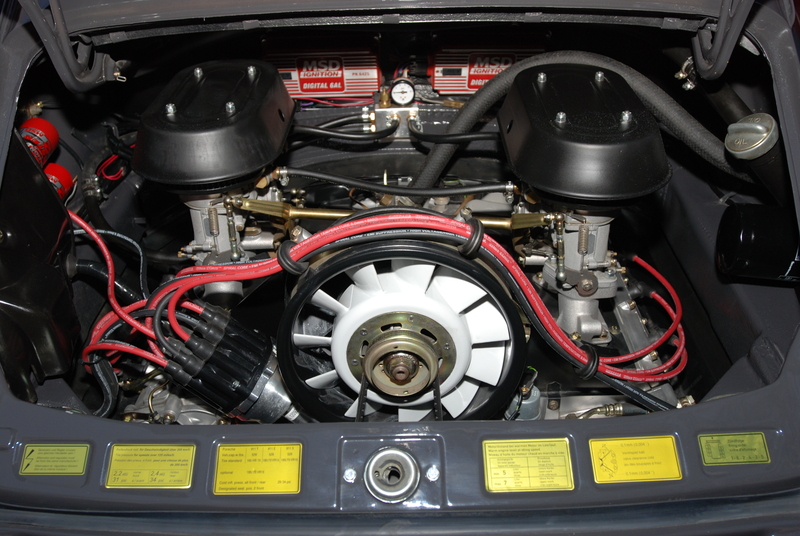 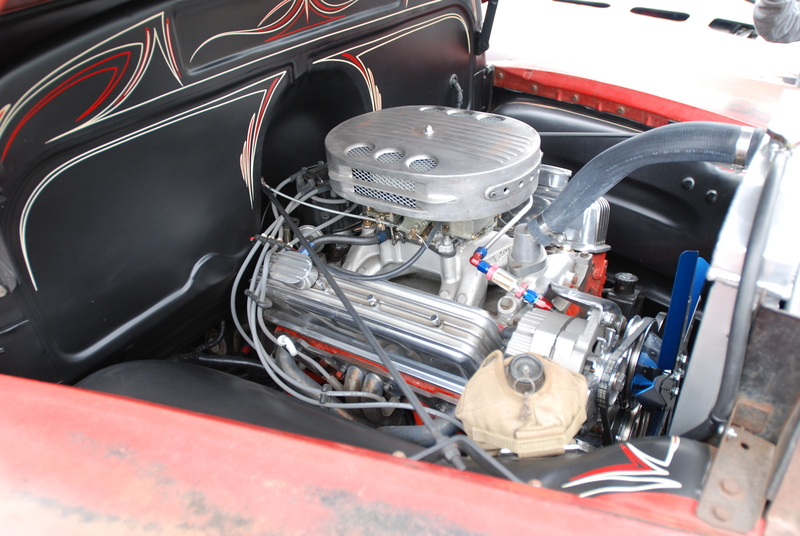 A glimpse of the Singer’s austere engine compartment and its highly modified, purpose-built motor (below). 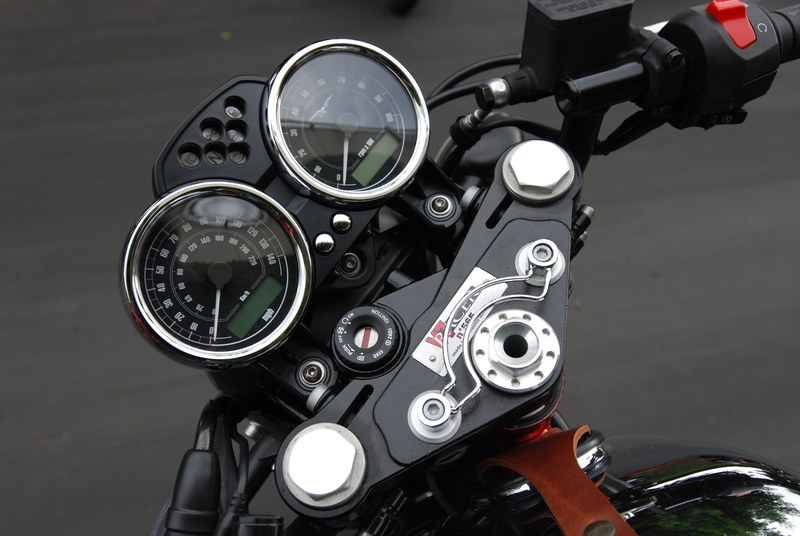 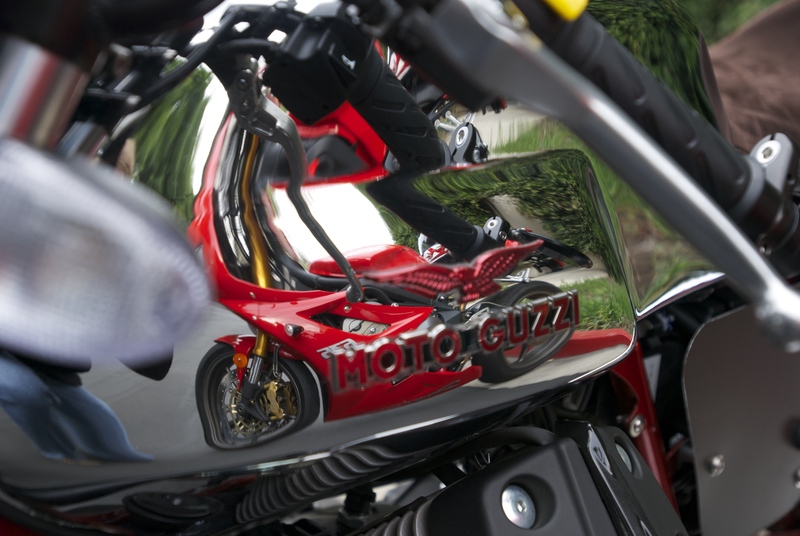 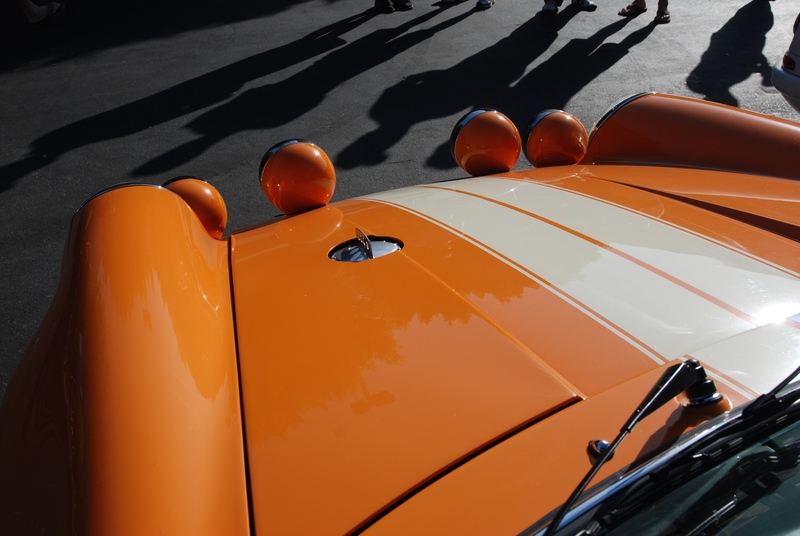 Interesting details and technology abound from any angle. 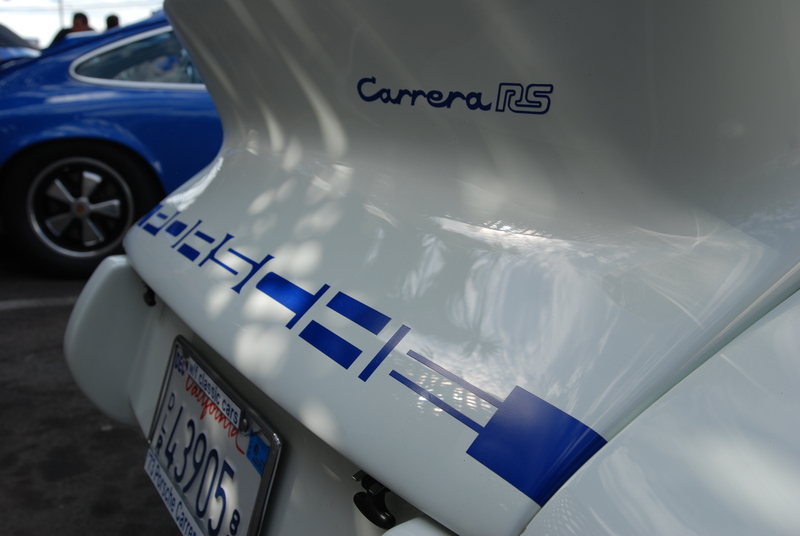 Rear decklid with graphics and Singer badging. 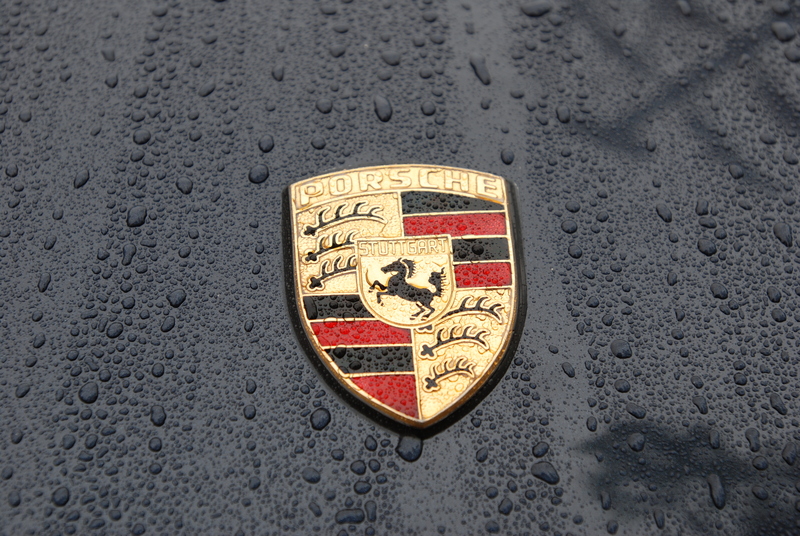 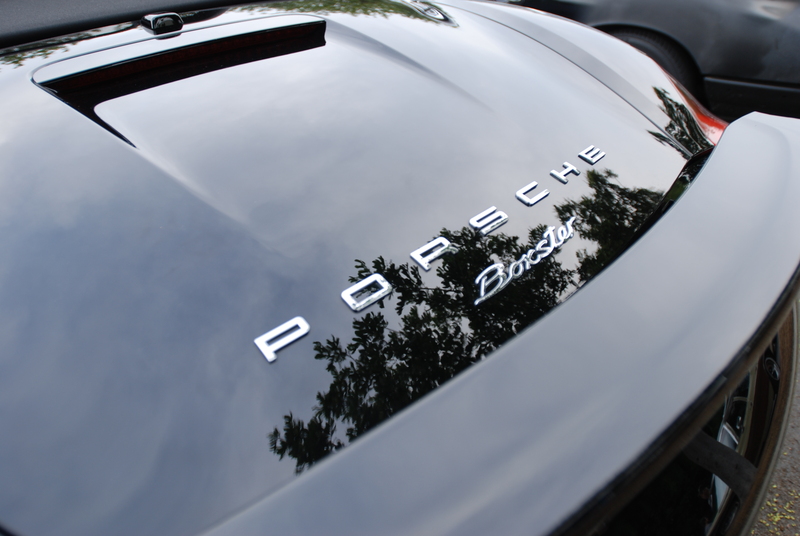 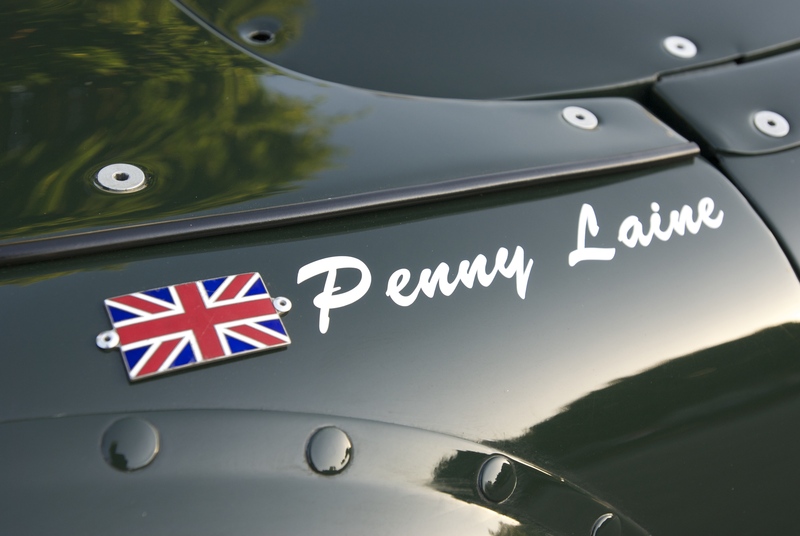 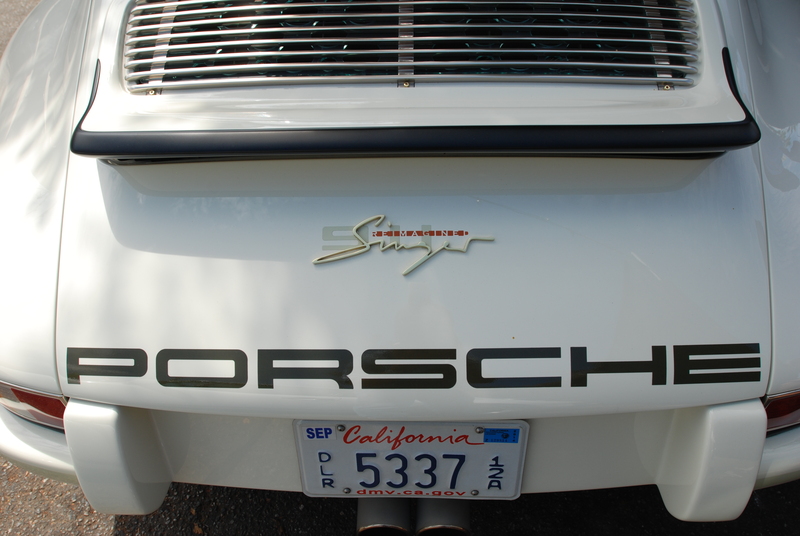 (Below), A close up view of the Singer’s dimensional rear decklid badging. 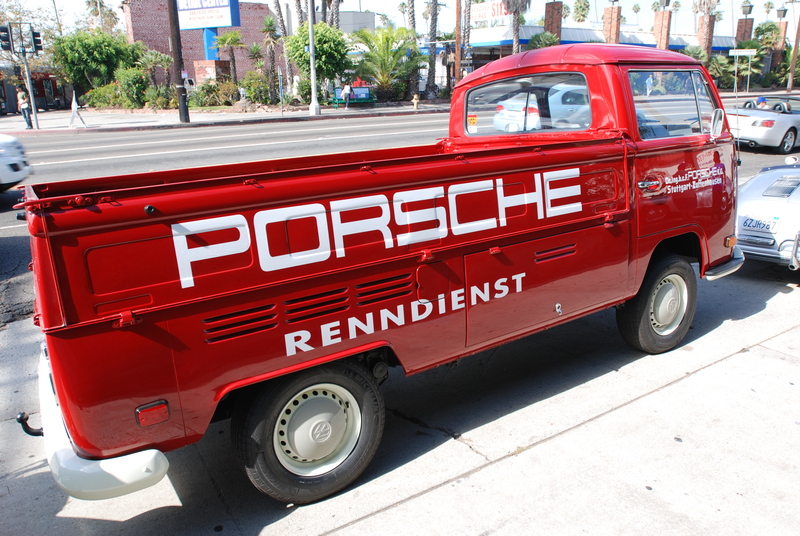 Parked out front of the Deus facility, helping garner attention to the mornings activities, was this beautiful red VW single cab transporter, embellished with hand painted Porsche super graphics. 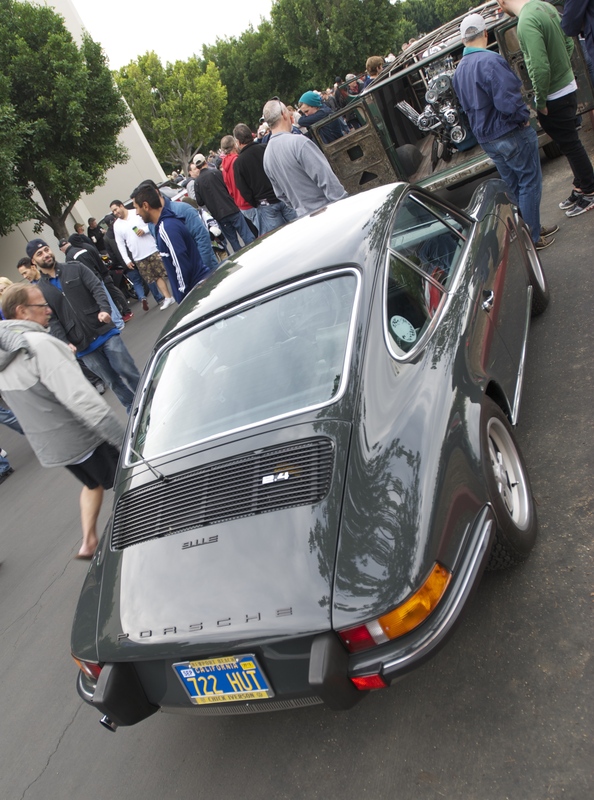 Another of the Porsche parked out front of the Deus Ex Machina facility; in this case one very cool, black 993 Carrera C4 coupe. 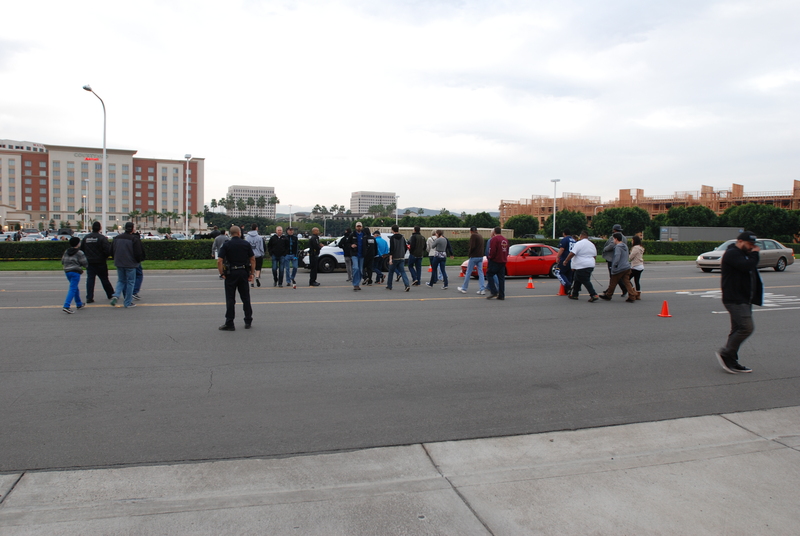 As the morning progressed, and with participants coming and going, our hosts were challenged with being sensitive to the surrounding businesses. 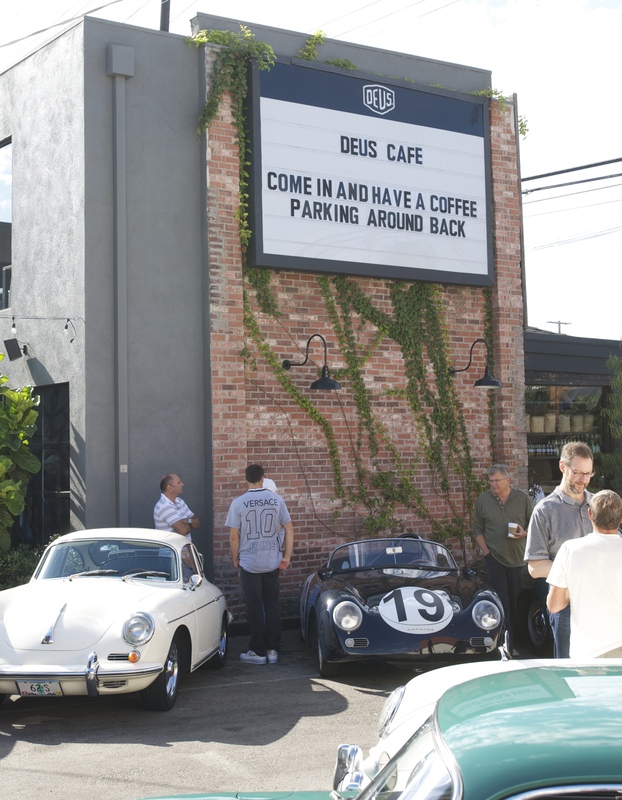 So for some of us, that meant the need to move to the primary Deus parking lot, and consolidate with the remaining cars parked in the Deus lot. 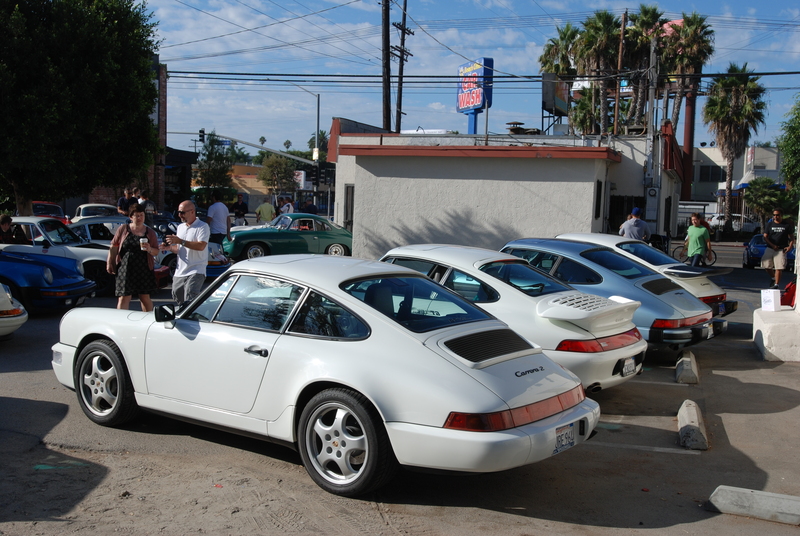 So imagine my surprise when I found myself now parked between two icons; Porsche ultimate expression of the 993 model, the GT2, to my left, and to my right, the Signer 911…and all three cars in white ! 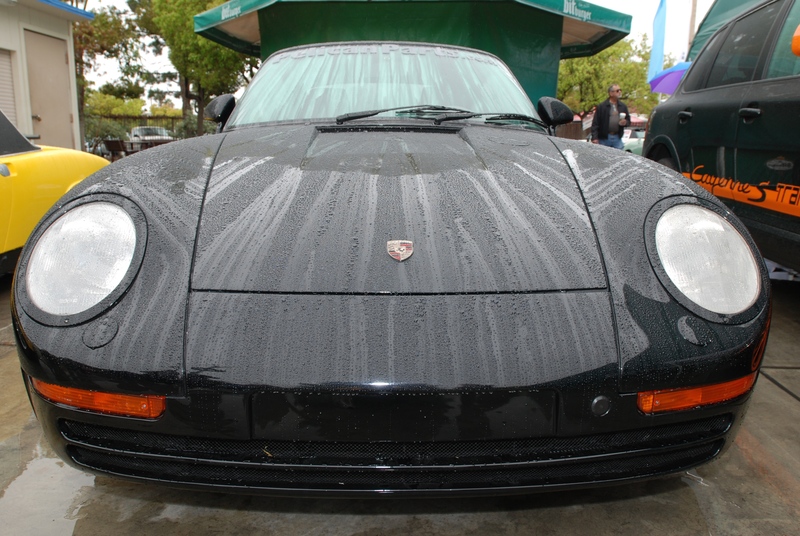 For those unfamiliar with Porsche 993 GT2, just seeing one in person is incredible, given the rarity of this model. 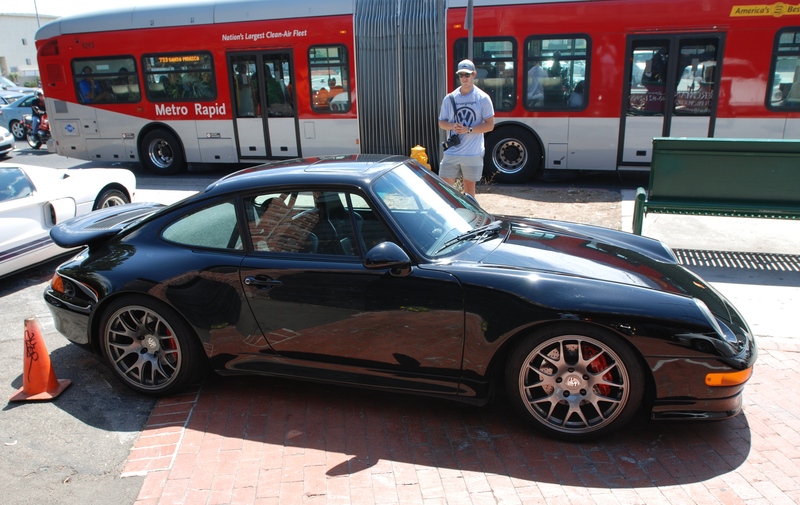 This is only the second true 993 GT2 that I have seen in person (my first sighting was of a silver 993 GT2 parked on the streets of London, while on a business trip back in 2000). 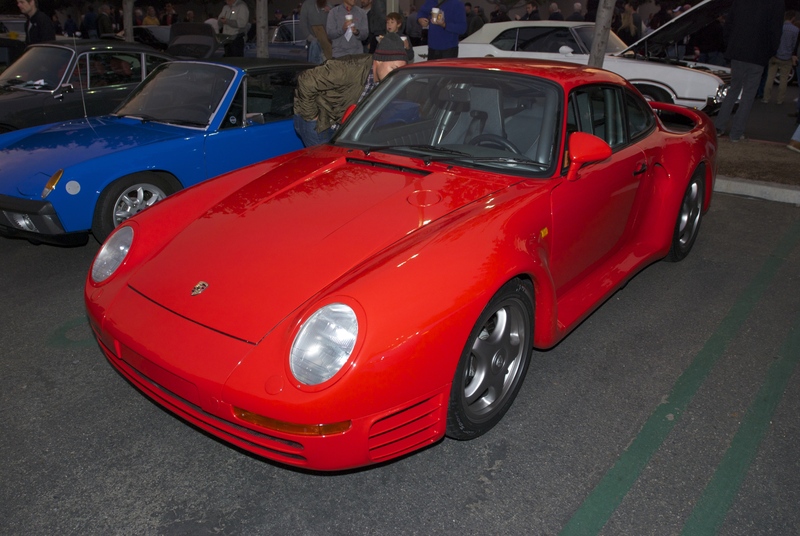 Porsche only produced the 993 based GT2 from 1993 to 1998. 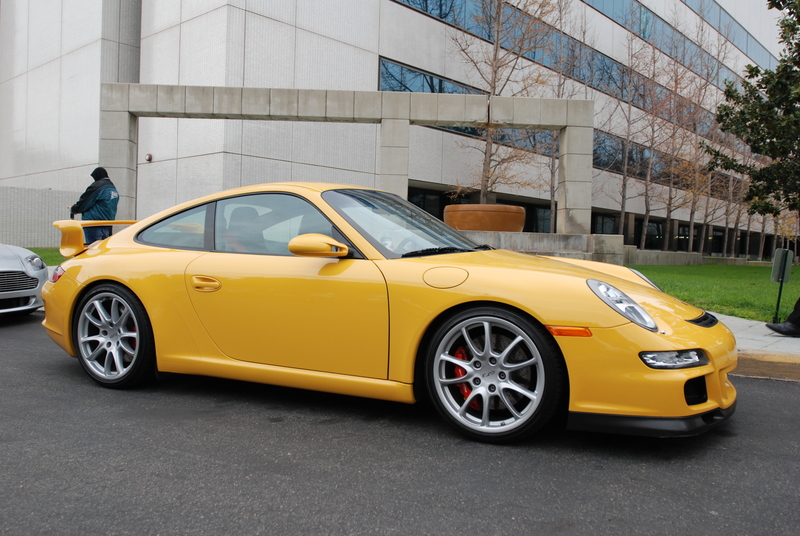 The 993 GT2 was powered by a 3.6 liter, twin turbocharged flat six motor producing 430 horsepower. 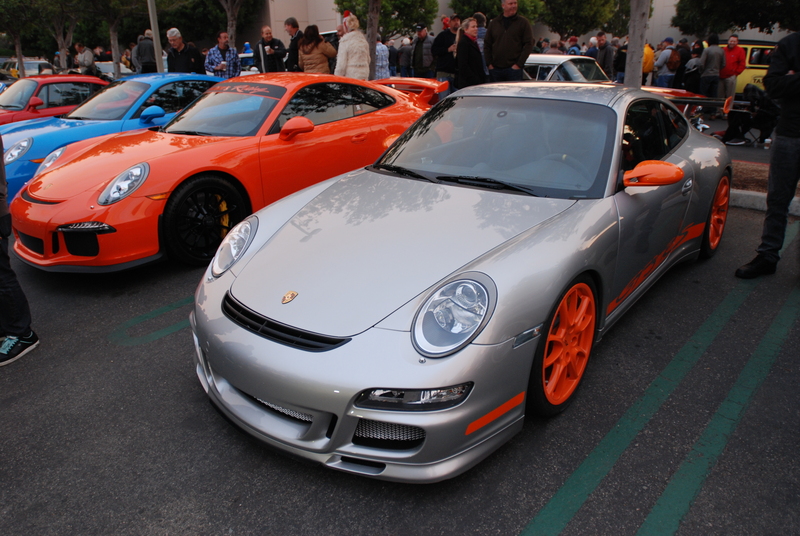 Then in 1998, Porsche increased the GT2s performance, boosting horsepower up to 450. 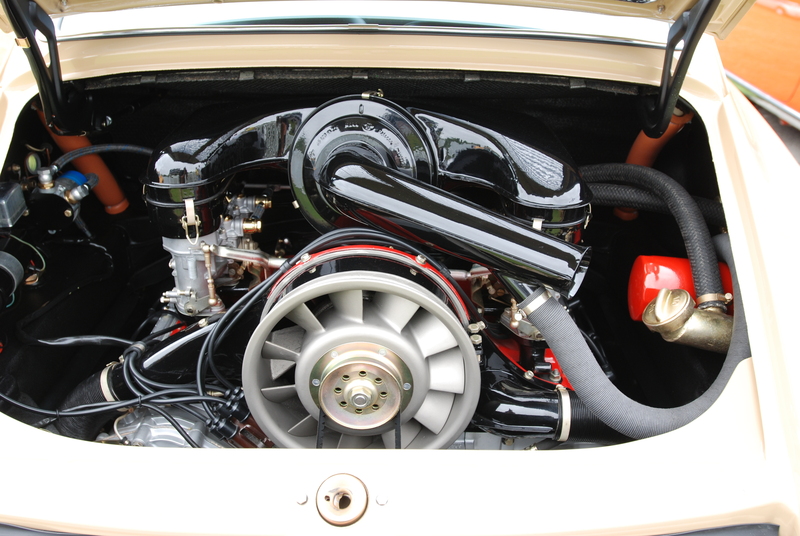 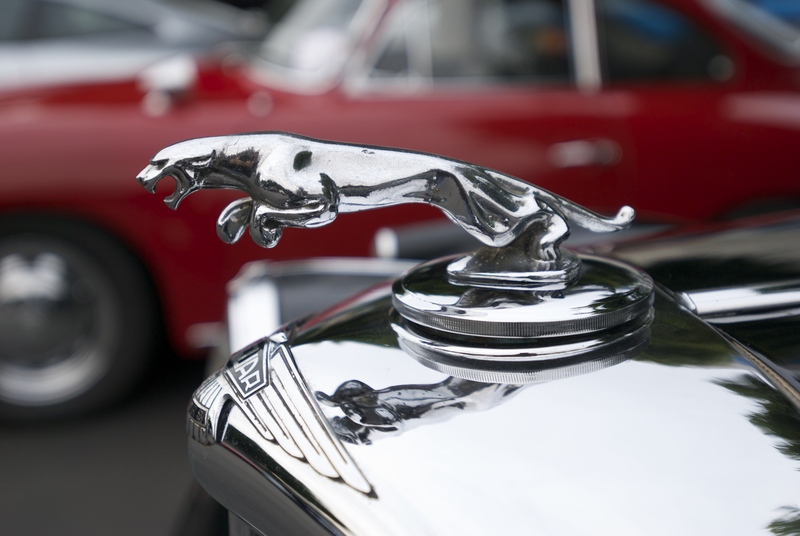 Power was managed through a six speed manual transmission, and capable of delivering 0-60 times of 3.9 seconds, and 0-100 mph times in only 8.7 seconds. 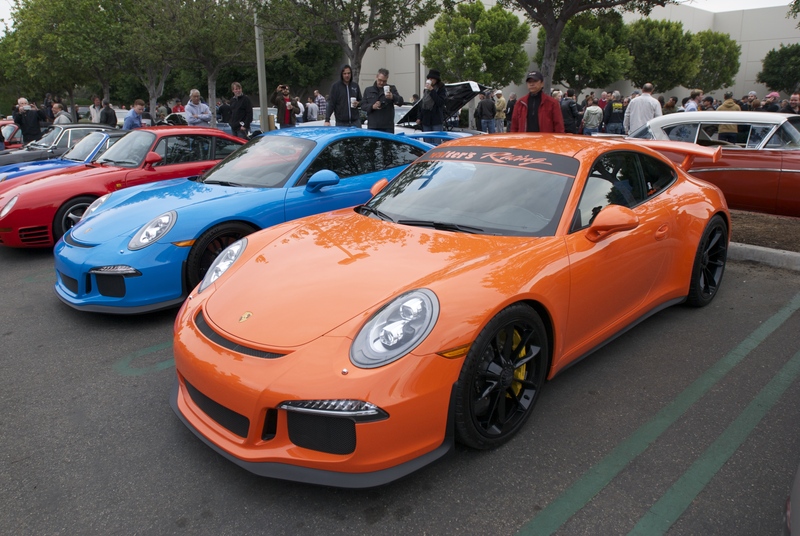 According to my research, Porsche only built a total of 57, 993 based GT2 road cars, with 7 of those models manufactured for the right hand drive market. 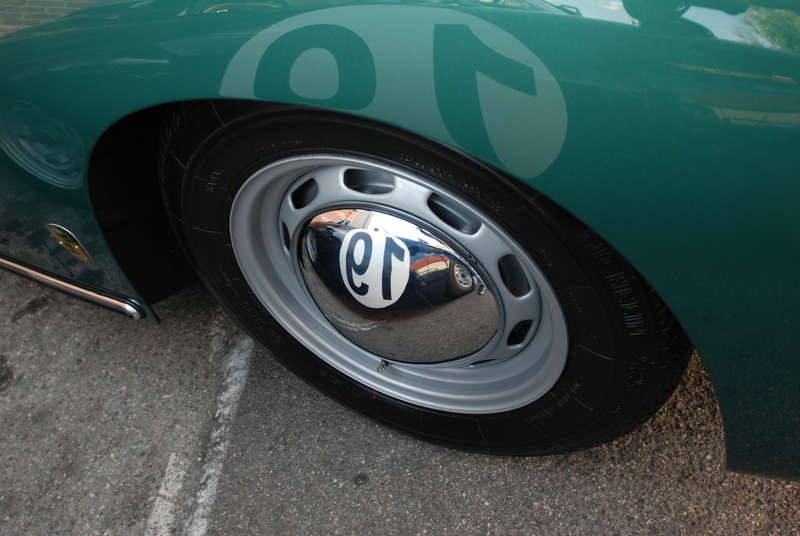 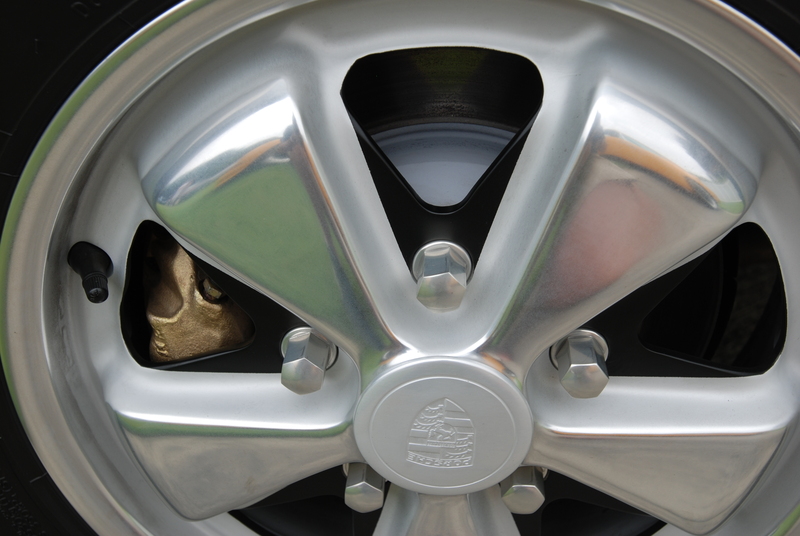 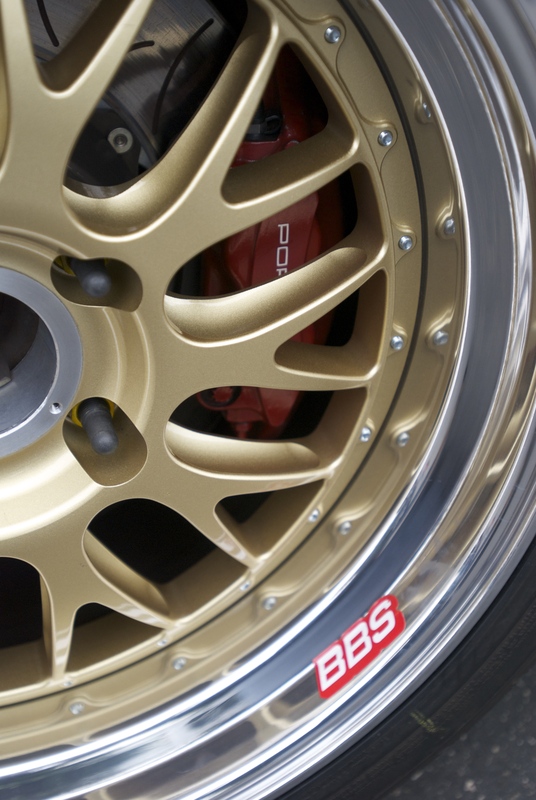 Another of the unique, identifying design details found on the 993 GT2 (as seen below); the three-piece modular, Speedline racing wheel. 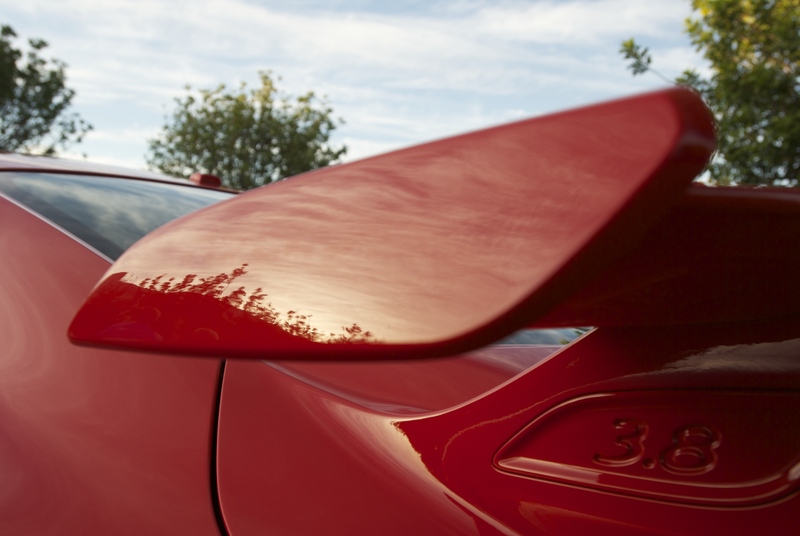 The model specific rear wing, with dual air intakes, designed to feed cool, fresh air to the twin turbocharged motor, and wearing dual GT2 embossed end plates. 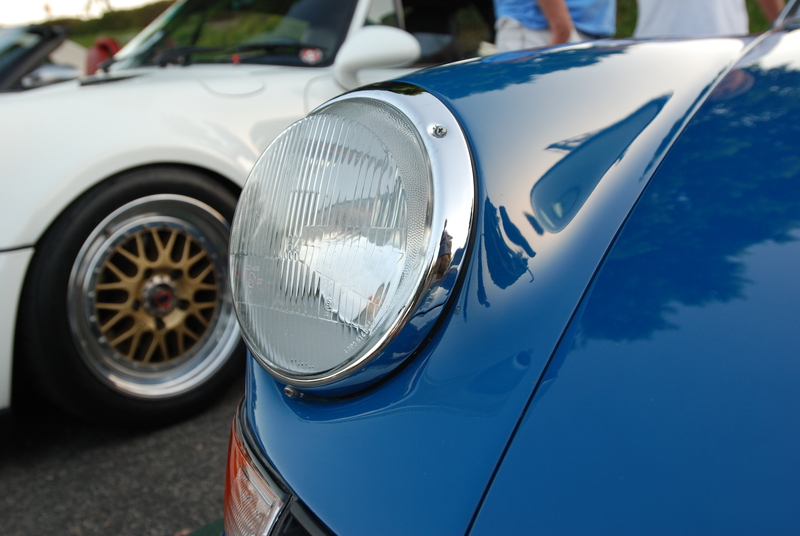 The owner of this GT2 was kind enough to field a mornings worth of questions about his car;the most common question being what is it? 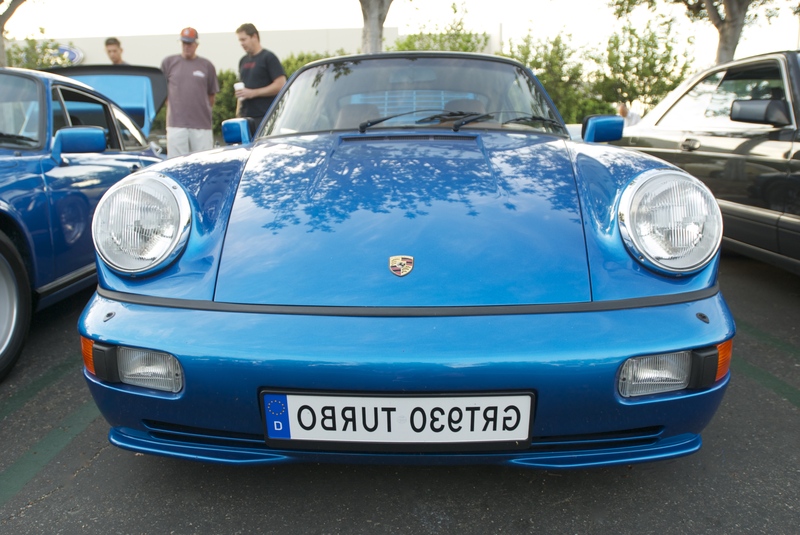 For those in the know, it was obvious that this was in fact a 993 GT2, and not a clone or re-creation. 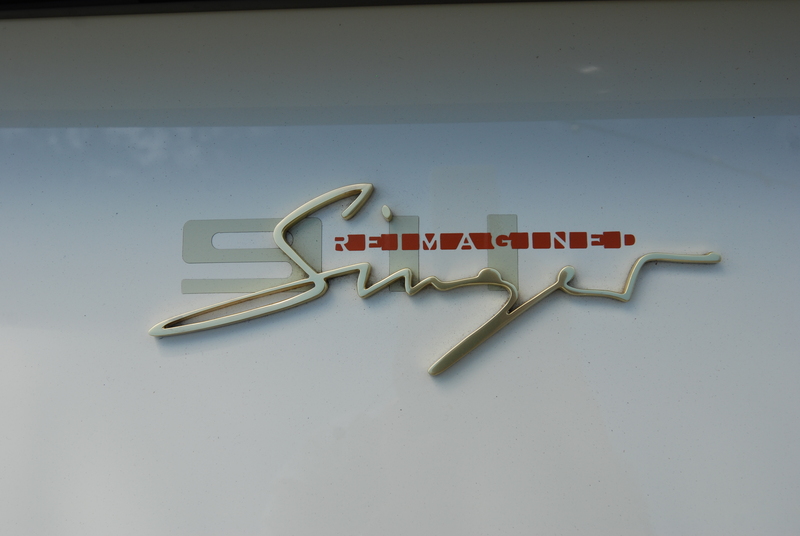 The owner also shared with us that this particular car possessed the horsepower upgrade (450 horsepower), making it one of the 1998 models. 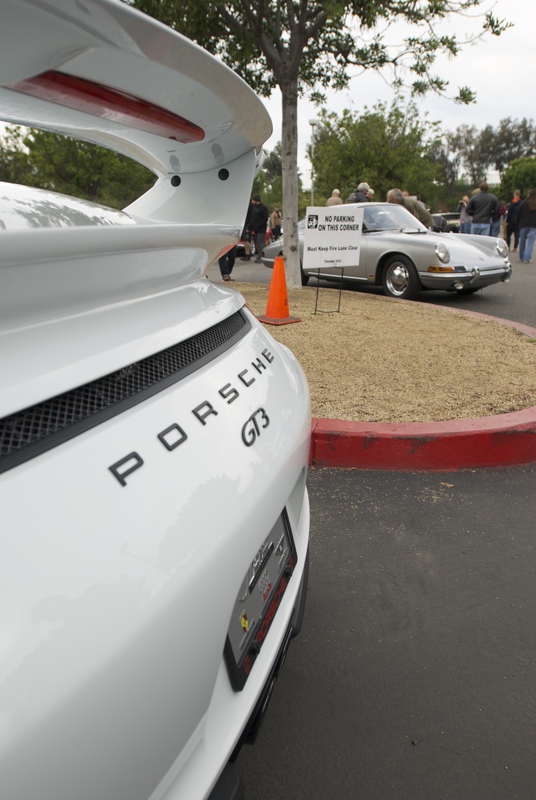 We also learned two more interesting facts about this particular GT2. 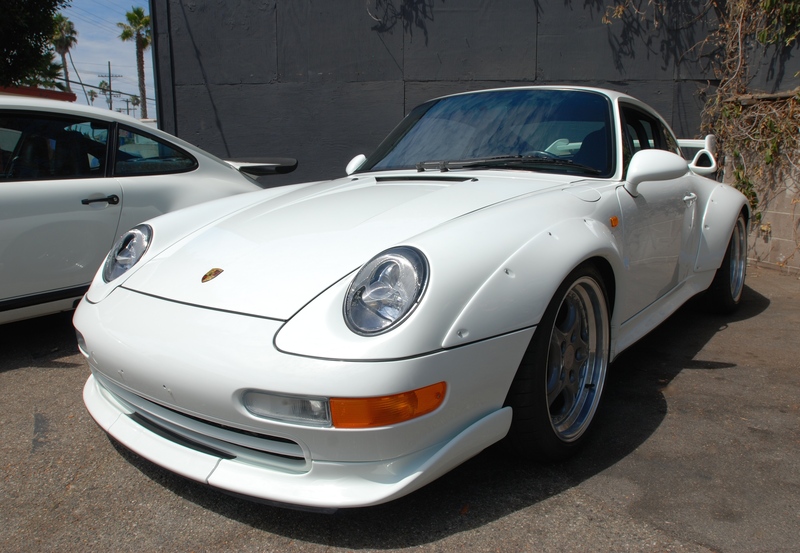 The first was that this car had been purchased from its original owner in Japan, and secondly, upon its successful importation into the United States, it became what is to be believed only one of two true 993 GT2s residing within the USA. 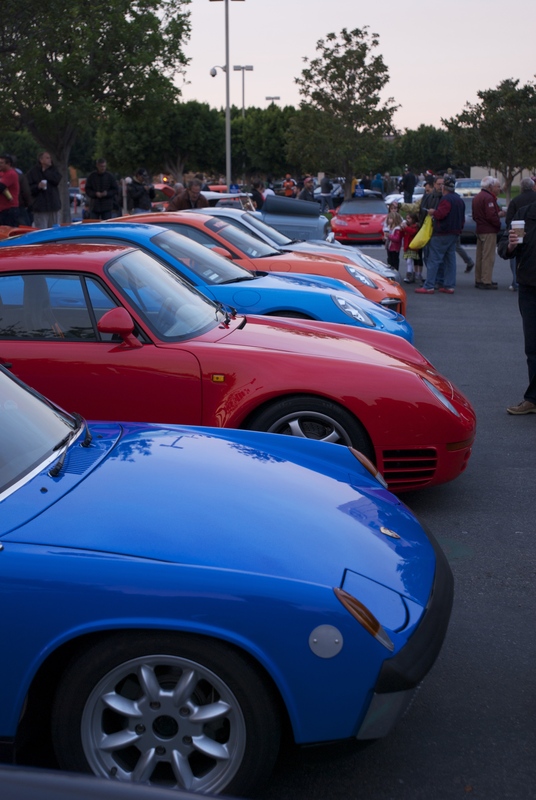 Where else but in Southern California, could an event of this magnitude be held, and draw as diverse and rare a collection of Porsche as those that participated. 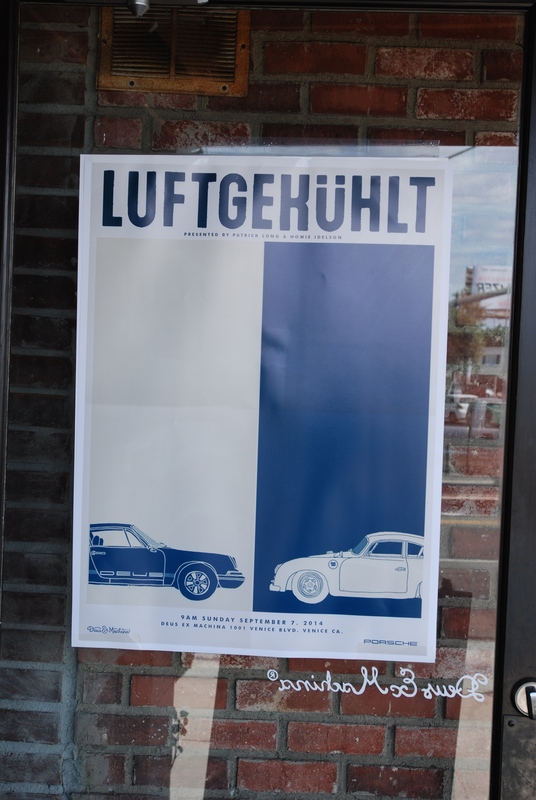 Given the success and turnout experienced on September 7, and based upon comments shared by one of the events host (Patrick Long), it appears it will only be a matter of time before a second Luftgekuhlt event will once again be held. 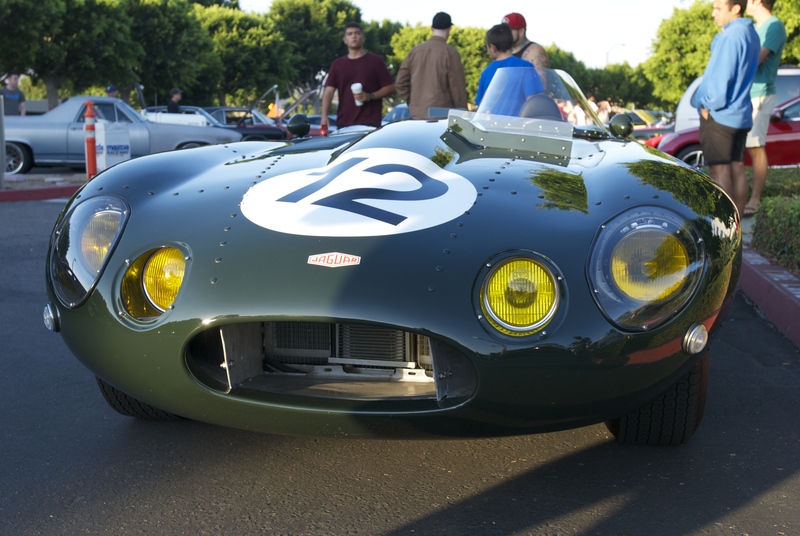 Waking up on Sunday morning July 20th, I was greeted by high gray cloud cover and warm temperatures, yet it was just 6:30 AM; Interesting weather for the start of this years 2014 Dana Point 356 concours. 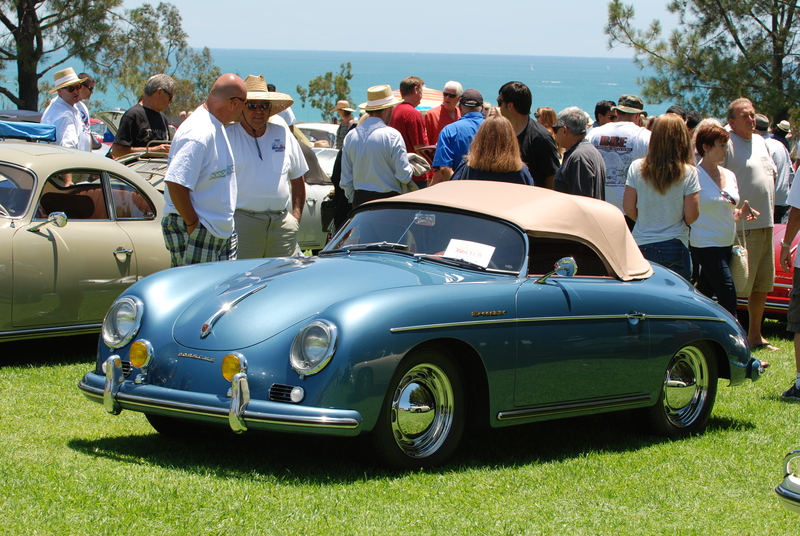 At least the cloud cover did not appear to possess the ability to deliver rain, as had occurred during the past two Dana Point 356 Concours. 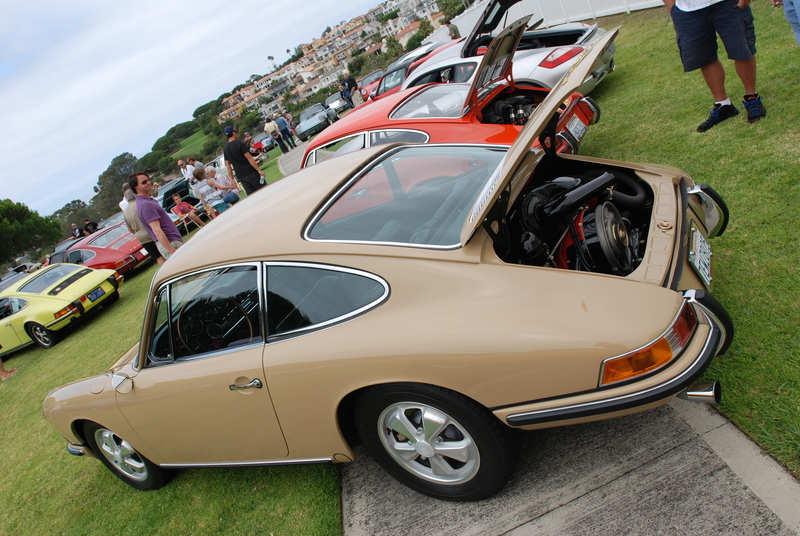 I arrived at the Lantern Bay Park overlooking Dana Point harbor at around 7:30 am, anticipating an early entry to the grounds for Porsche 911 “display parking” by 8:00 AM, only to be told that this year the 911s would have to wait until 8:30. 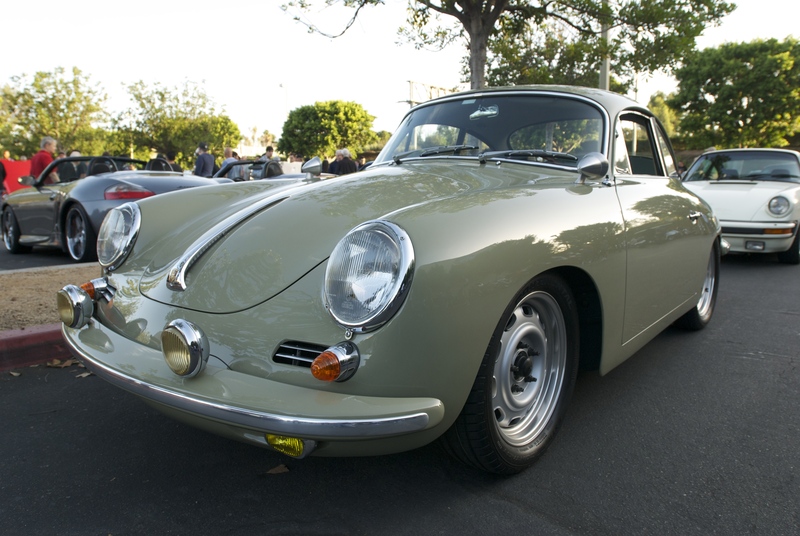 I was then told that I would need to leave the area at the top of the hill to make room for any of the late arriving Porsche 356. 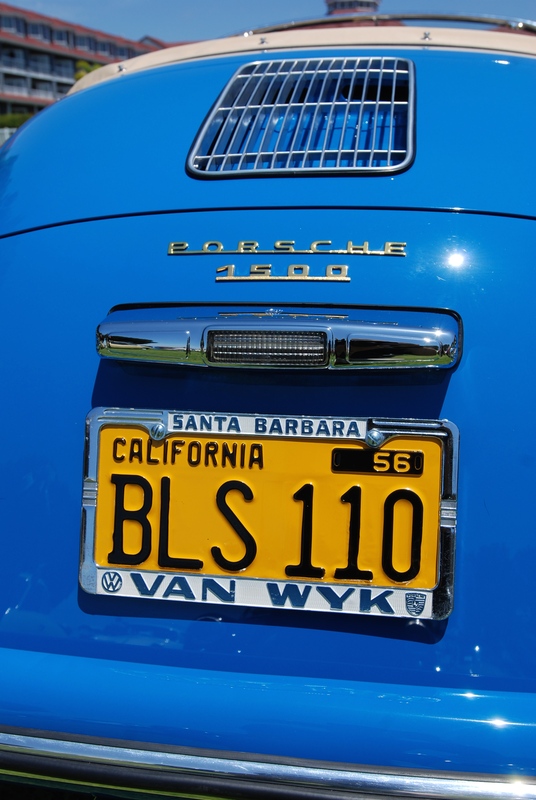 So with no place to wait, I turned around and descended the hill and headed back towards PCH (Pacific Coast Highway) for those unfamiliar with Southern California highways. 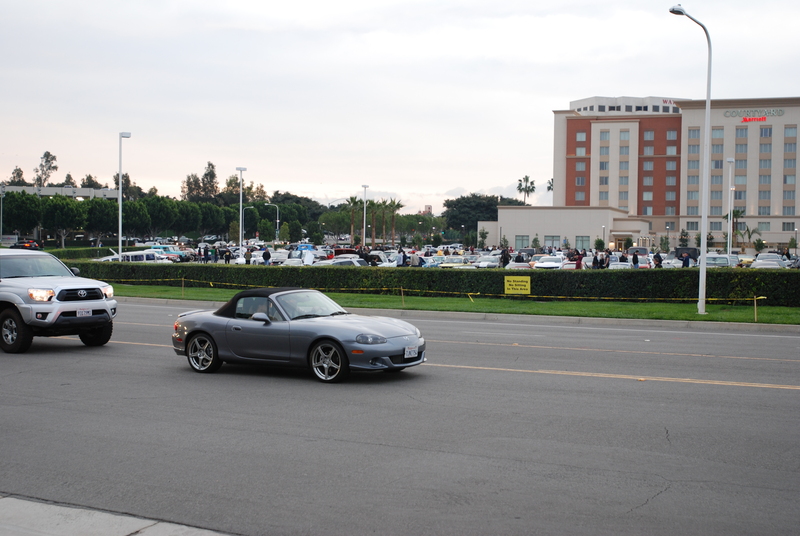 Fortunately there was a Denny’s restaurant on the corner, so I decided that this would be a good place to park and wait for 8:30 AM. 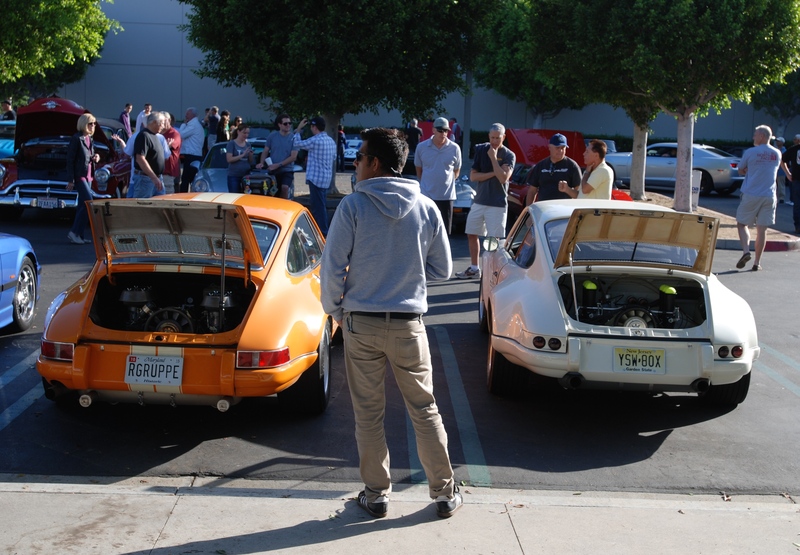 As I pulled into the lot, I could see there was already a group of early model Porsches parked together towards the back corner, so I headed in their direction. 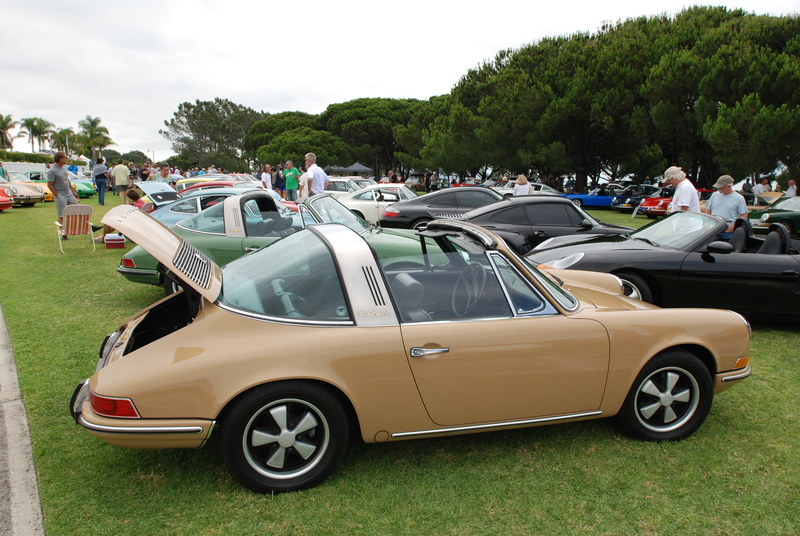 After parking near a pristine, Sand beige Porsche 912 Targa, I got out and struck up a conversation with the owner, who was standing beside his car. 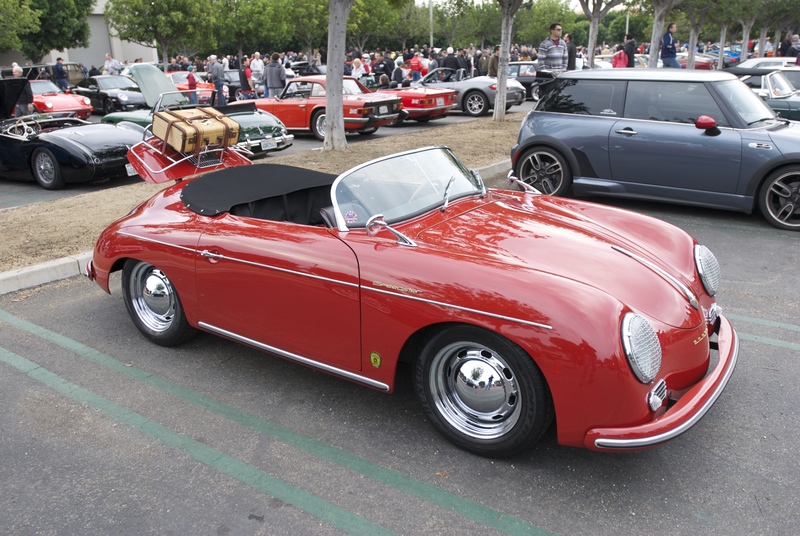 After talking with the owner (Ned) about the obvious topic (Porsches, and the pending concours), a Porsche 356 pulled into the lot, parked and joined in the conversation. 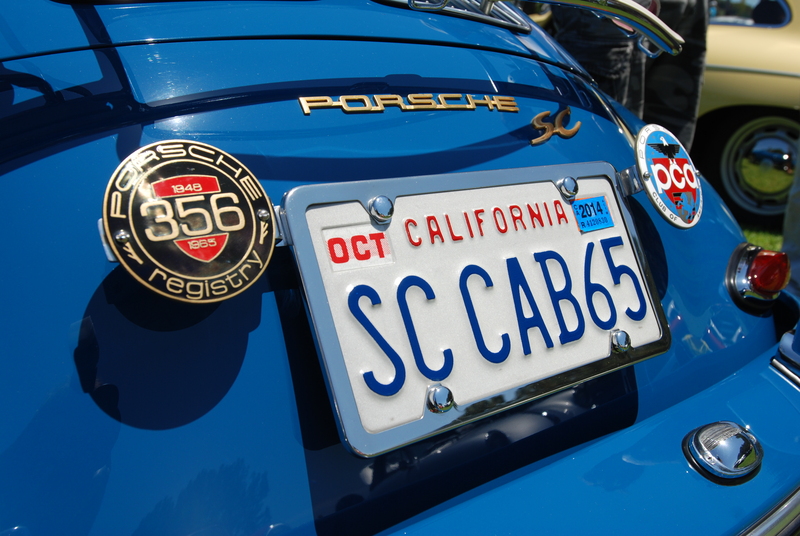 Our conversation then shifted to the 356 he was driving (an “Outlaw” i.e. 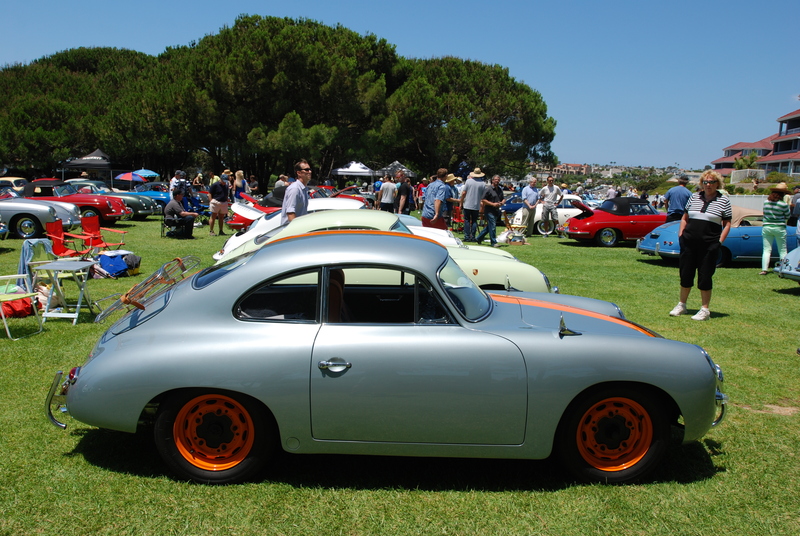 a highly customized 356 that most Porsche 356 purists frown upon due to the non-factory type alterations made to an original car). 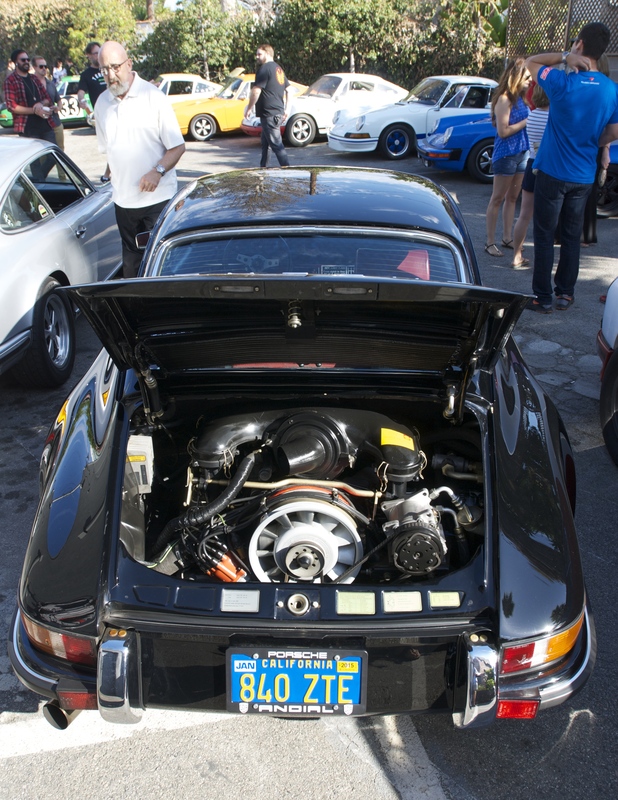 The driver turned out to be one of the mechanics from the shop that had worked on the car for a client, and who was now tasked with displaying the car at the concours. 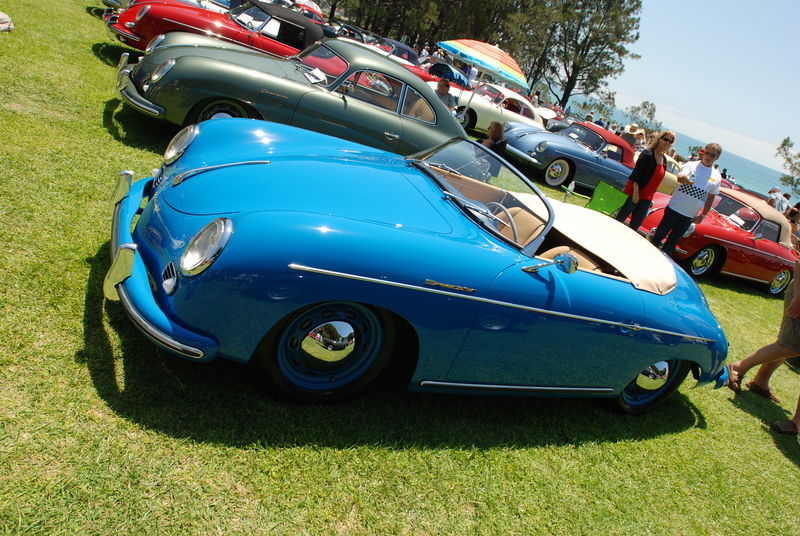 It was now getting close to 8:30, so the 356 was started up and driven off to the show. 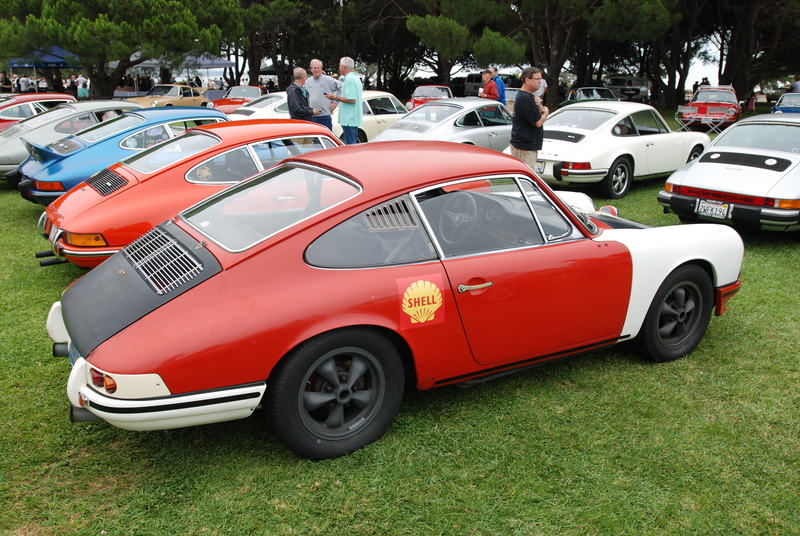 At the same time, the owners of the cluster of Porsche 912s returned from having breakfast, fired up their respective cars, and headed out single file back towards Lantern Bay. 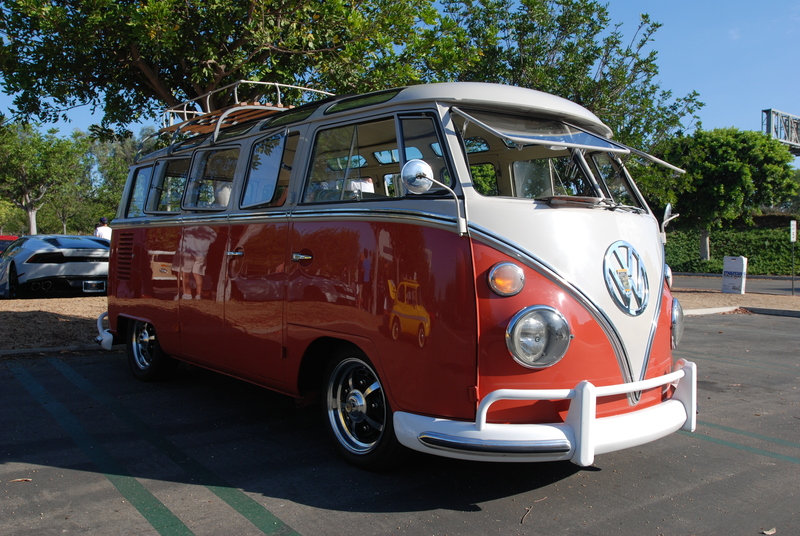 Ned and I followed their lead, and both made our way back to Lantern Bay. 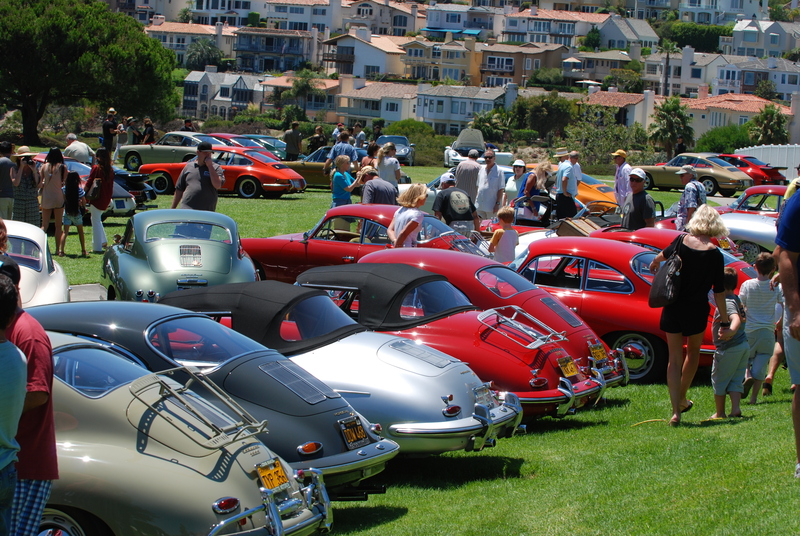 Once back on top of the hill, it was obvious that the 356 competitors were now all in place, and neatly aligned in rows. 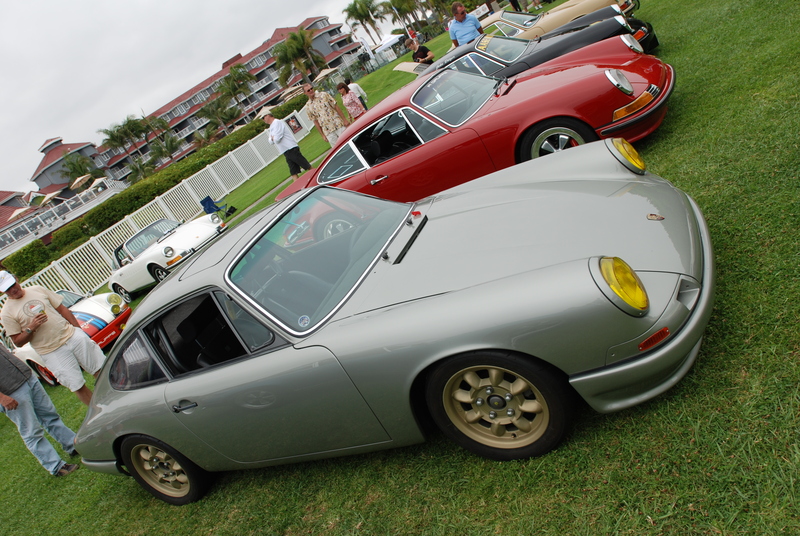 However as I pulled onto the lawn, I was surprised to see a large gathering of early Porsche 911s (made up of members of the Early S Registry and the RGruppe car clubs), already parked on the lawn, opposite the 356 concours area. 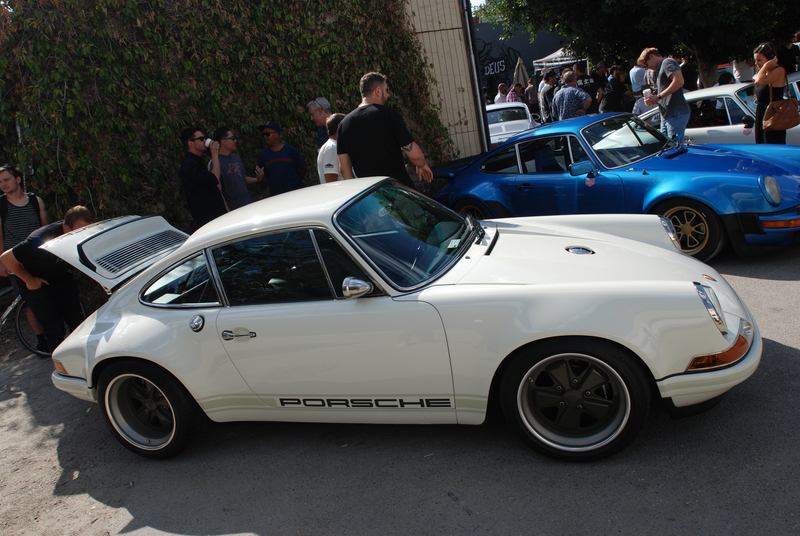 As I continued, parked to my left was another group of Porsches, all 912 models, and representing a full range of model years. 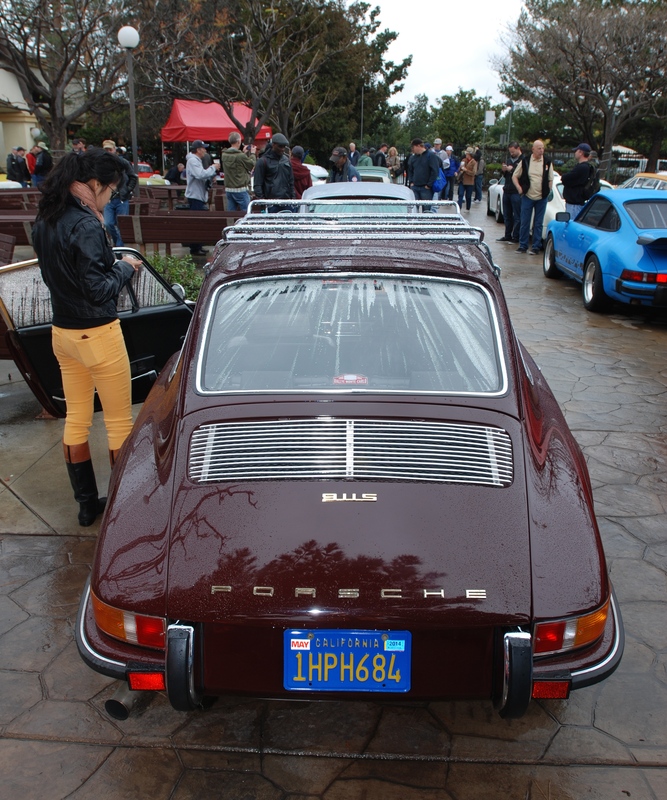 Many of the 912s were in fact the very same cars I had just seen parked down the hill in the Denny’s parking lot. 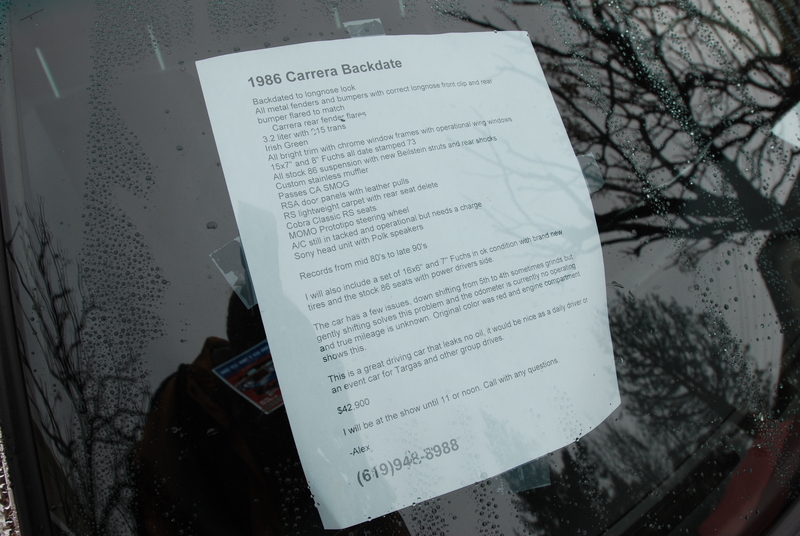 As I reached the end of the 912 row, I made a loop out behind the standing row of pine trees, and found an open spot, making sure to avoid any overhanging tree branches, since these Pine trees during the summer months have a reputation for weeping sap. 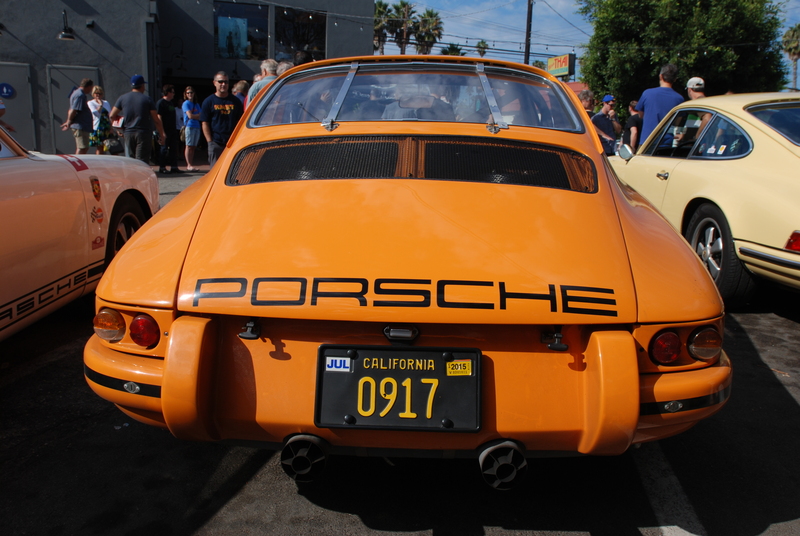 So after grabbing my camera, it was time to take a closer look at the multitude of assembled Porsches. 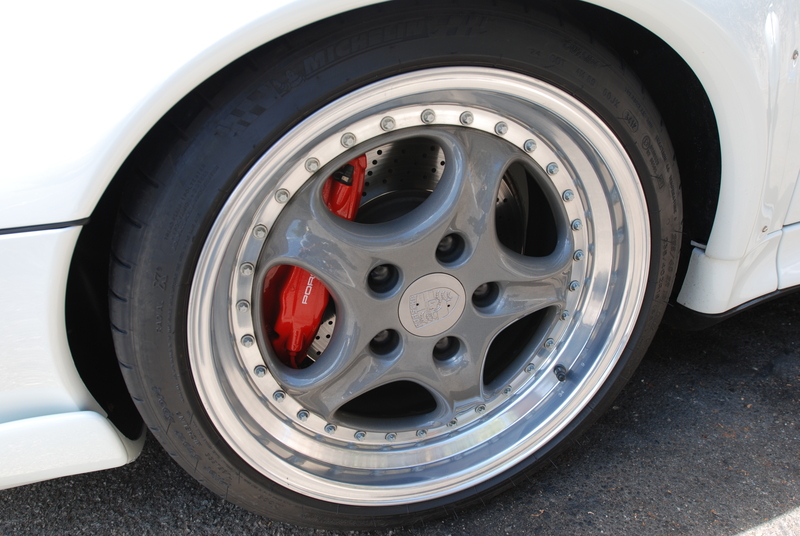 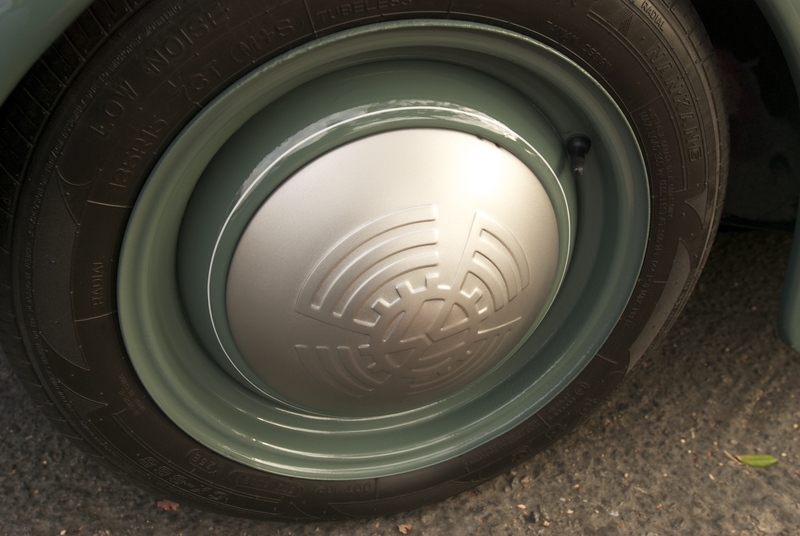 and wearing a set restored and increasingly rare, 4 -1/2 X 15 inch Fuchs 5 spoke alloy wheels. 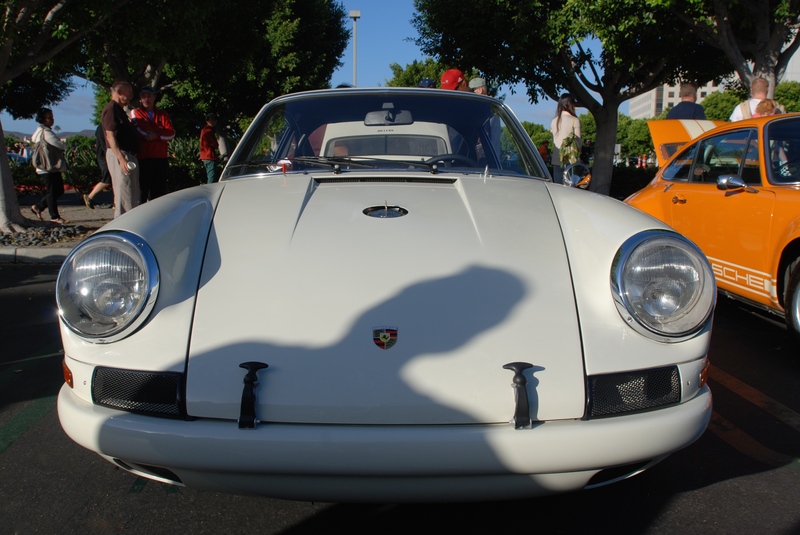 While checking out this amazing 1967 911S, a buzzing noise could be heard overhead, and upon looking up to see what was making the noise, we caught a UFO hovering overhead. 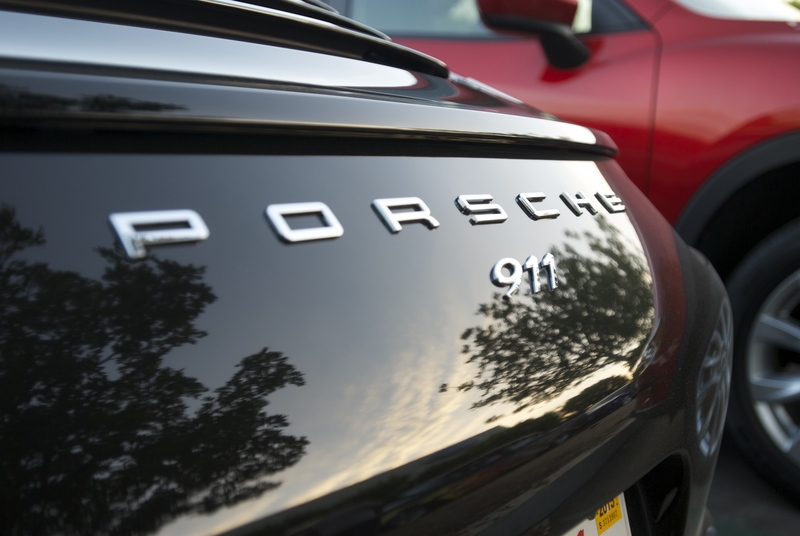 As we watched, it began to track over the rows of parked Porsches, and then without warning, reversed its direction and headed back in our direction. 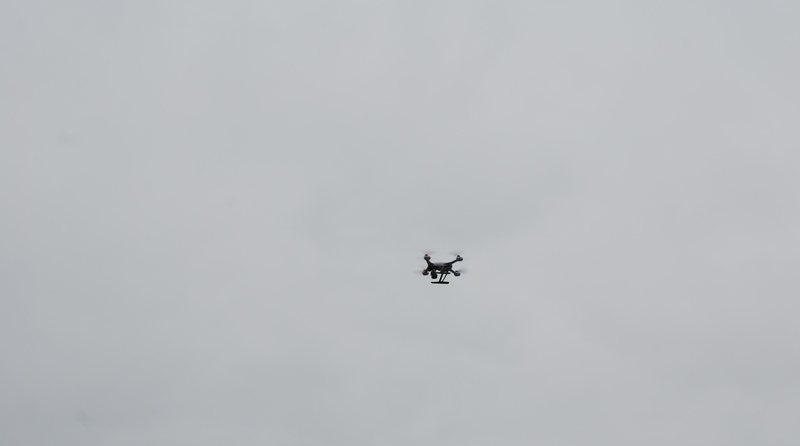 Since I was the only one equipped with a camera, I grabbed a quick shot skyward to record this flying object. 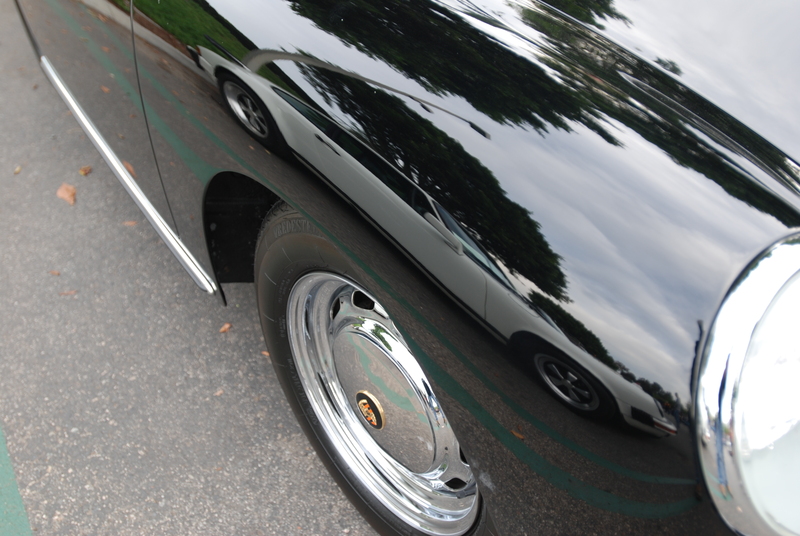 The image below is the UFO just before it disappeared. 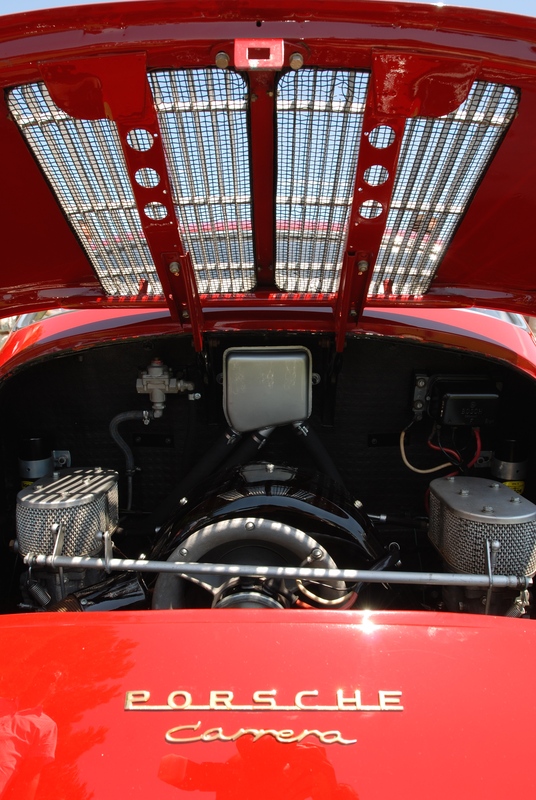 Upon closer inspection of this image, it appears that we were being recorded, as evidenced by the GoPro attached to its underside. 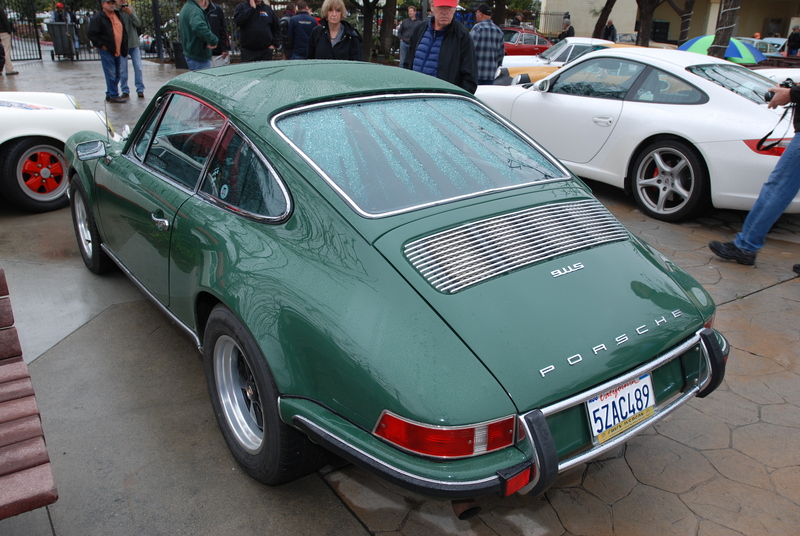 and my friend Brad’s Irish Green 1968 912 coupe as seen below, complete with a unique back story. 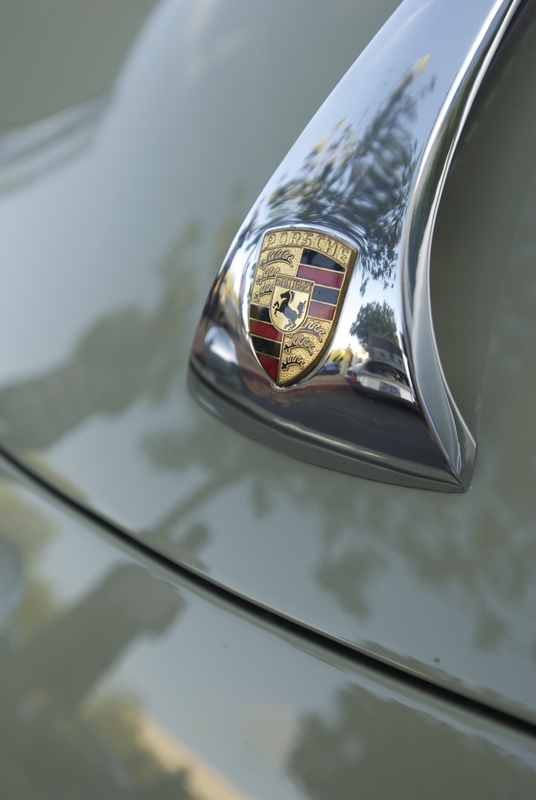 His Porsche had been purchased new by his father while stationed in Germany, and was driven throughout Europe while he served in the military. 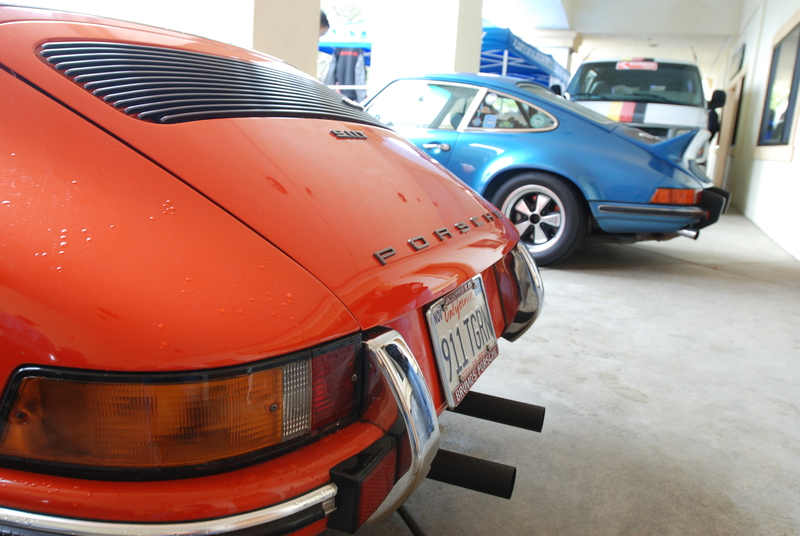 The 912 has remained in the family to this day, with Brad taking over as the current caretaker. 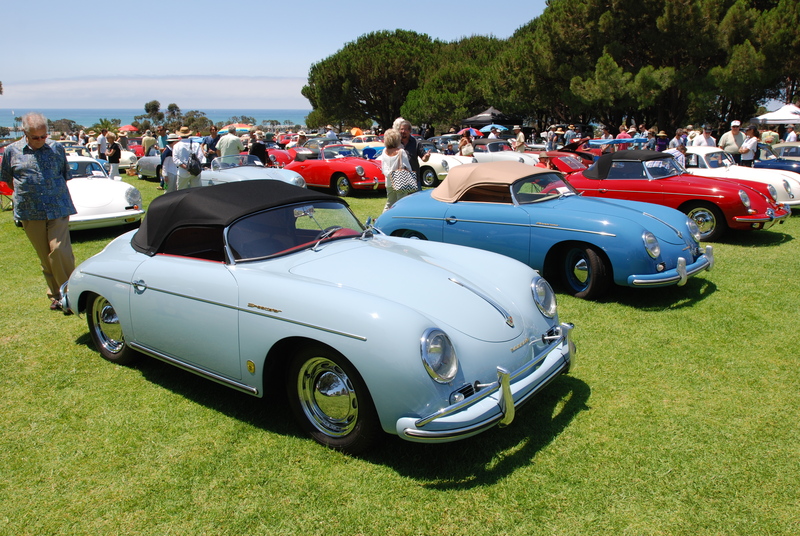 With the sun finally starting to burn through the morning haze, it was time to check out the 356 concours side, and begin my exploration through the pristine rows of multi hued coupes, cabriolets and speedsters. 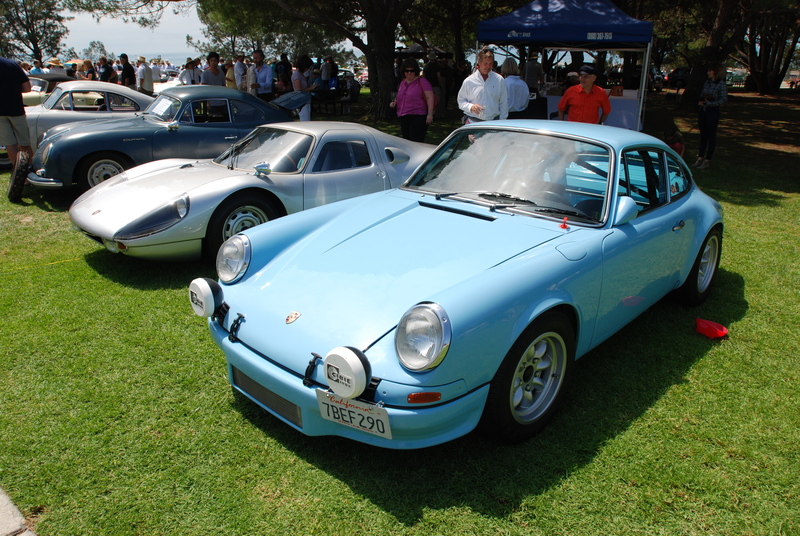 Bridging the gap between the two display areas was the quartet of Porsches seen below. 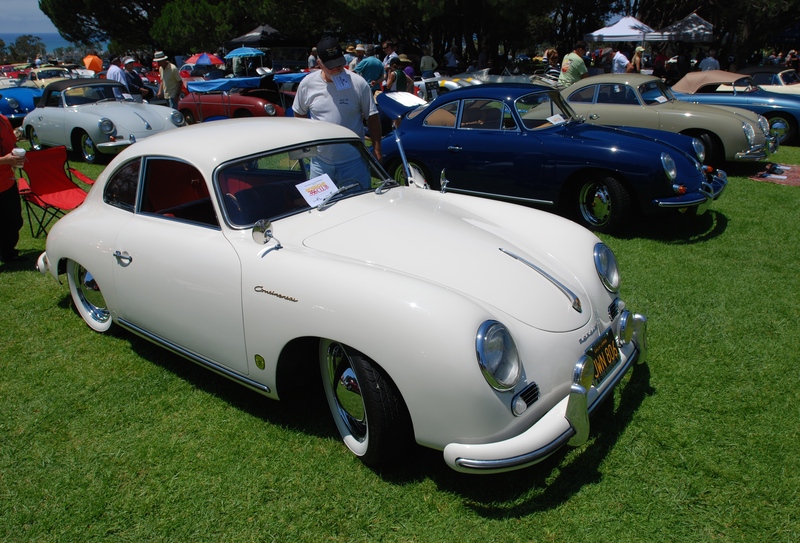 Beginning at the far left, was the ultra rare, Ivory colored 1949 Porsche Gmund coupe. 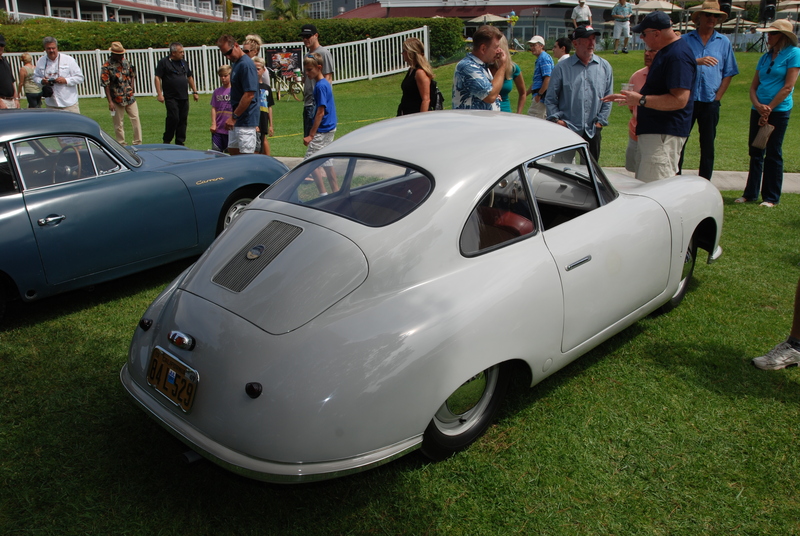 To its left was another equally unique, early model Porsche 356. 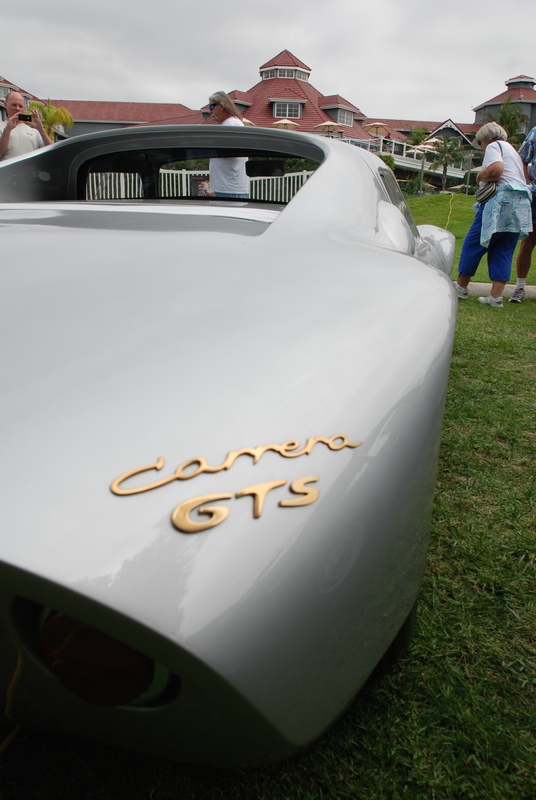 This particular coupe, a 1959 356 Carrera GT, was being displayed in an unrestored condition, and it too possessed a unique history. 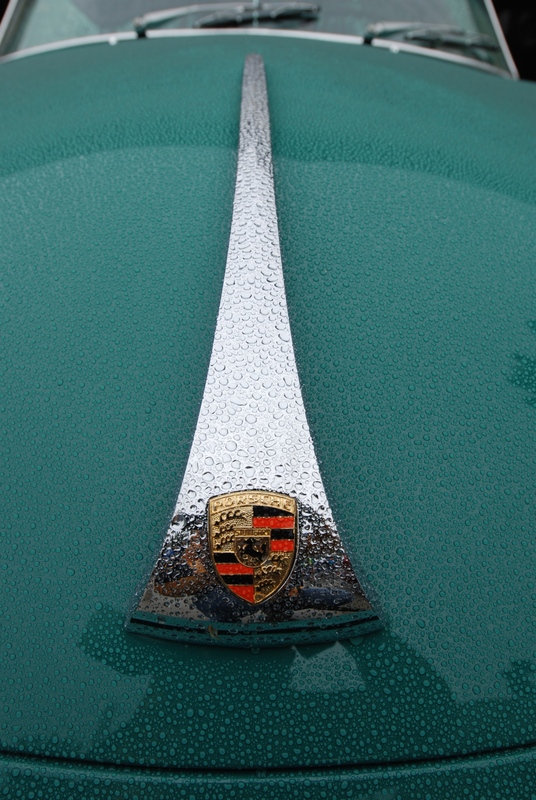 As a sign on its windshield stated, this Carrera GT was the Swedish Ice Racing champion two years running from 1959 to 1960. 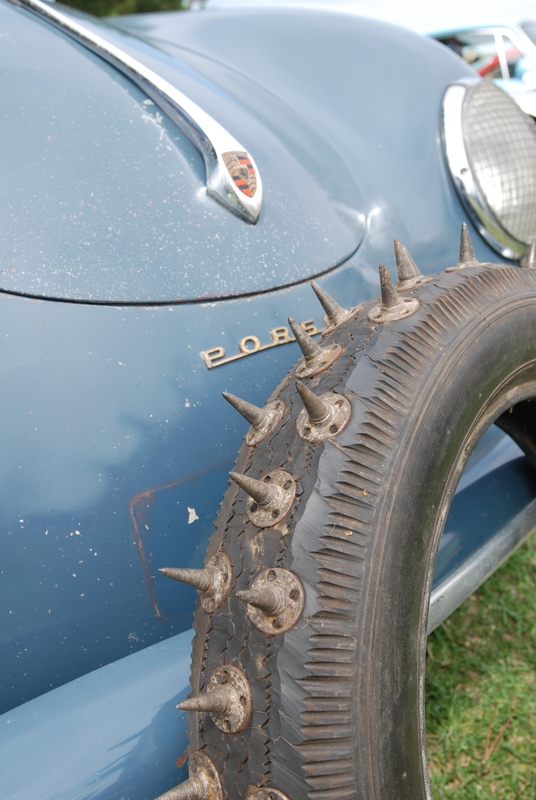 There was even an example of the custom prepared, studded ice racing tires (below), worn by the Carrera GT back in the day on its way to consecutive Swedish ice racing championships. 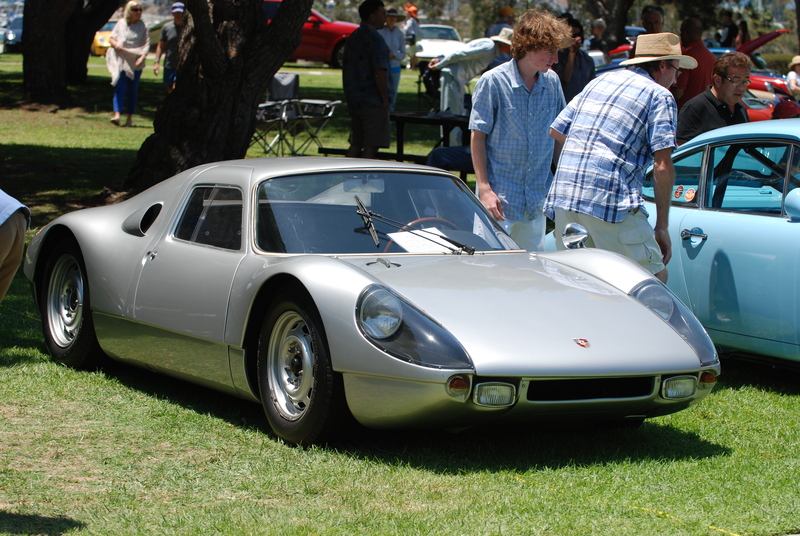 Next in line was another historically significant Porsche race / street car; in this case the silver, 1964 Porsche 904 Carrera GTS seen below. 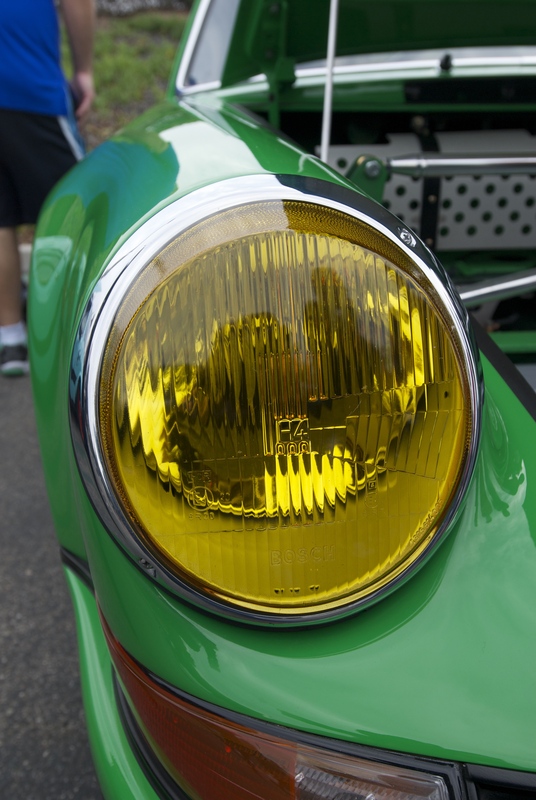 This particular car (Chassis # 904-064) has an interesting resume, having raced in German Hill climb competitions, as well as races held at Monza. 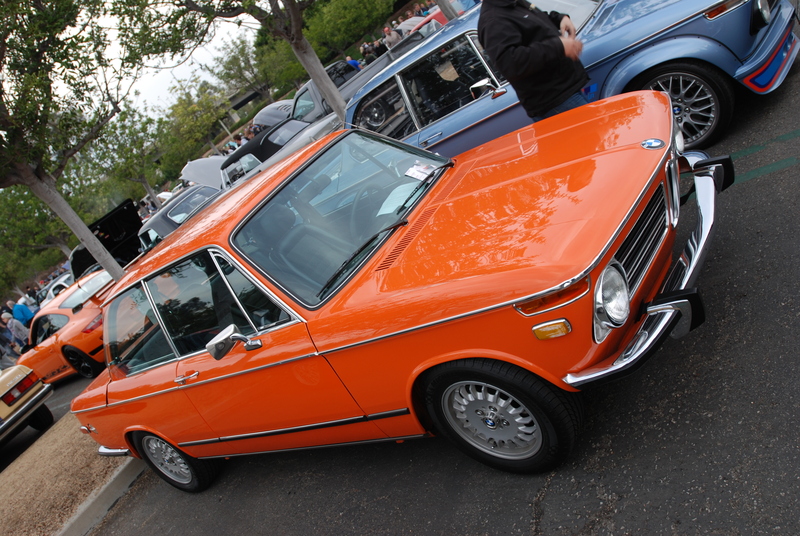 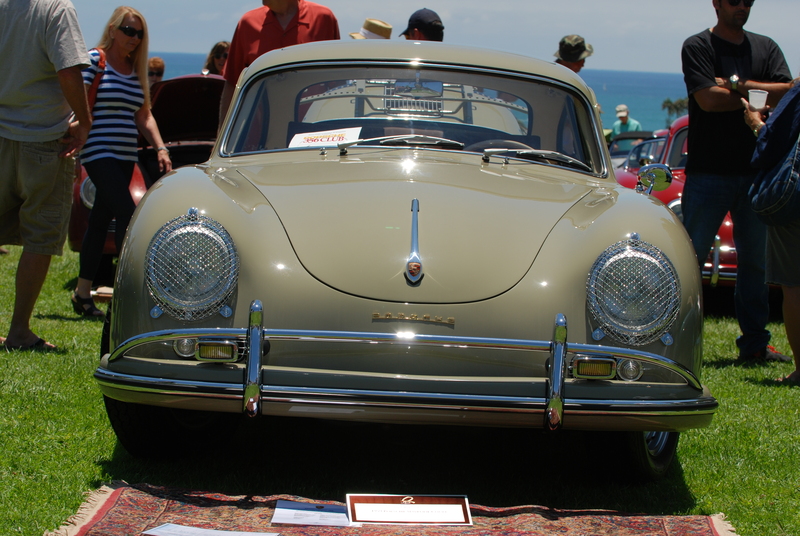 It had been owned and was restored by a previous owner, the late Vasek Polak. 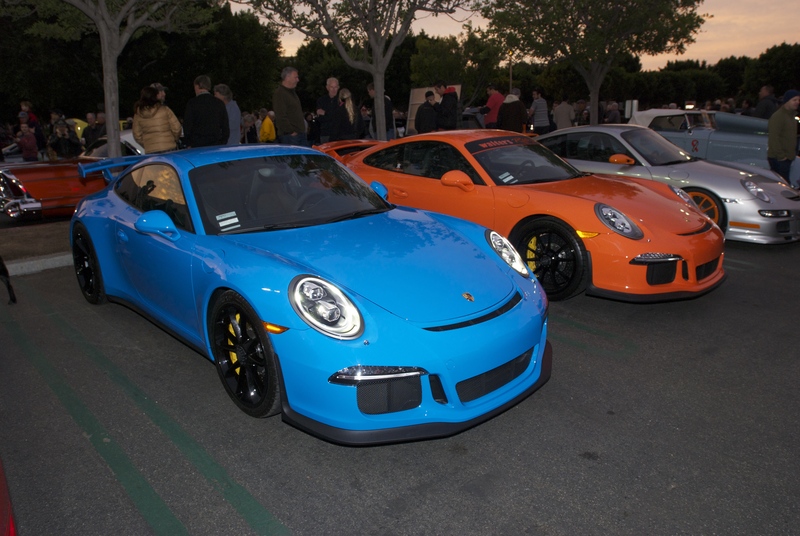 Mr. Polak was well known within the Porsche community as the owner of the Southern California (Manhatten Beach) Porsche dealership, and as one of Claifornia’s prominent race team owners. 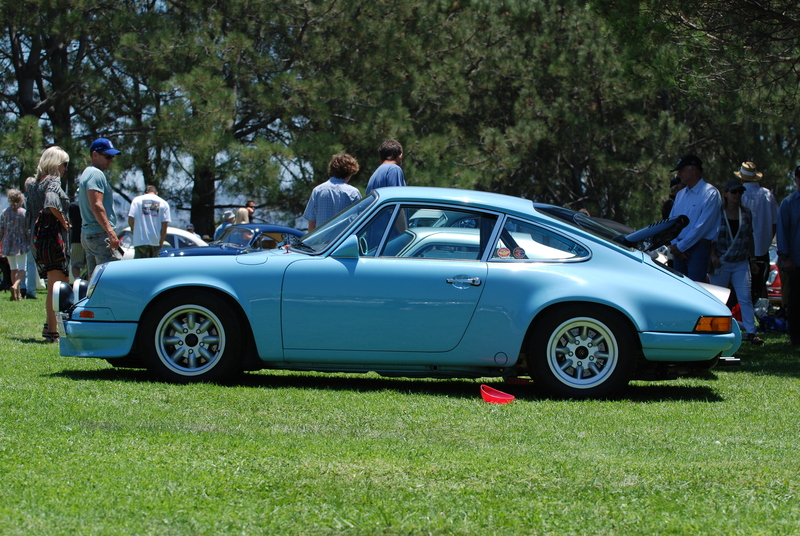 Representing the Porsche 911 community, was the highly modified, RGruppe / Early S Registry inspired, Gulf Blue 911ST coupe, riding on a set of silver, period correct minilite race wheels. 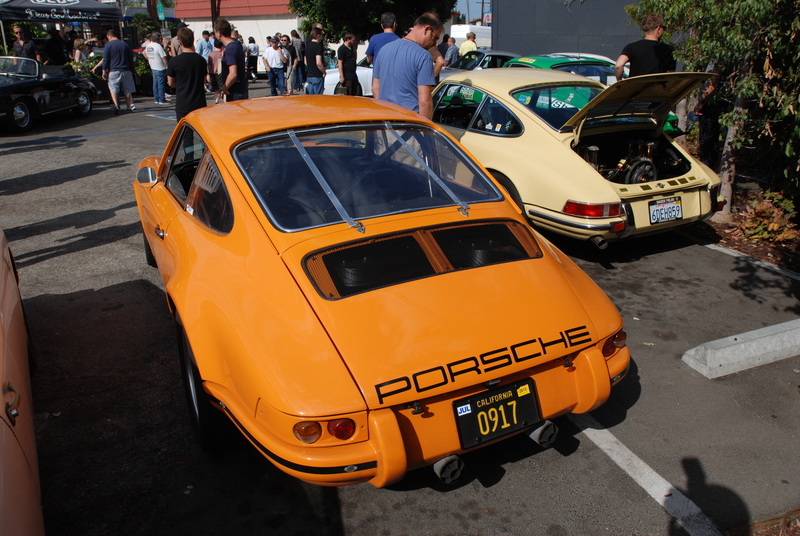 The classic Porsche 911 silhouette, bathed in Southern California sunshine (below). 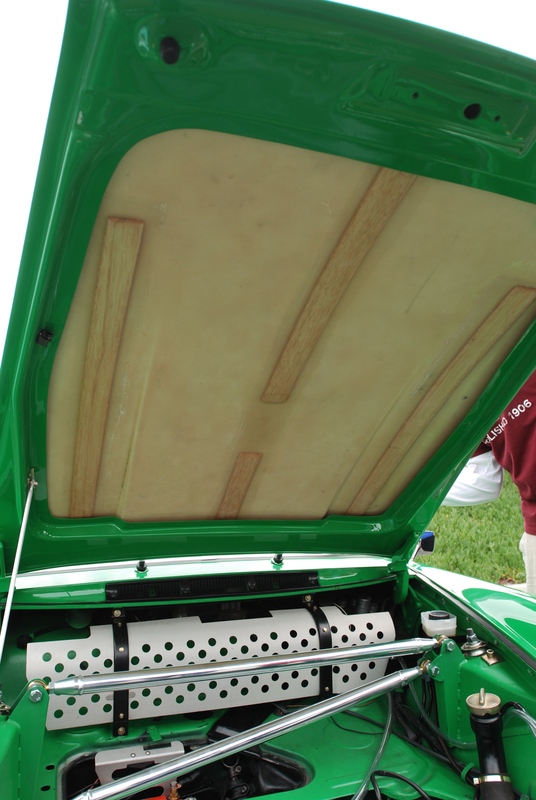 Venturing over to the 356 display side, owners could be seen hurridly completing their last-minute detailing, prior to experiencing their pride and joy undergoing scrutiny by the roving bands of concours judges. 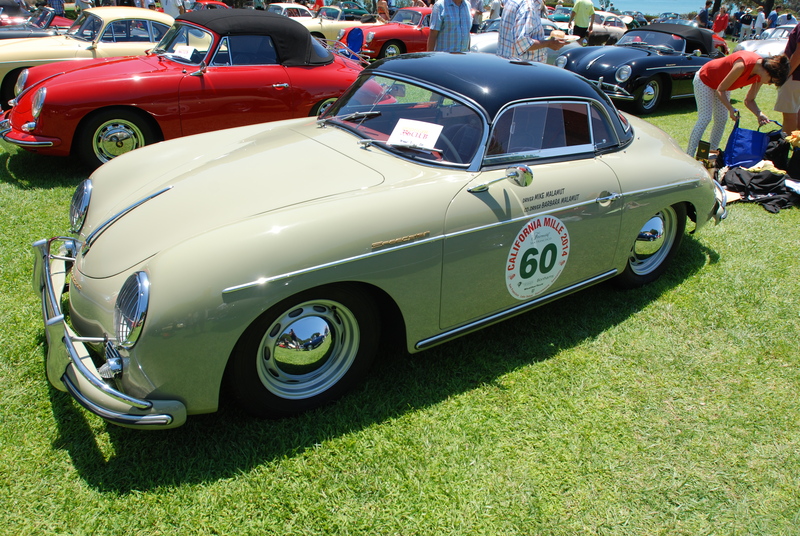 As seen below, one of several “356 Outlaws” present and awaiting judging. 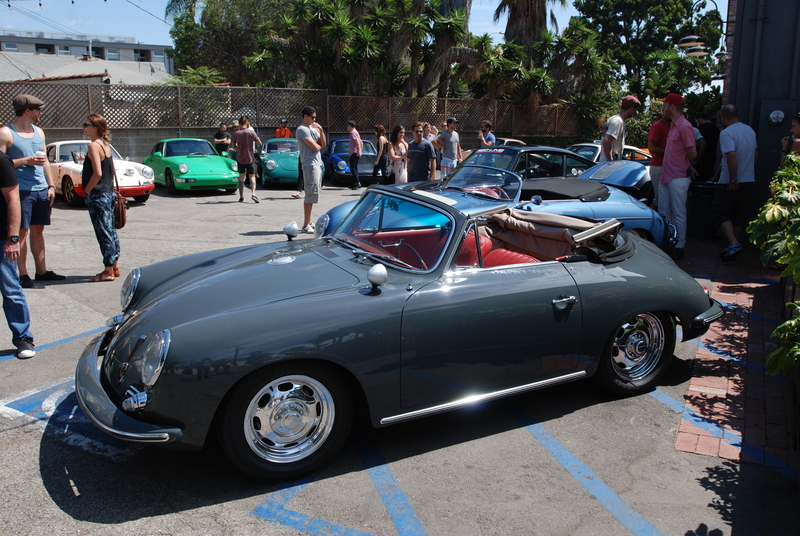 A beautiful Stone gray 356 Speedster, equipped with the seldom seen hardtop option. 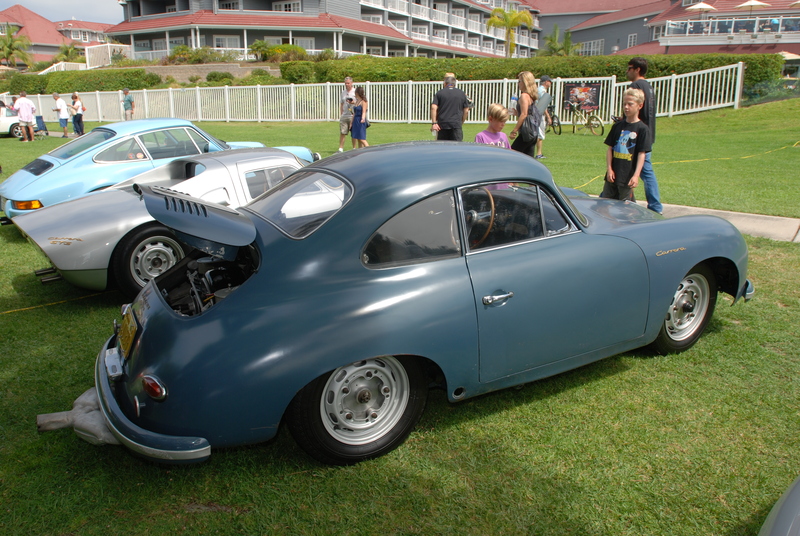 Another example of a 356 Outlaw on display. 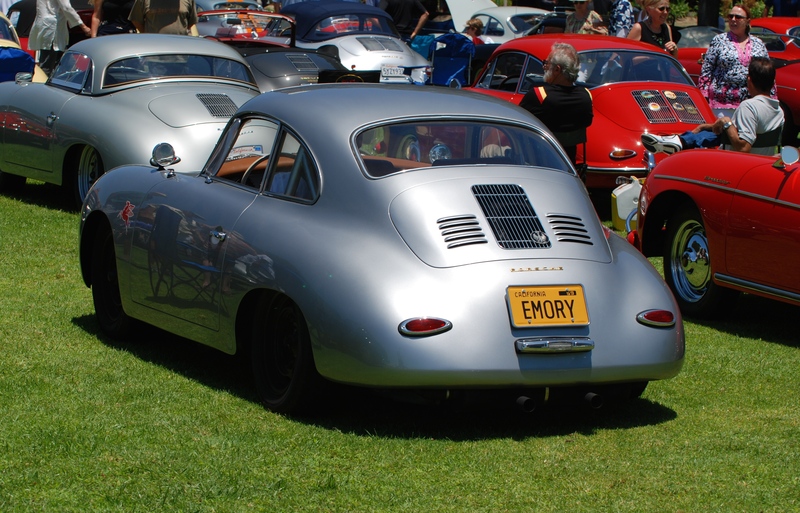 This particular silver Porsche 356 is owned by the Emory family who were responsible for popularizing the “outlaw style” of modification, and credited with coining the term. 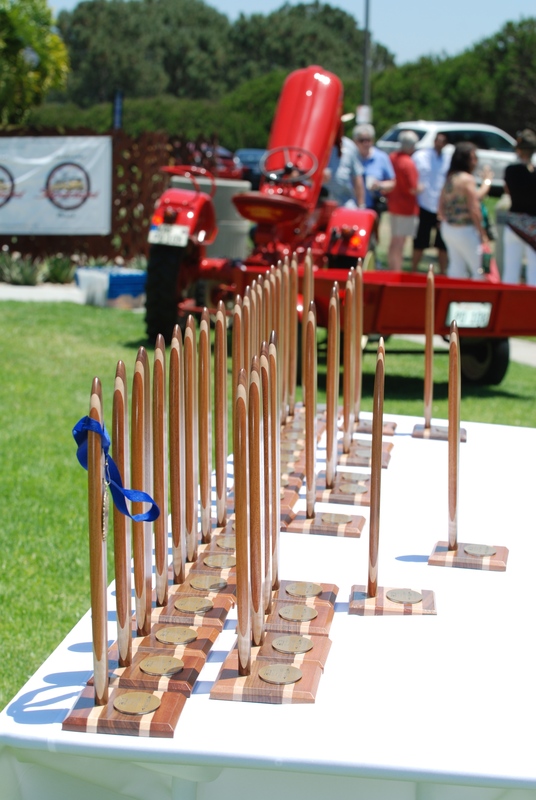 Upon completion of the mornings judging and with the results being tallied, the trophy table (below) was being readied for a 2 PM start of the awards ceremony. 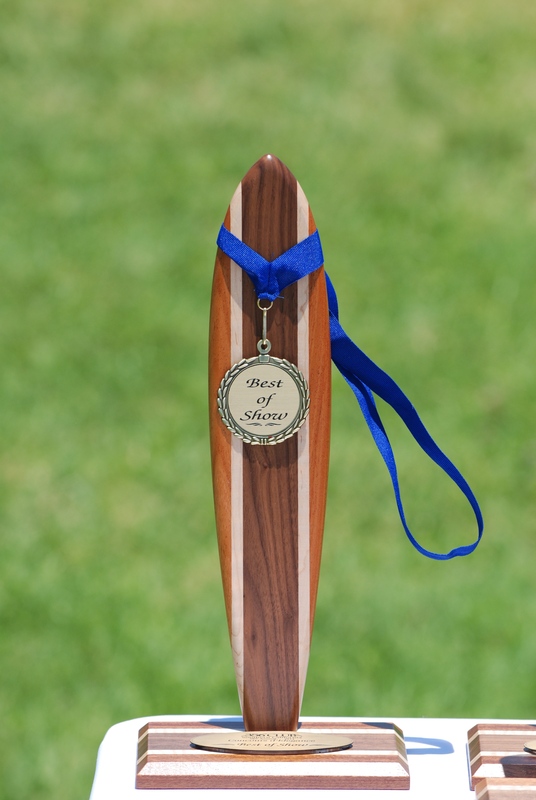 This years trophies were once again modeled after last years theme of surfboards. 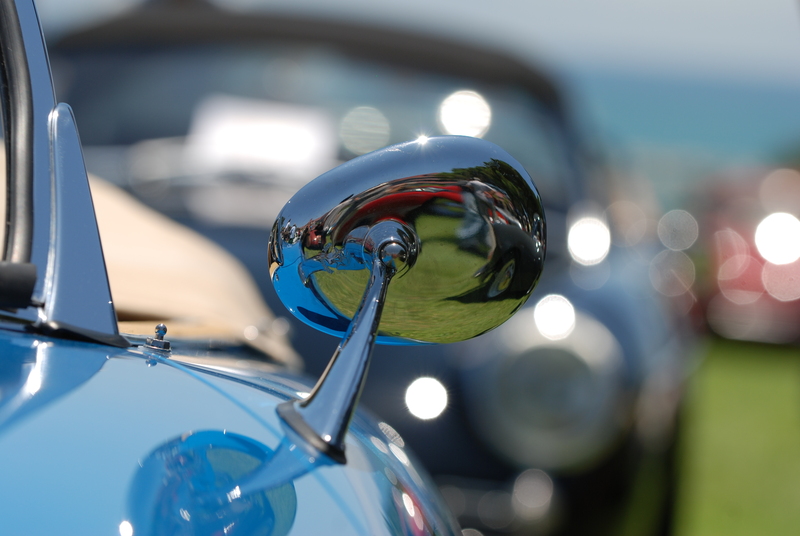 And what every concours participant aspires to; taking home the highly desirable Best of Show trophy. 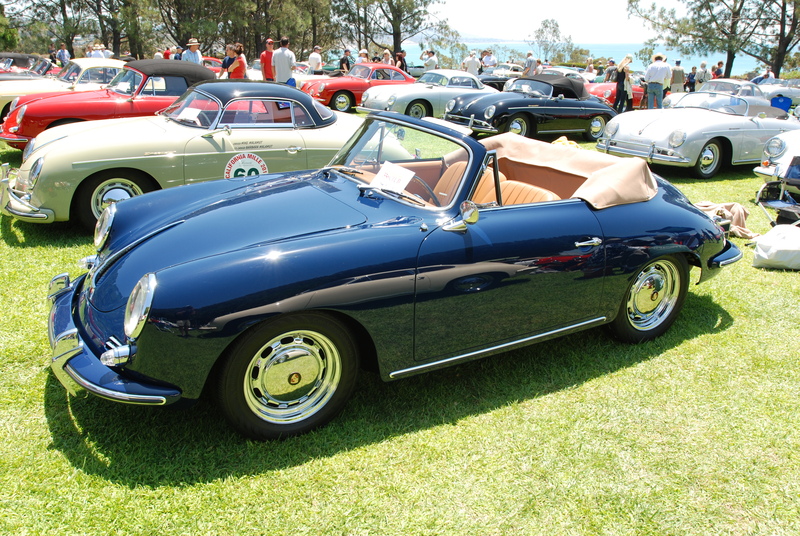 The final awards of the day went to the red 356 cabriolet seen below. 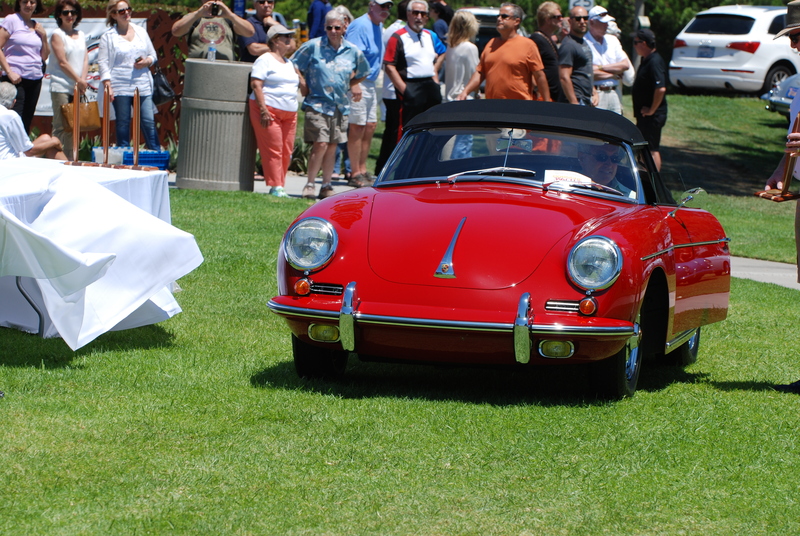 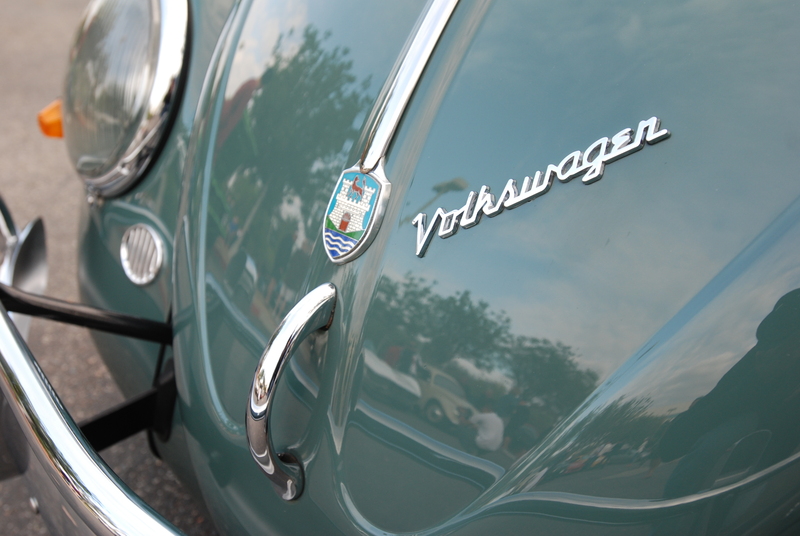 Not only did this cabriolet win best in class, but also received the concours top prize, the Best of Show trophy. 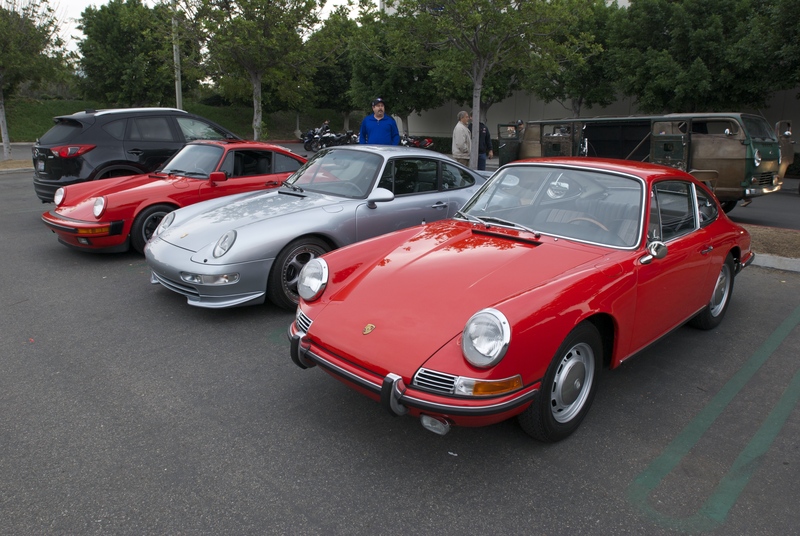 A group shot of the class winning Porsches from this years concours. 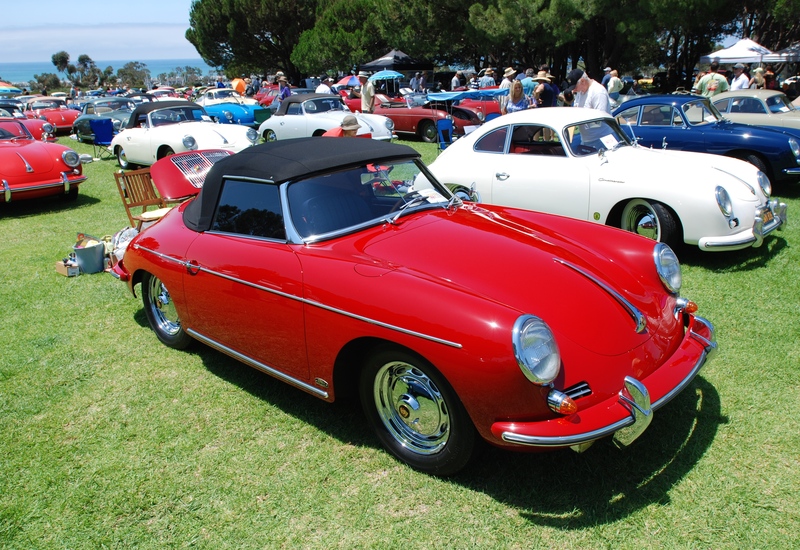 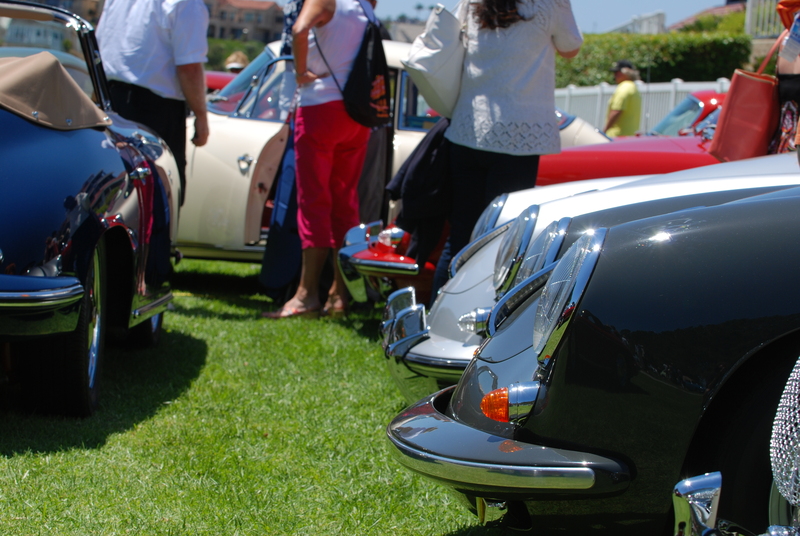 Once all of the winning cars were parked together, it became very apparent that the judges at this years concours had a thing for the color red, given the high percentage of red hued, winning 356s selected at this years show. 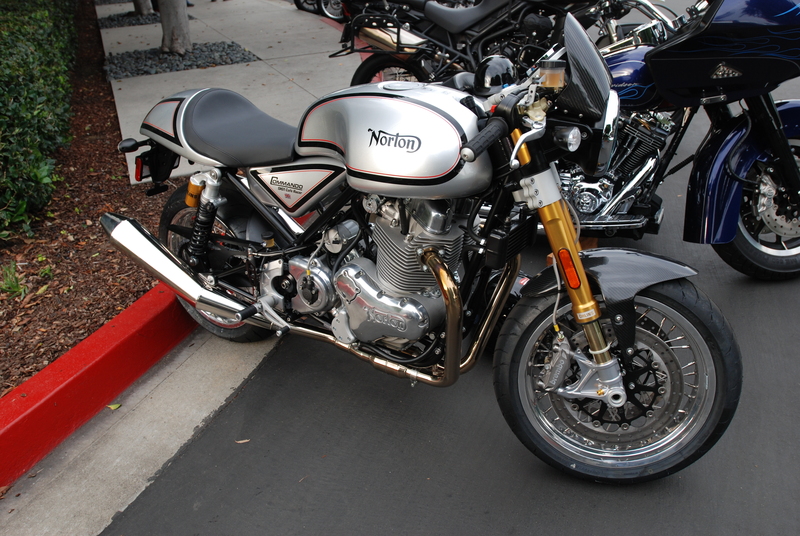 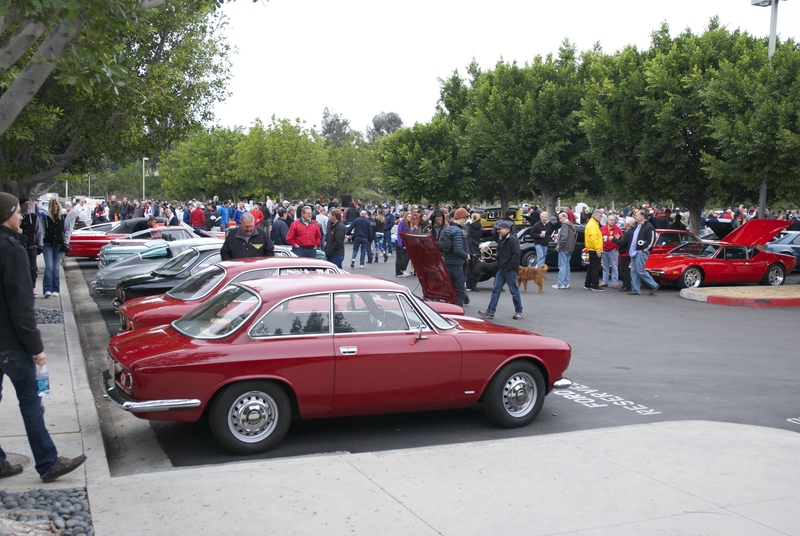 Unfortunately, we’ll all have to wait for the 2015 show, to find out what model and or color will appeal to next years judges, and influence their awarding of the multiple class winners, and the coveted “Best of Show” award. 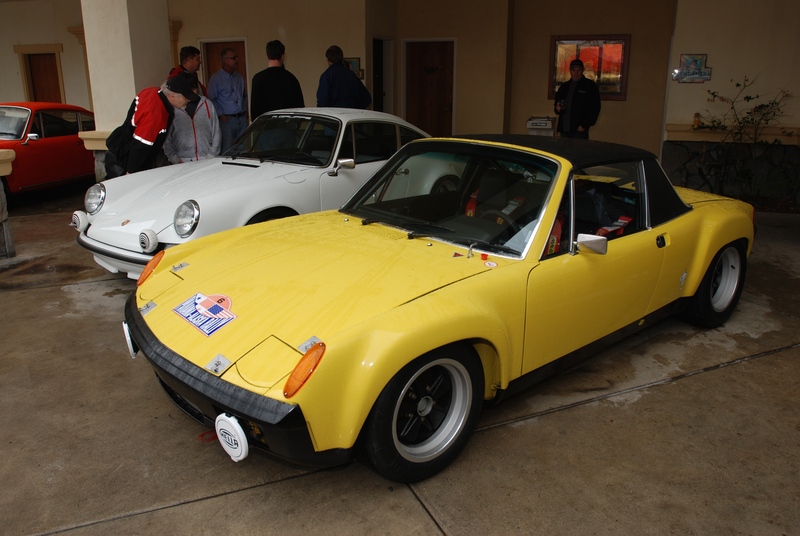 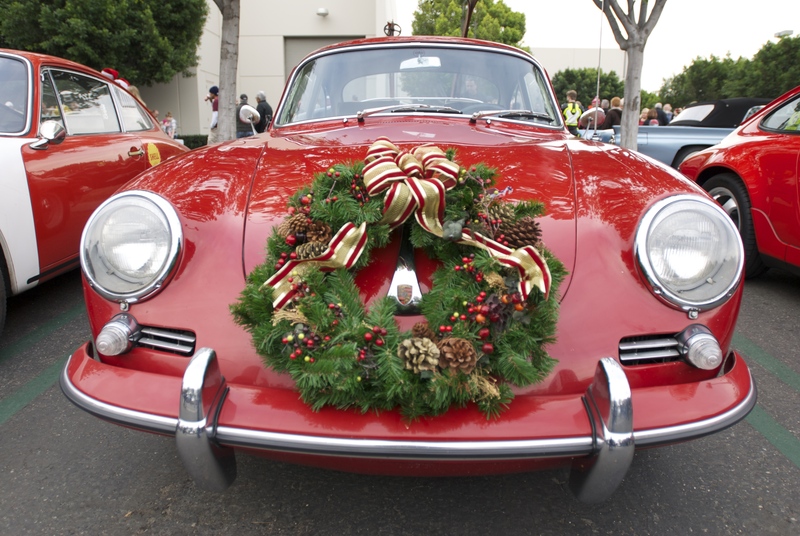 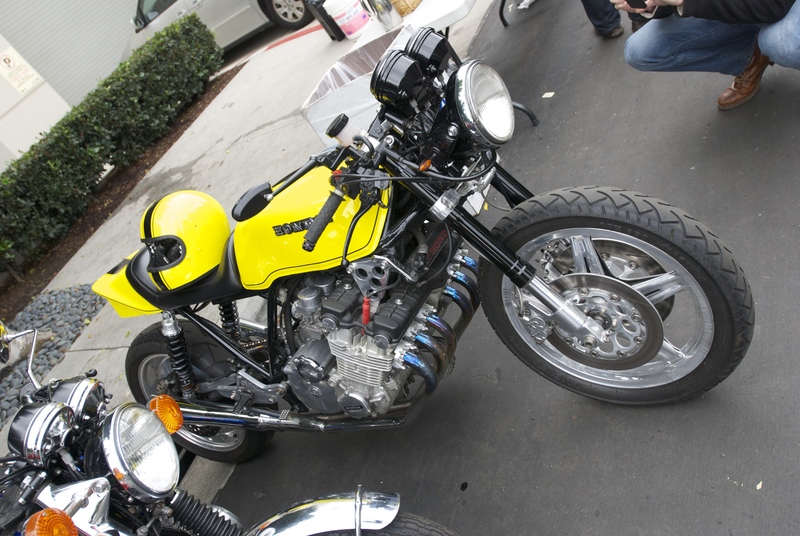 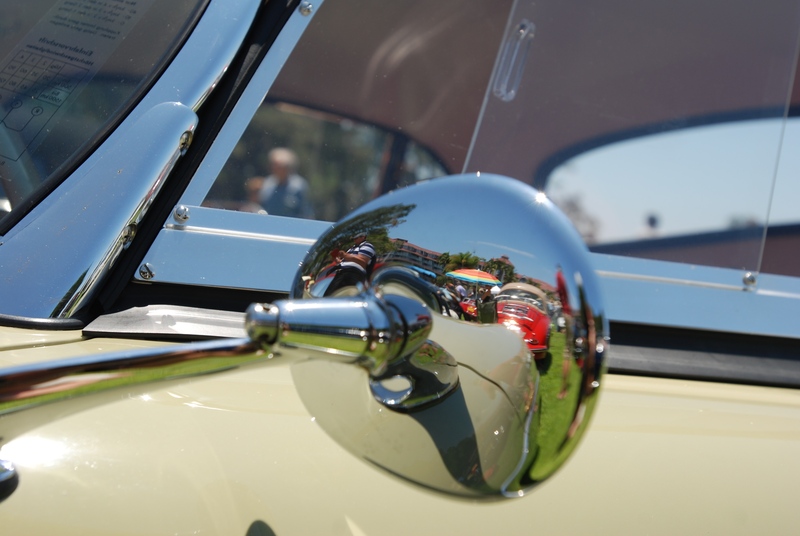 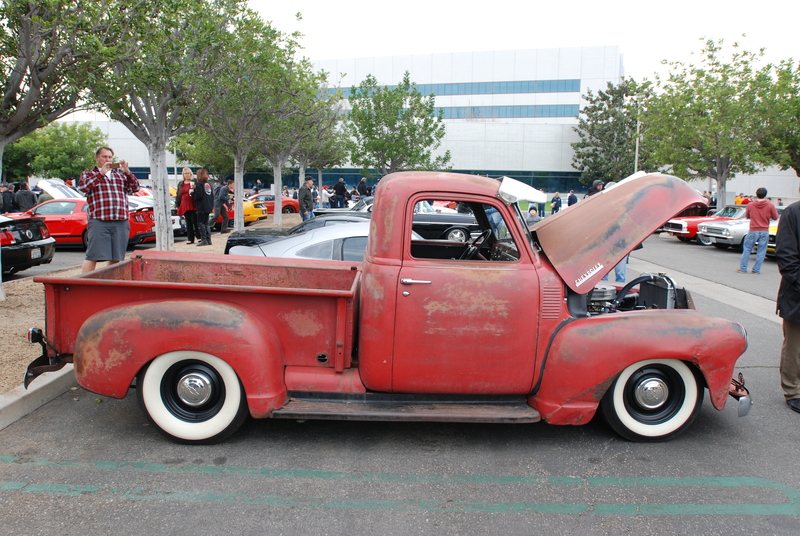 “Thunderstorms hit Southern California”, yet fail to dampen the spirits of those attending the 2014 LA Airport Hilton Hotel Literature and Memorabilia show, and the Phoenix Club’s Porsche show and swap meet. 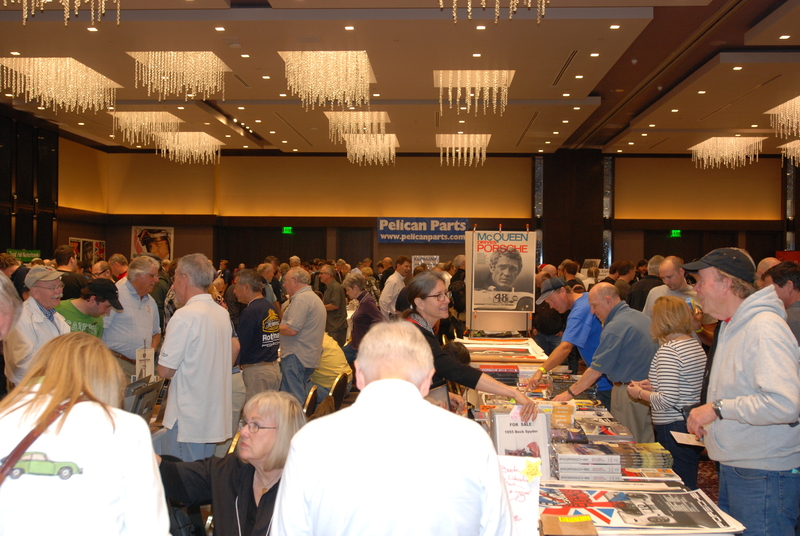 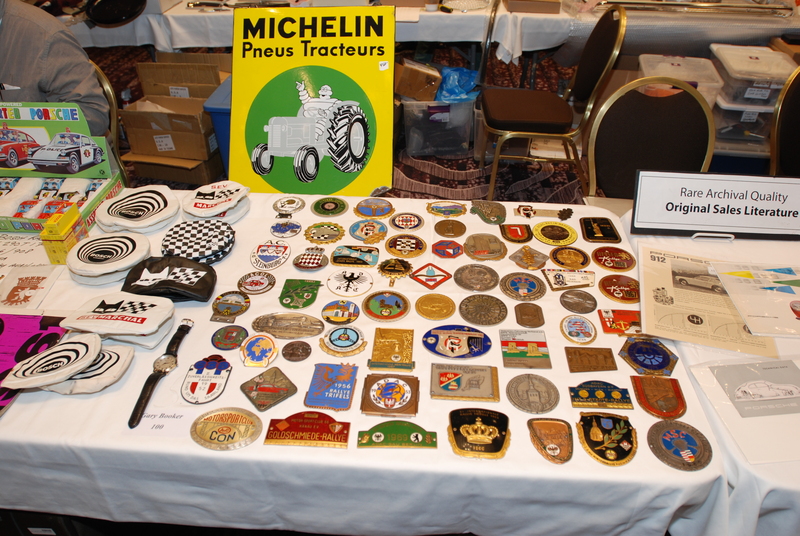 Below is an example of the crowd present for this years LA Airport Hilton Hotel Literature and Memorabilia show. 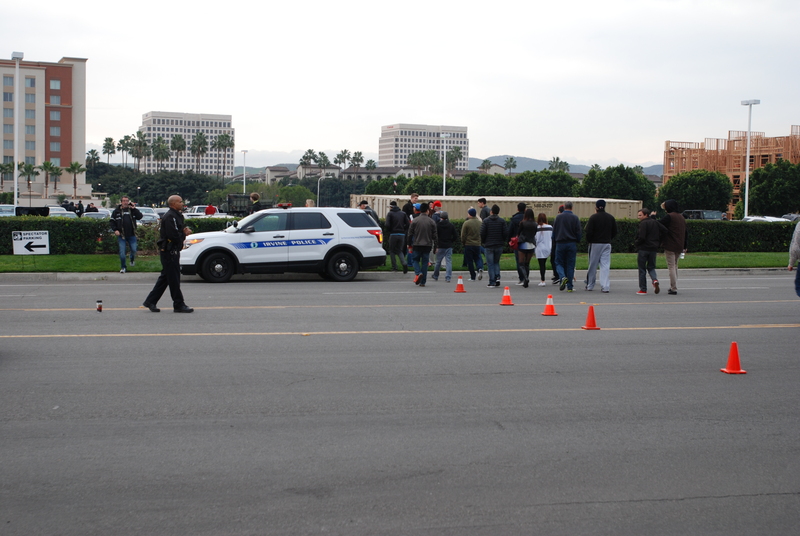 I was told by friends who had arrived early to be part of the paid “early entry” at 7AM, that they had never seen so many people show up for the early entry, and that the crowds at 9 AM were equally impressive. 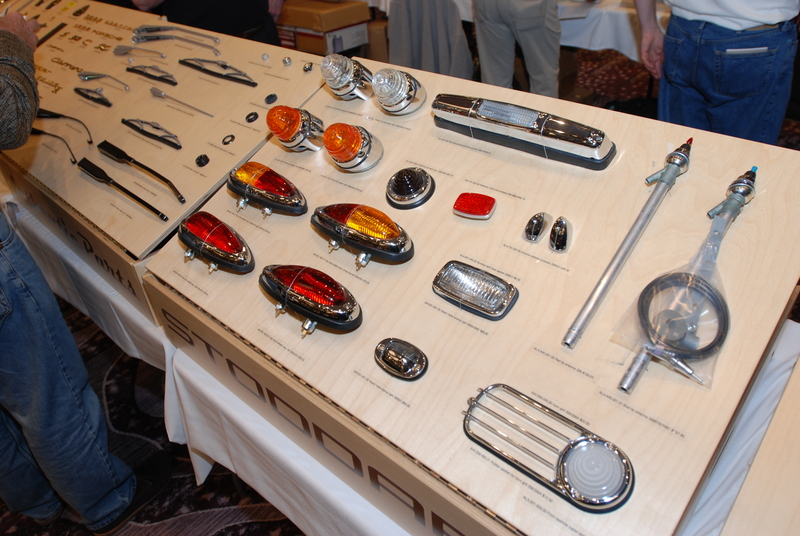 One of several display tables with an assortment of driving lights, fog and tail lights. 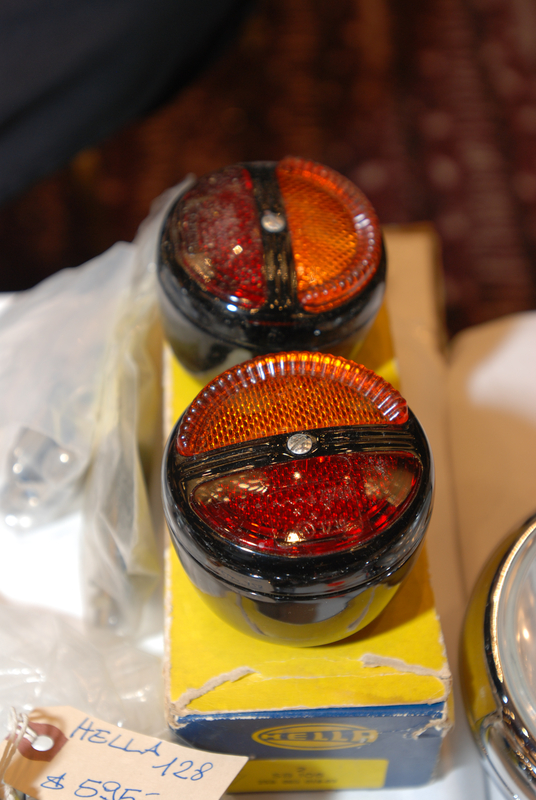 Vintage Hella tail lights, application unknown. 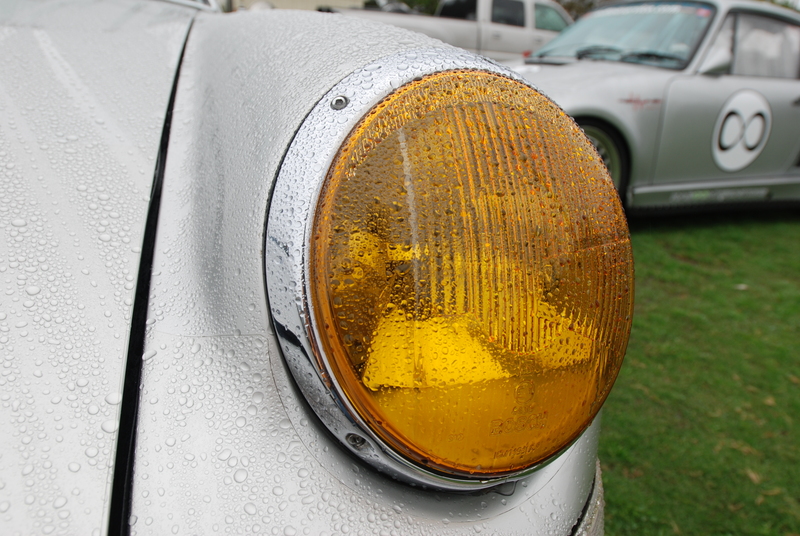 However, the Hella 128 fog lights (as noted by the price tag seen below) were optional on Porsche 911s dating back to 1966. 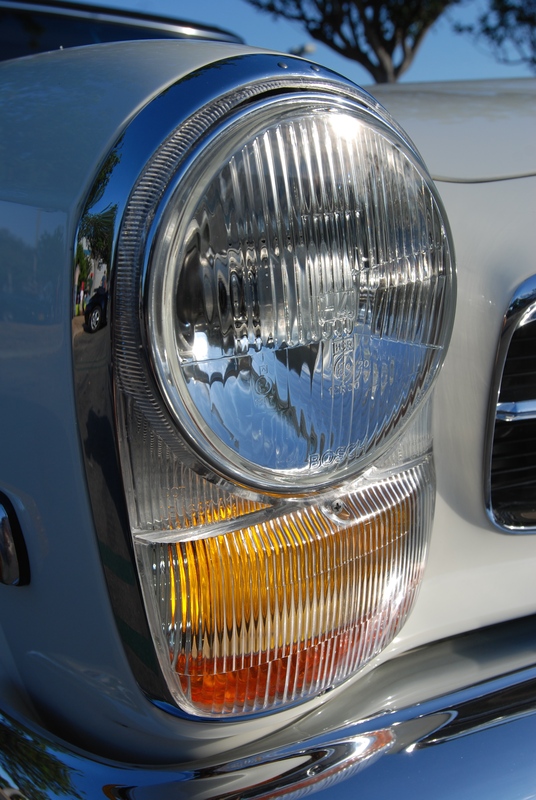 It pains me to see the current asking price for a set of 128s, especially since I sold a pristine pair to a friend back in 1973 for $45. 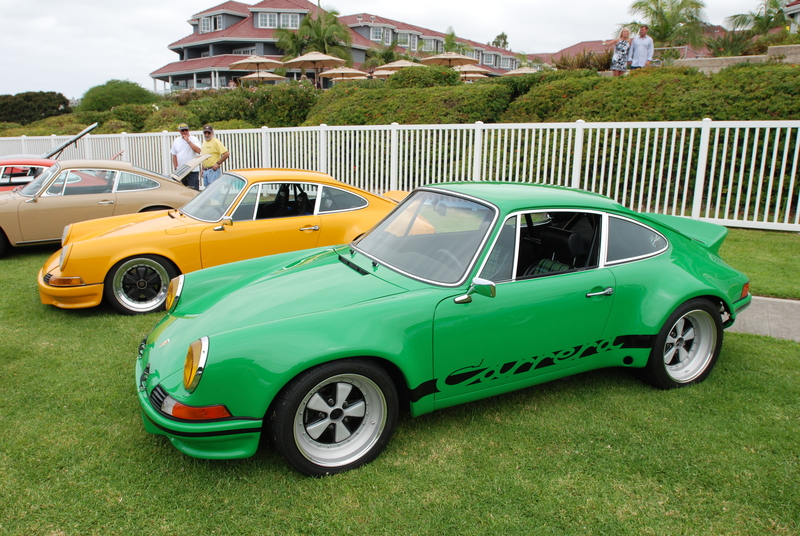 all very cool and expensive, with each possessing unique detail and color. 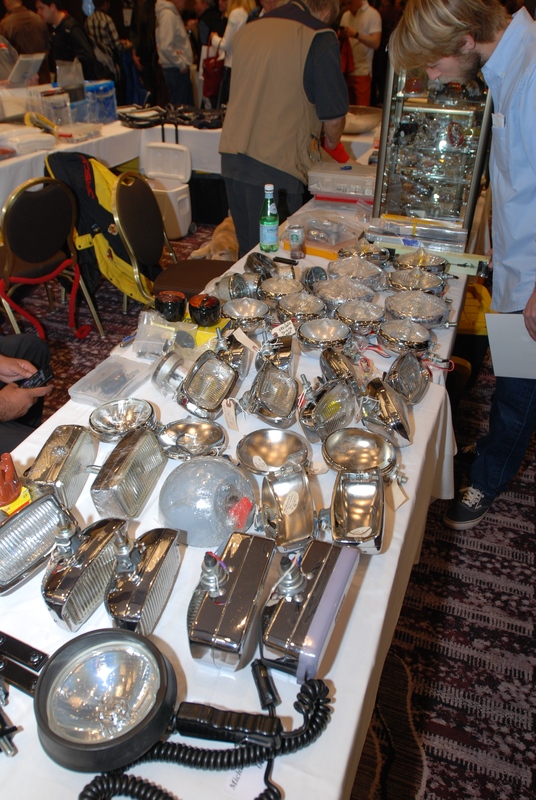 One of the nicest Porsche parts displays present (seen below), showcasing an unrivaled variety of Porsche 356 parts for sale, presented by the firm Stoddard NLA-LLC. 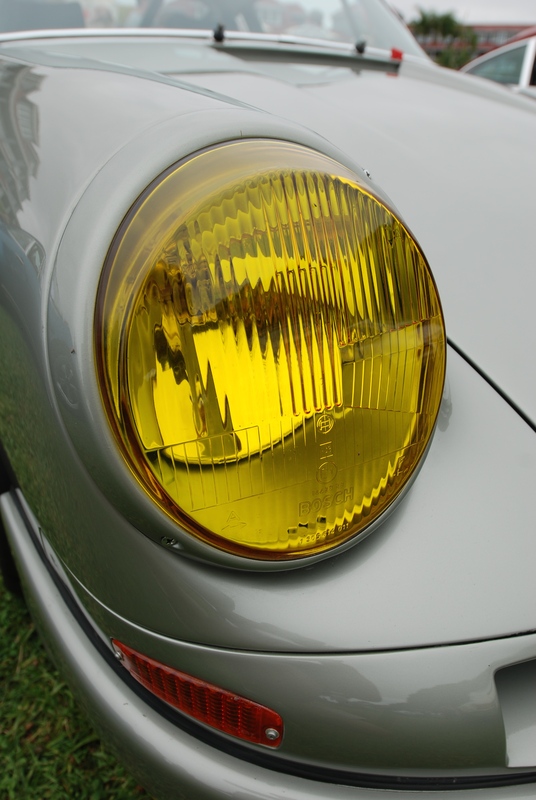 An early 911 headlight (below), equipped with a European spec, amber French lens. 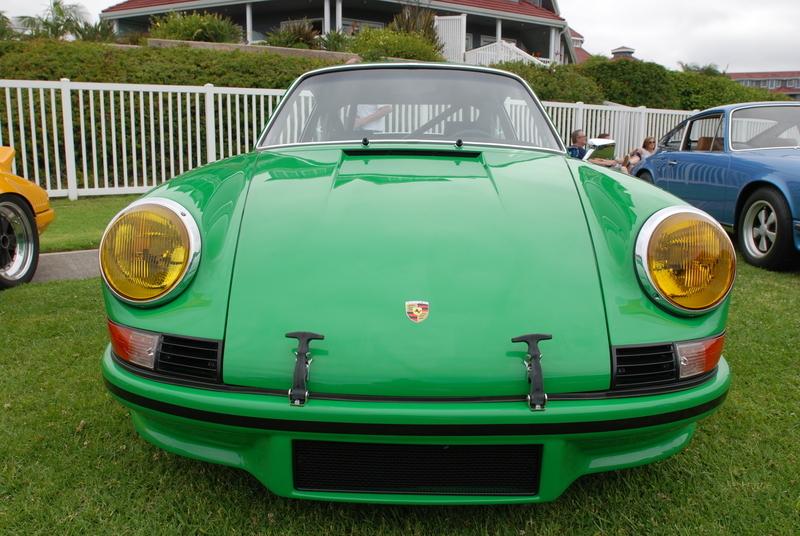 One highly visible, glow in the rain Porsche 930 turbo. 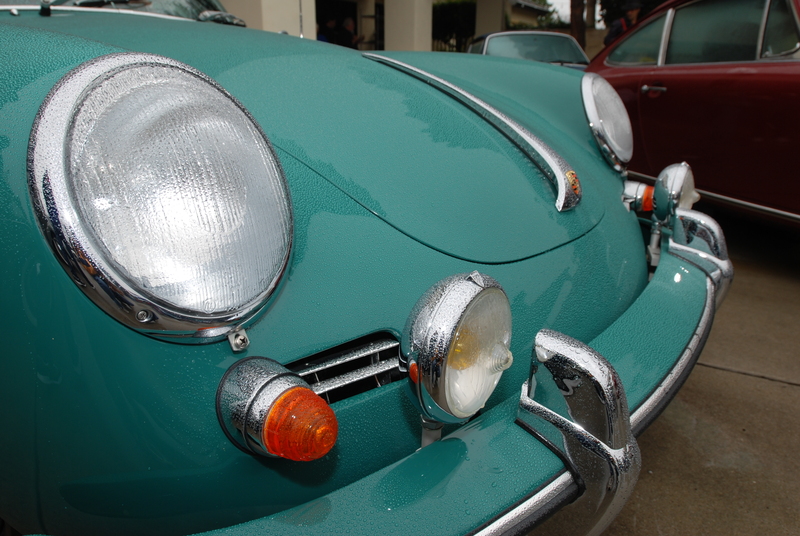 One of the Porsche 356 representatives present, showing no apprehension regarding the morning rain. 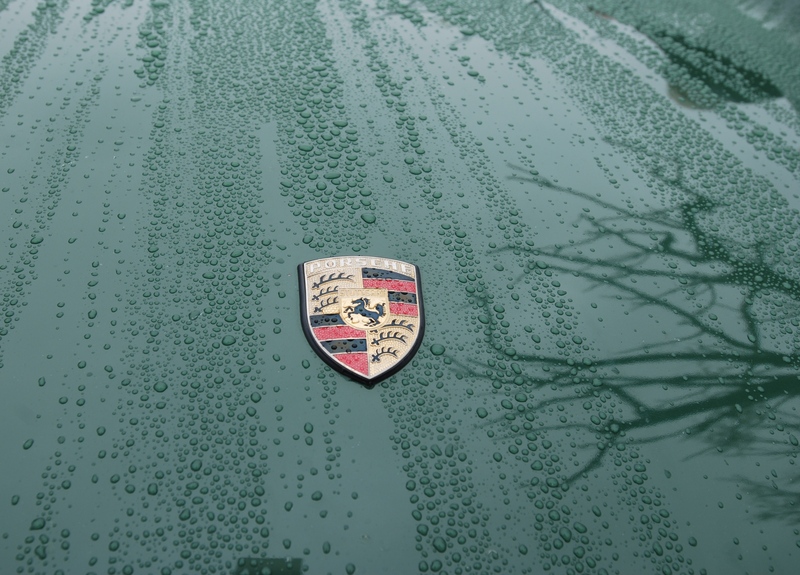 Proof that water does bead up on highly waxed surfaces. 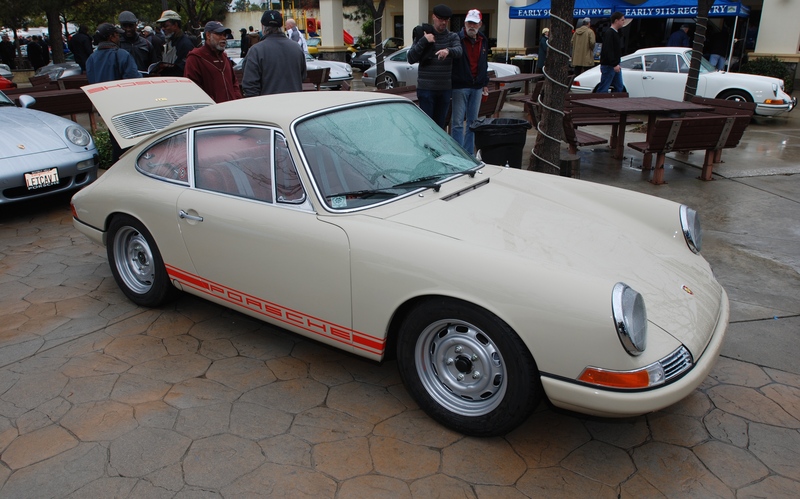 Representing the early long hood community, was this beautifully prepared Beige Gray 1968 Porsche 911. 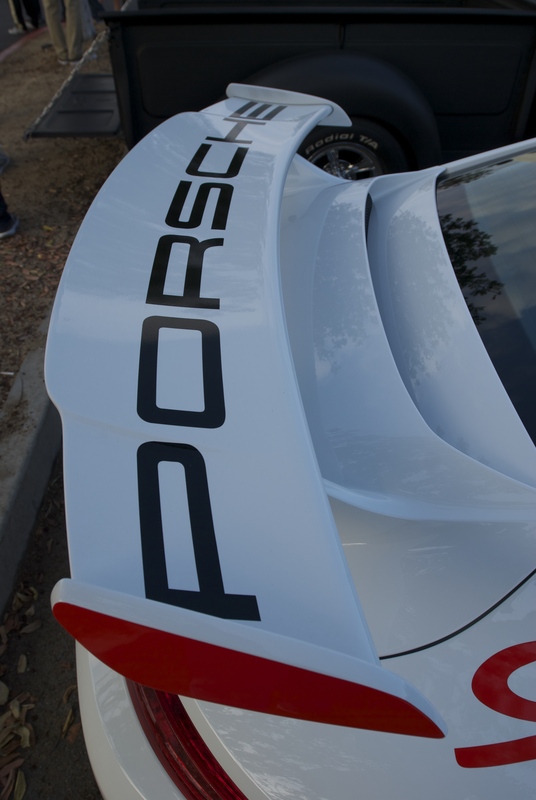 Rear decklid and side stripes with a rally sport inspired graphic treatment; could these graphics be the handiwork of werkcrew founder Bob Tilton? 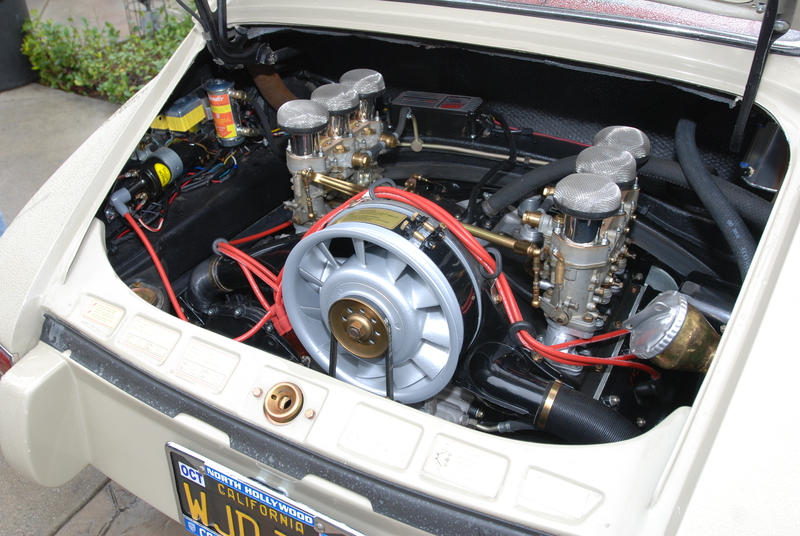 The equally impressive, rally / race inspired motor. 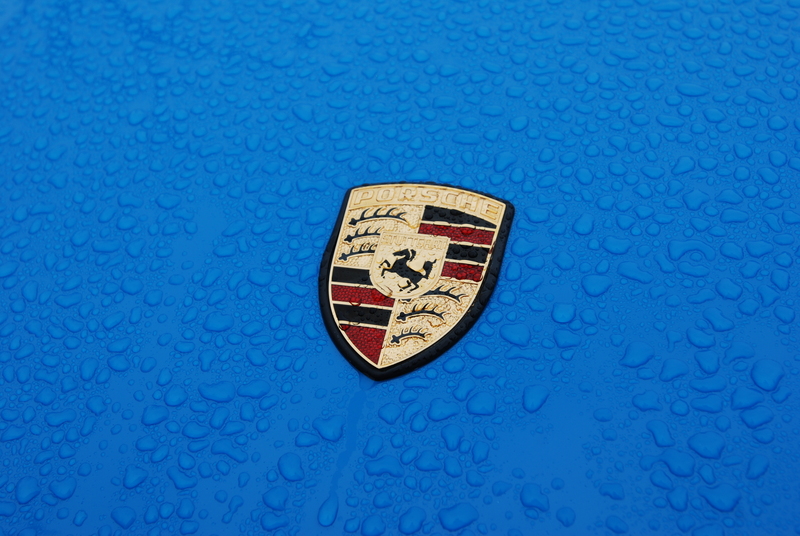 and the rest of the car covered by the morning rain. 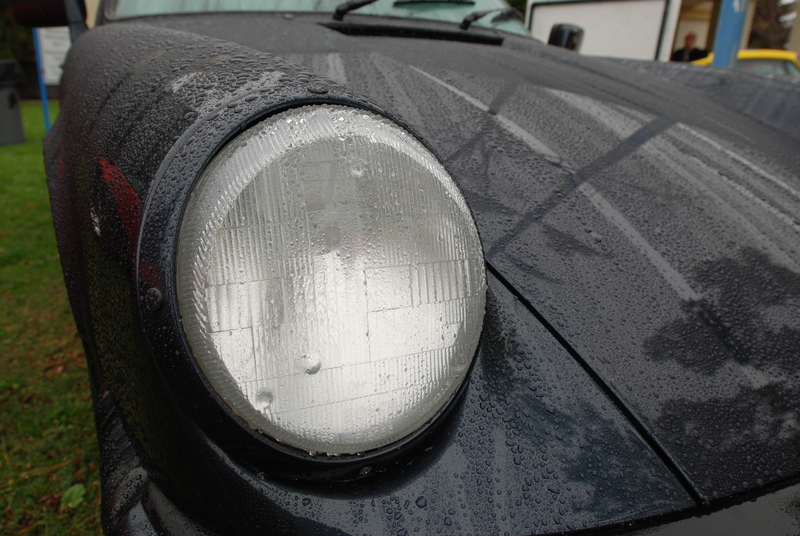 Several of the early morning arrivals, parked up close to the building and protected from the majority of the rain showers. 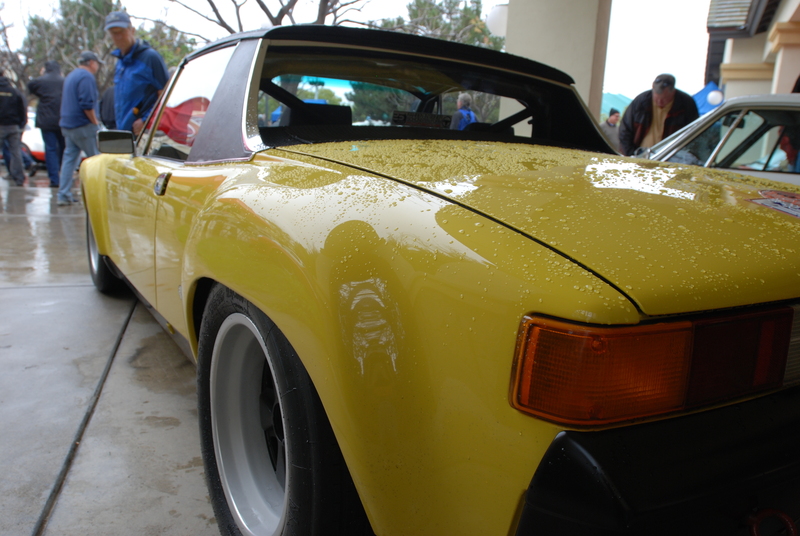 The real deal; a close up view of true 914-6 GT factory fender flares. 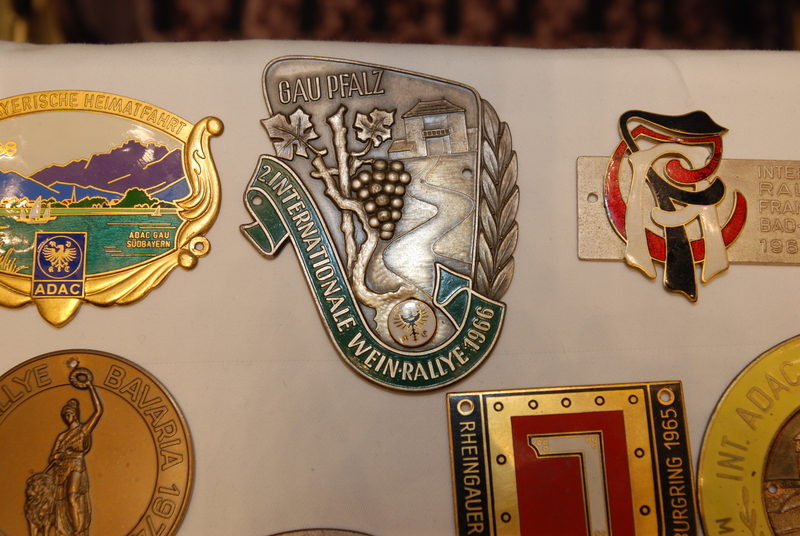 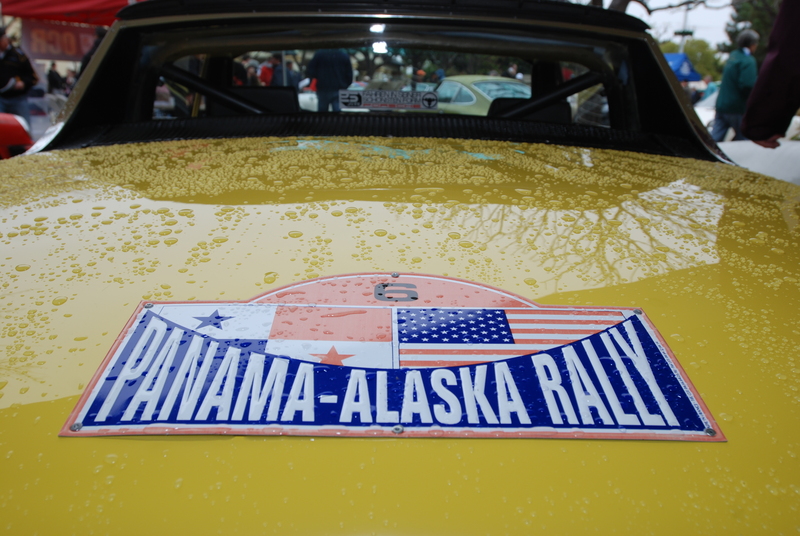 Proof of this vehicles pedigree; a record of its previous participant and survivor status in the Panama / Alaska Rally. 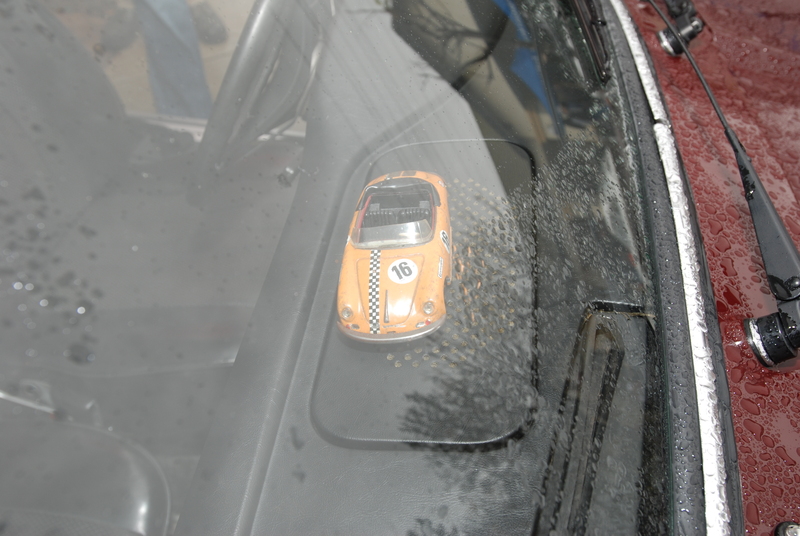 complete with a recent acquisition by the owner, proudly displayed on the dash. 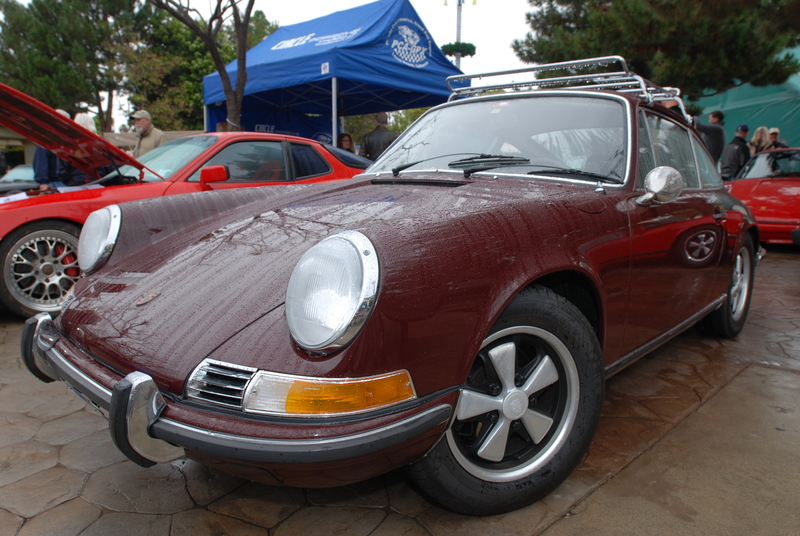 This burgundy 911S was also one of the few Porsches at the show equipped with a roof mounted, Leitz brand luggage rack. 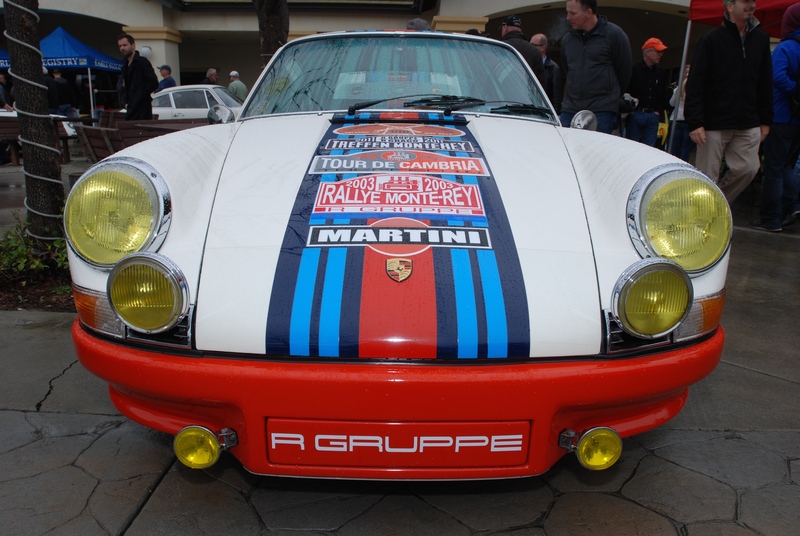 One of the local RGruppe members, displaying a variety of magnetic vinyl club event plaques on his front hood. 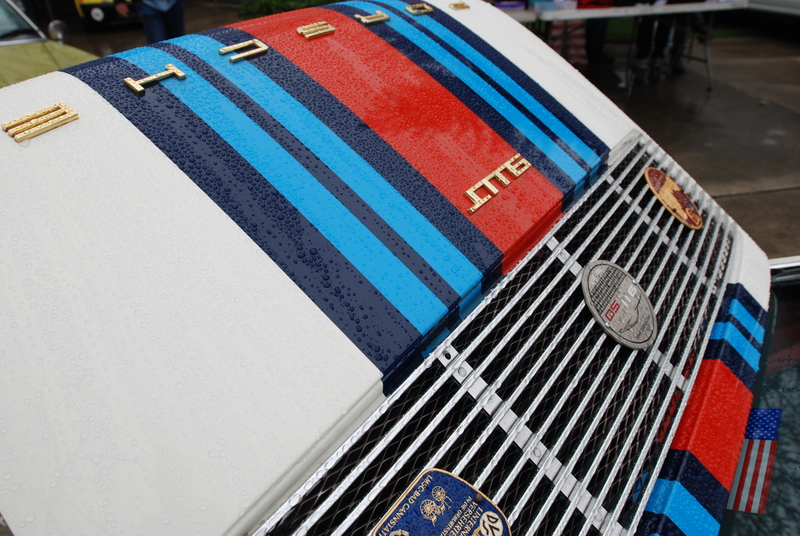 One rain-soaked rear decklid, wrapped in Martini racing graphics. 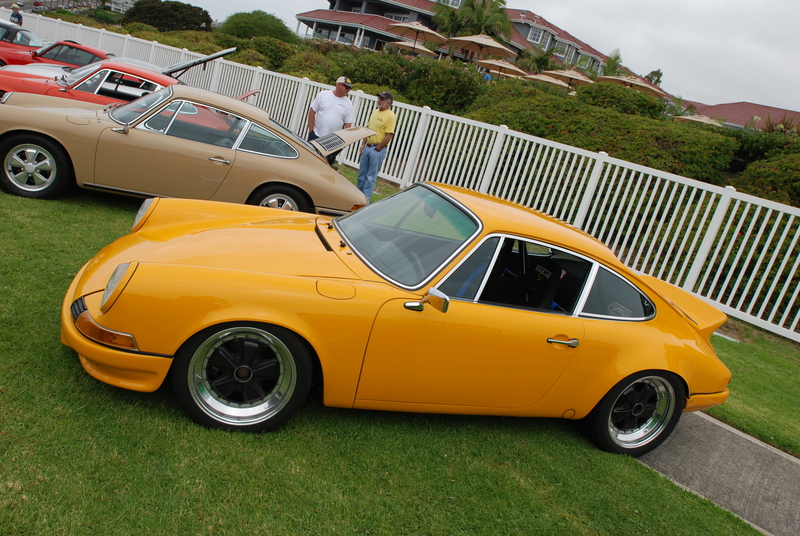 on what initially appeared to be an early 1970s vintage Porsche 911. 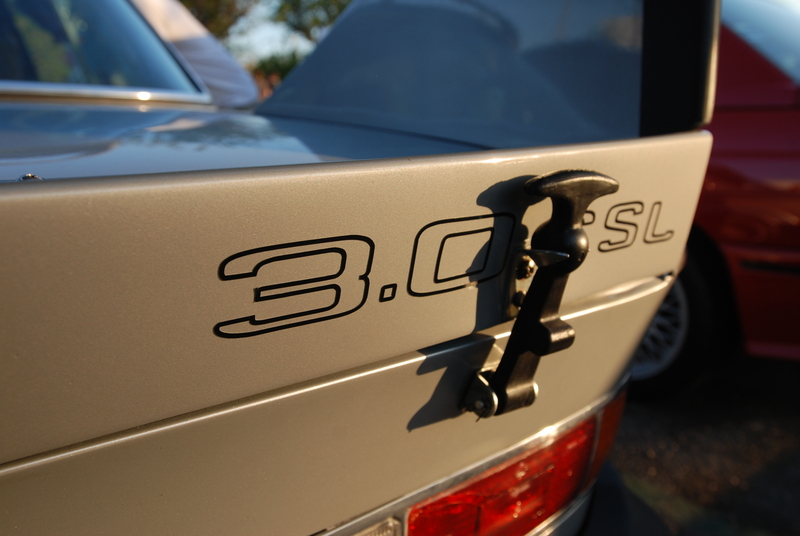 However, upon closer inspection it became obvious that this car was actually a wolf in sheep’s clothing. 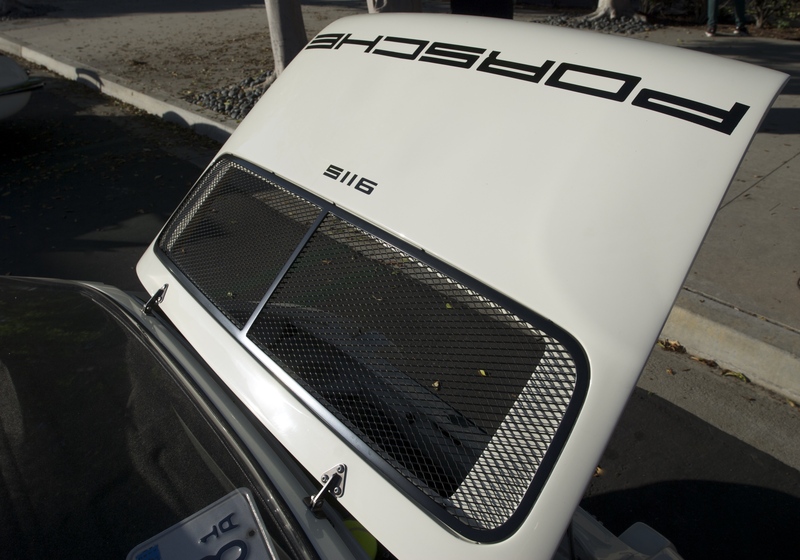 Concealed beneath its skin lurked a 1986 3.2 liter, Porsche 911 Carrera having undergone a conversion known as “backdating”. 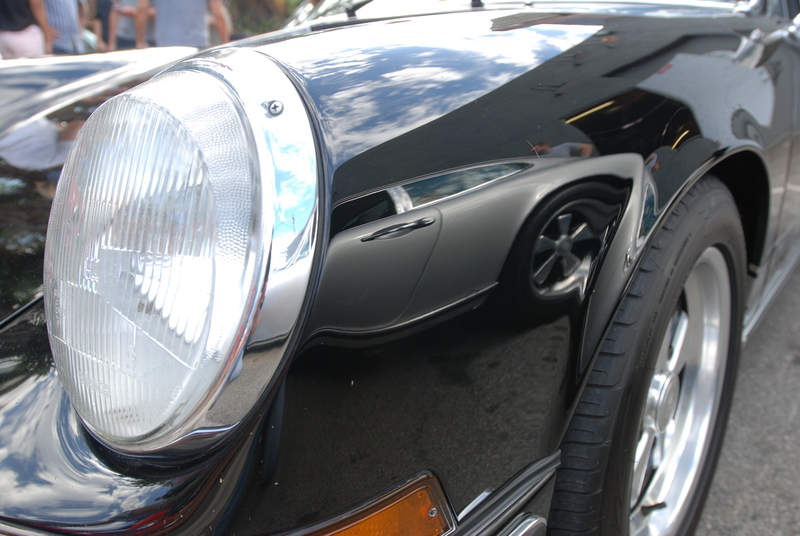 That effort combined with the visually correct, optional front and rear bumper overriders, created a convincing 1970s appearing Porsche 911. 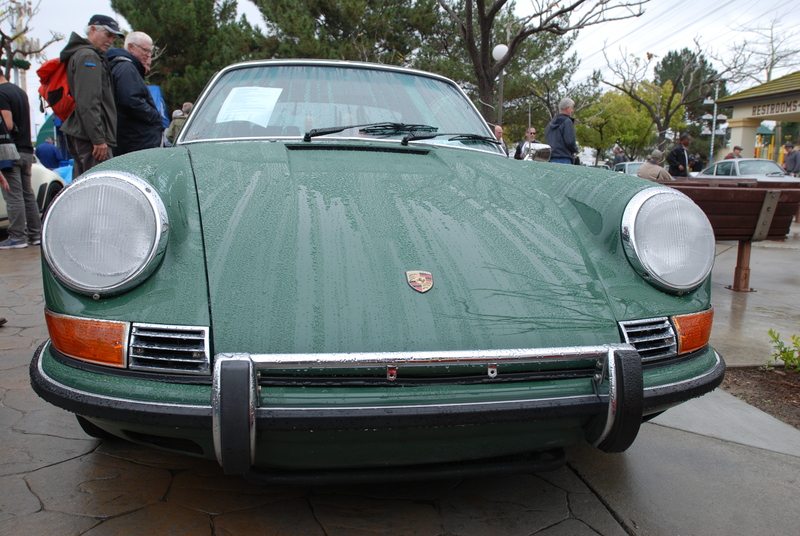 A convincing re-spray, in period correct Irish green. 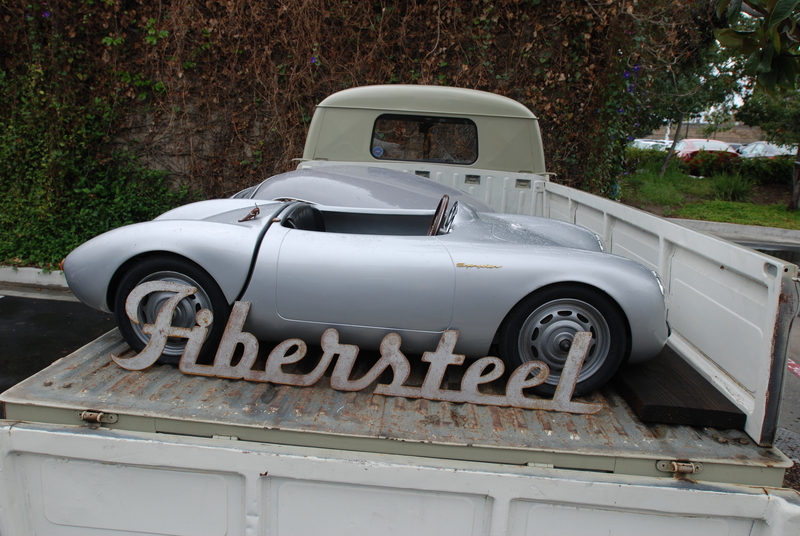 One of the apparent casualties of the morning rain; a shrunken Porsche 550 Spyder, reduced in size and now able to fit into the bed of a single cab VW type 2, being displayed by the folks from fibersteel. 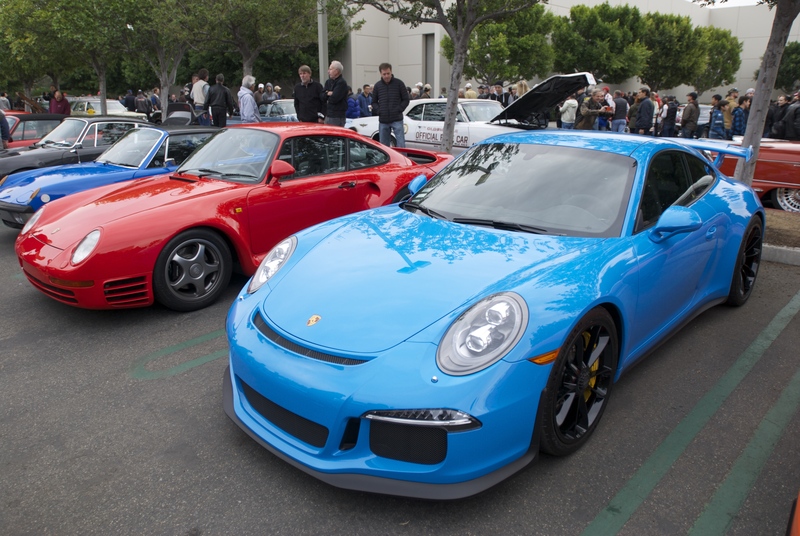 Even with rain impacting this years event, there was still a huge turnout, illustrating the impact that this event holds for the Southern California Porsche community. 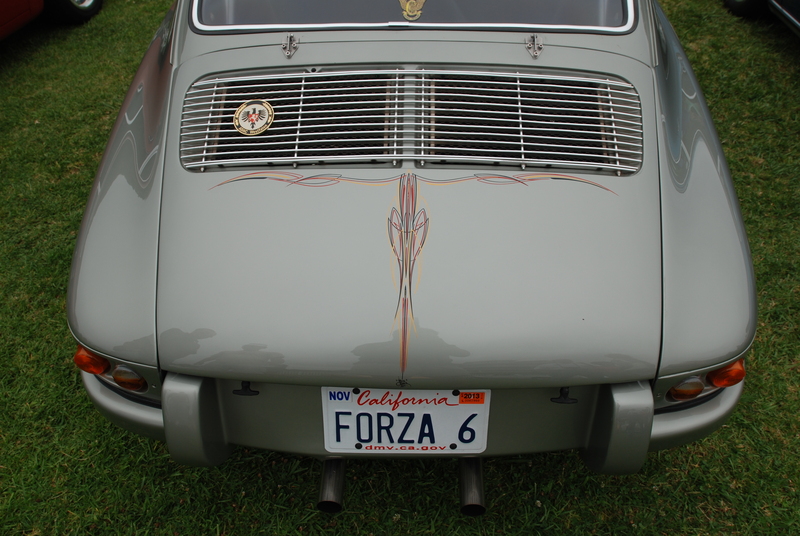 And based upon the variety of different foreign accents overheard during the weekend, it’s easy to see the wide reaching pull that this event has on Porsche fans from around the globe.